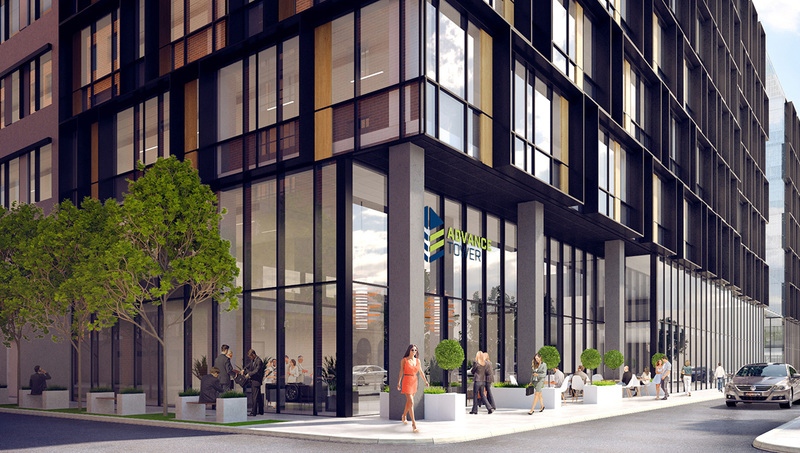 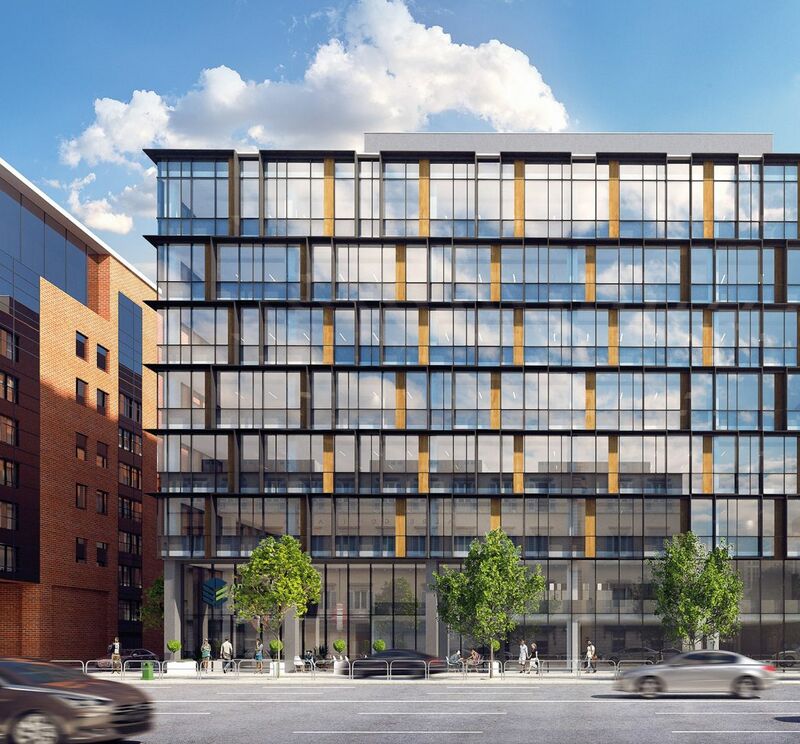 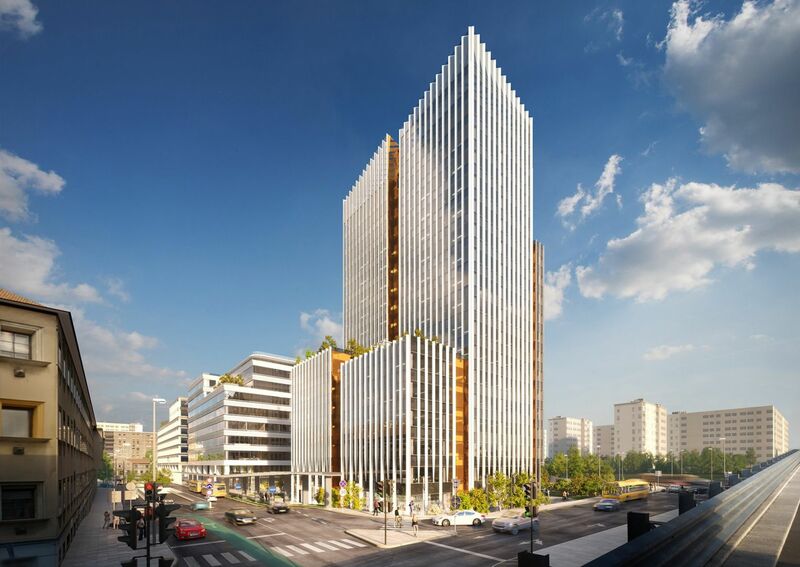 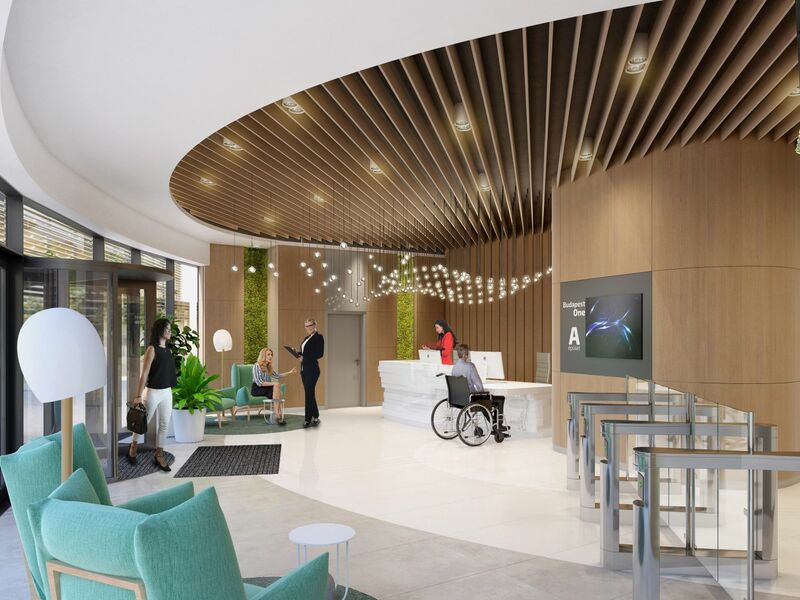 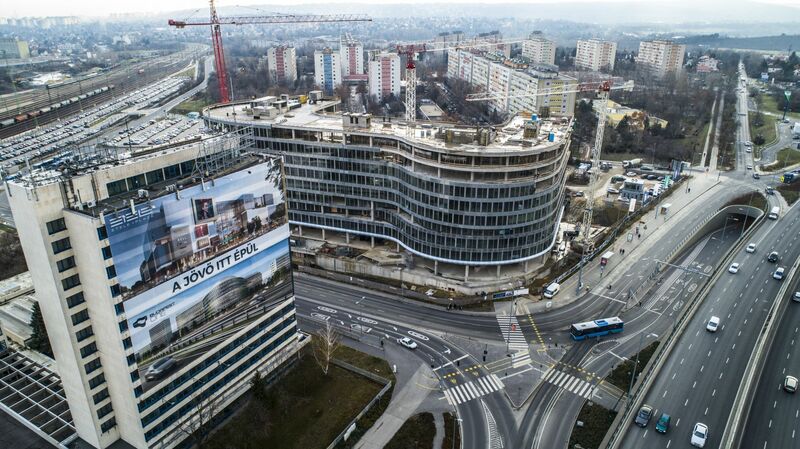 Advance Tower phase 1, which has already received the international WELL Building Platinum pre-certification, is being built at the popular office location of Budapest, the Vaci street corridor. 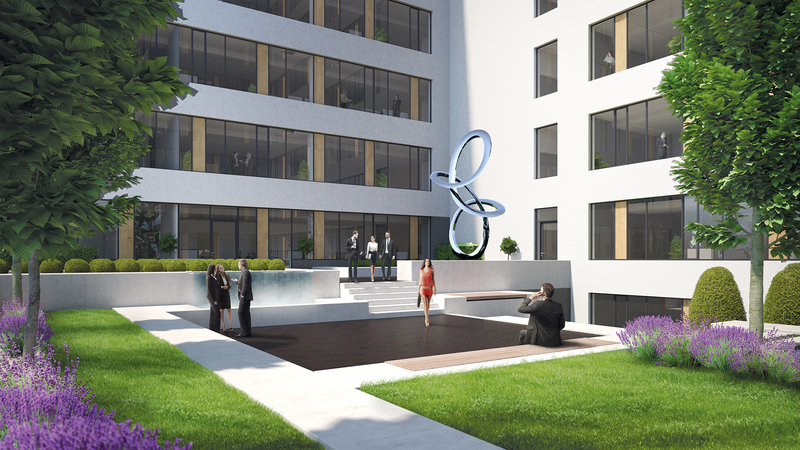 The 12 100 sqm of GLA of the ‘A’ category office building offers an inspiring environment for creative and productive work. 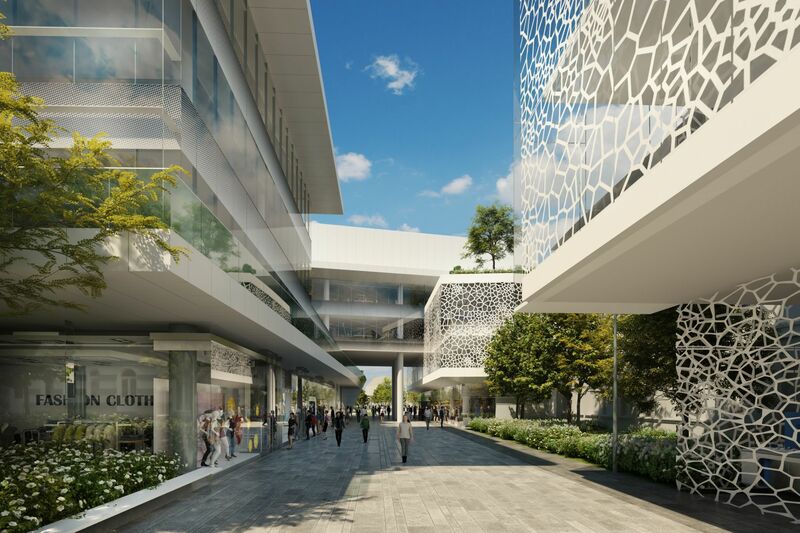 The 7 881 sqm phase 2 is also under construction. 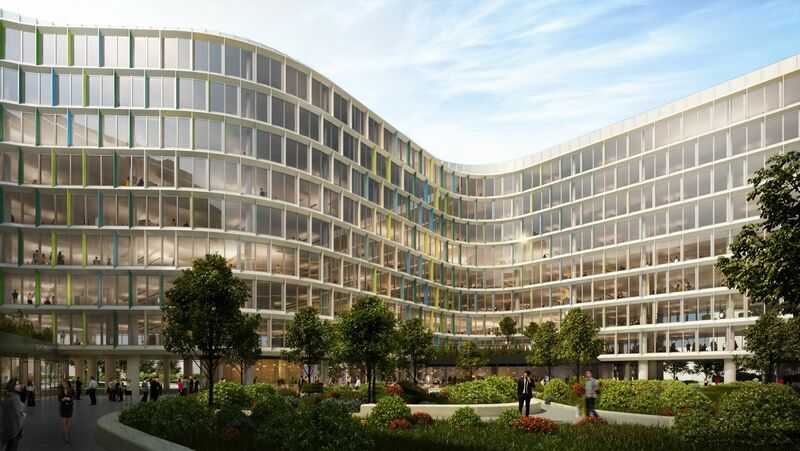 Both phases are being built based on sustainability and environmental consciousness. 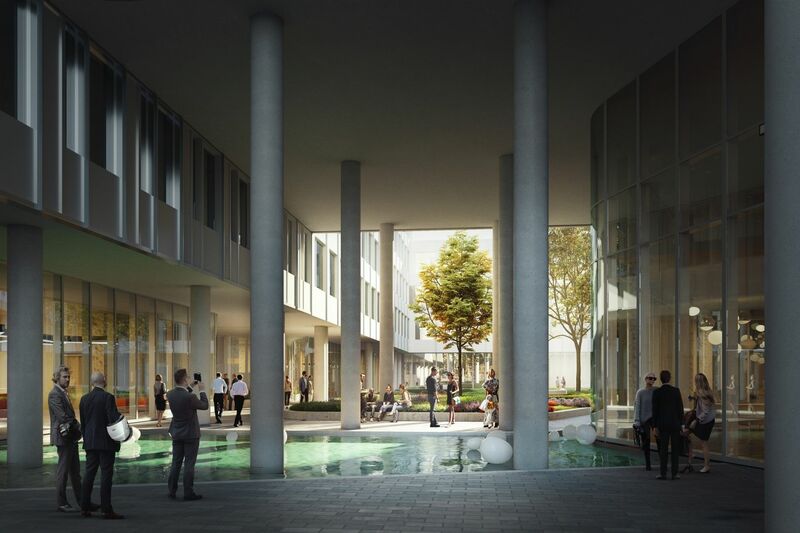 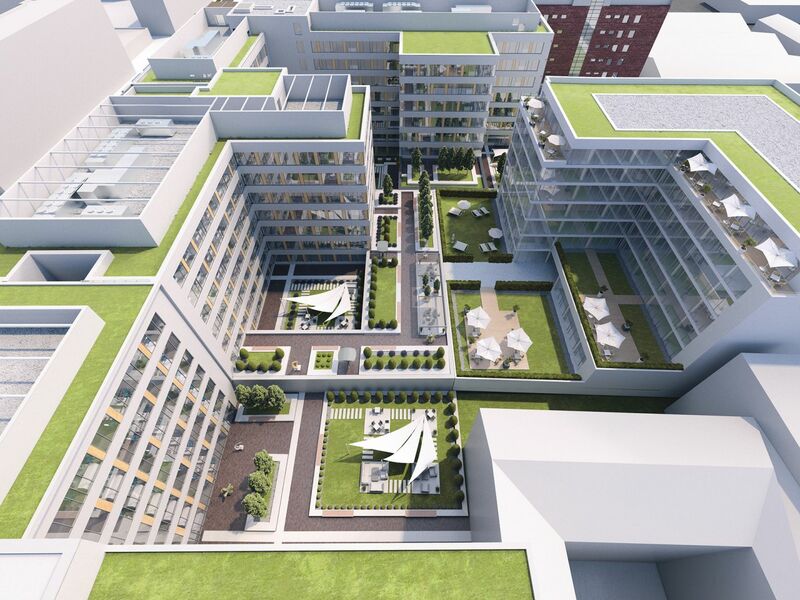 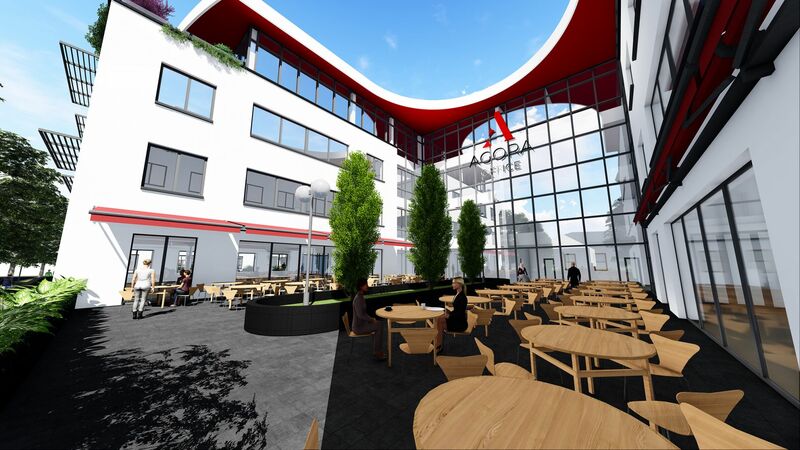 AGORA is a new city centre in the heart of the Váci Office Corridor with sustainable, contemporary architecture, welcoming green areas and spacious community places: a landmark that truly connects business and lifestyle. 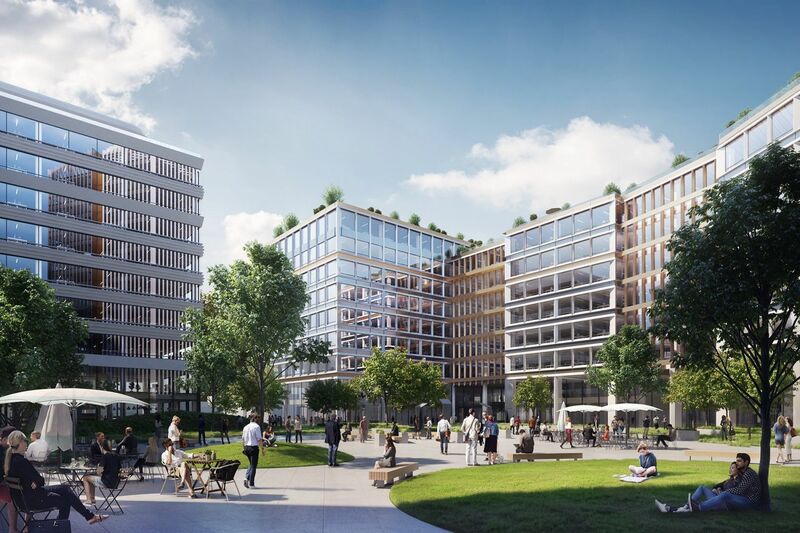 Masterminded by MAKE Architects from London and the Hungarian FINTA Studio, the development will comprise more than 130,000 sqm of premium offices and large variety of amenities. 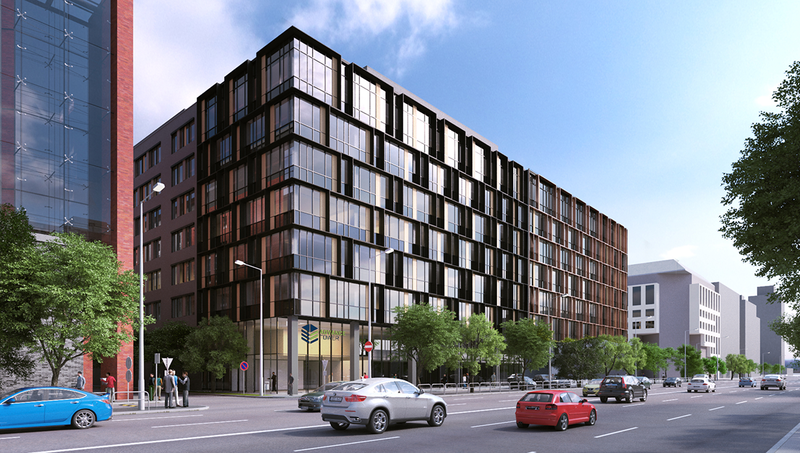 The first building of the project is scheduled for the end of 2019. 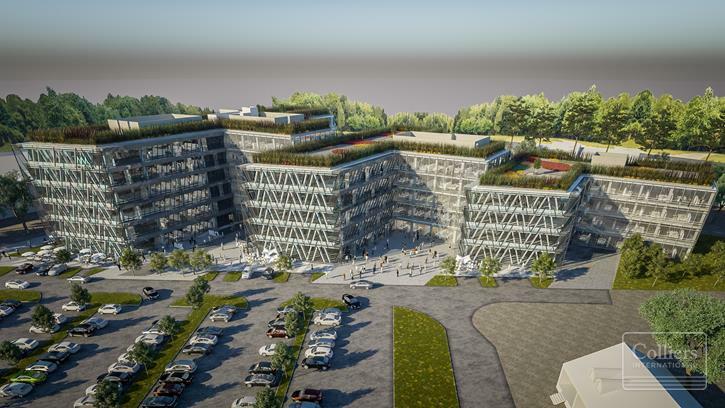 Aréna Business Campus is an A+ category complex and will offer 72.000 m2 office space. 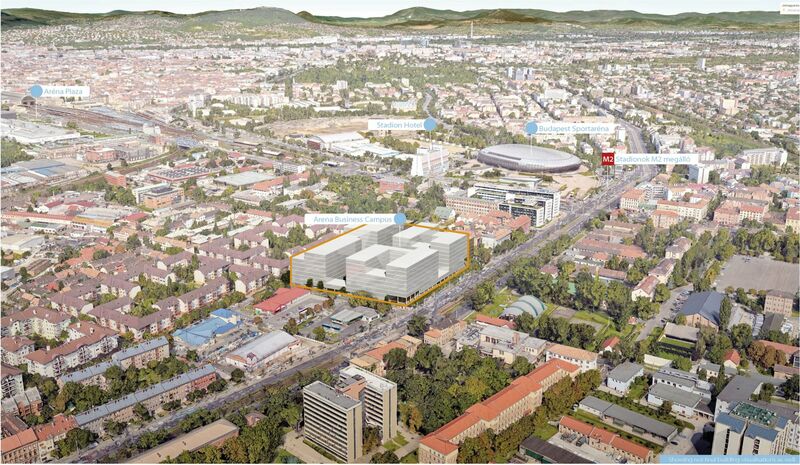 It will consist 4 buildings, with an exceptional proportion and significance of green areas. 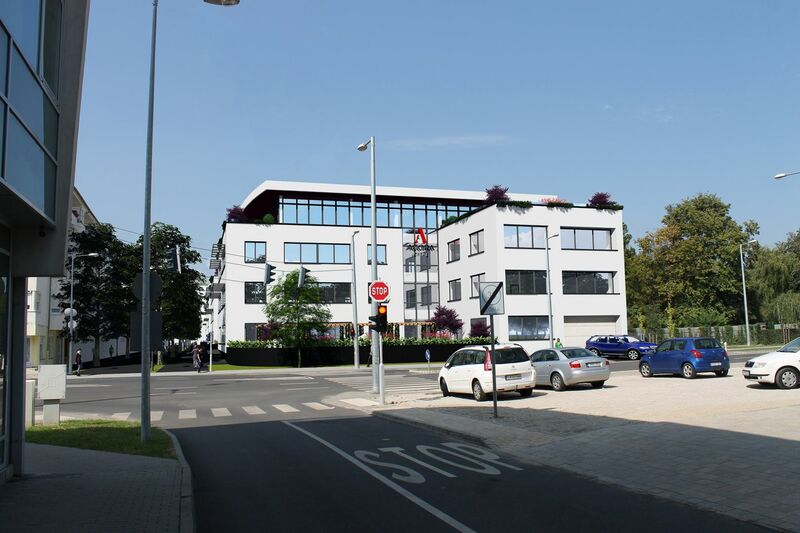 The location is excellent, the property is in a few minutes walking distance from the metro station. 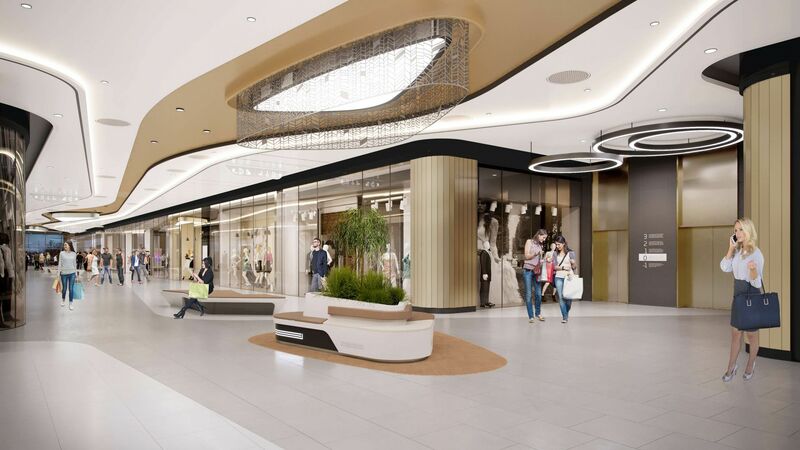 The place is also close to Aréna Plaza Shopping Mall, furthermore, the services offered in-house, and social and recreational areas will play a significant role. The 65 400 sqm office park, that has already received the international WELL Building Platinum pre-certification, has a unique facade and structural design and is located in Őrmező, Budapest. 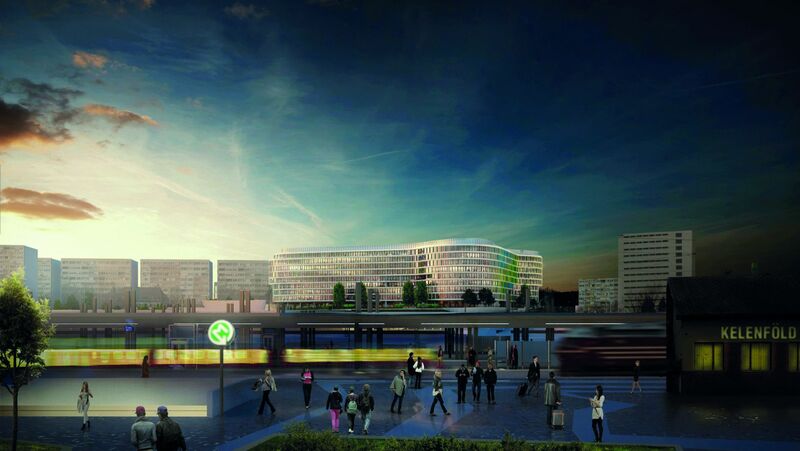 The area is easily accessible and contains Hungary’s largest multimodal transport intersection. 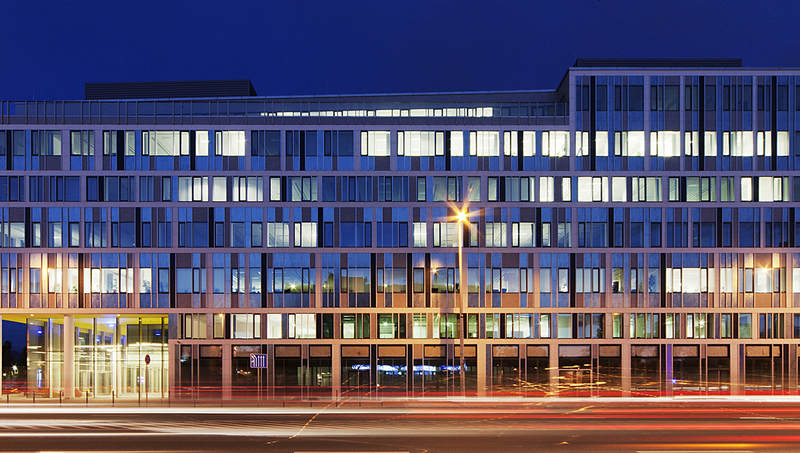 The city centre can be reached via direct links in under ten minutes. 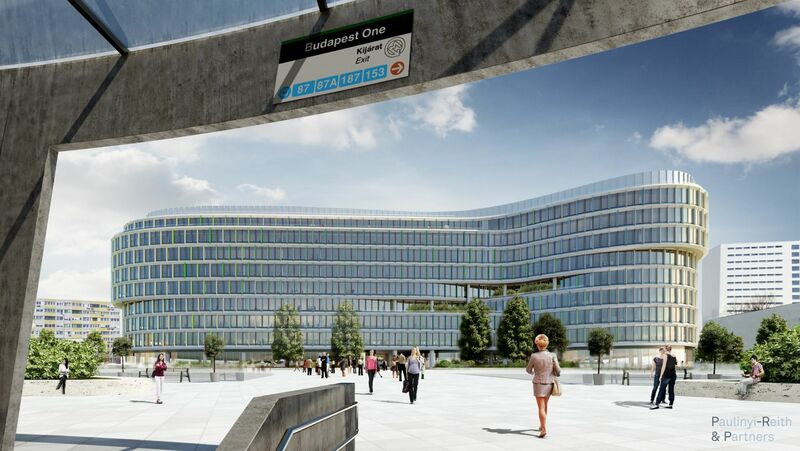 The outstanding service environment of the offices will be further enhanced by the ongoing development of the Kelenföld district. 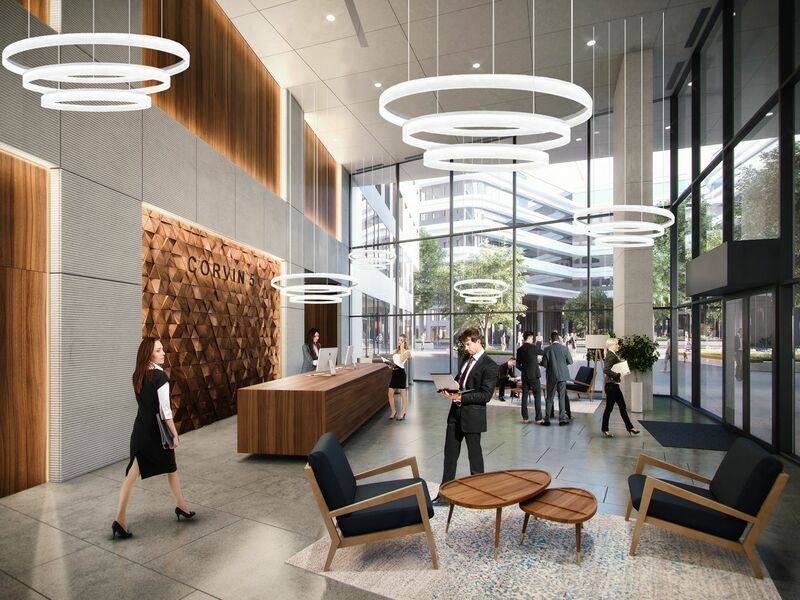 The 27 390 sqm Corvin Technology Park is being built at the internationally renowned and awarded Corvin Promenade. 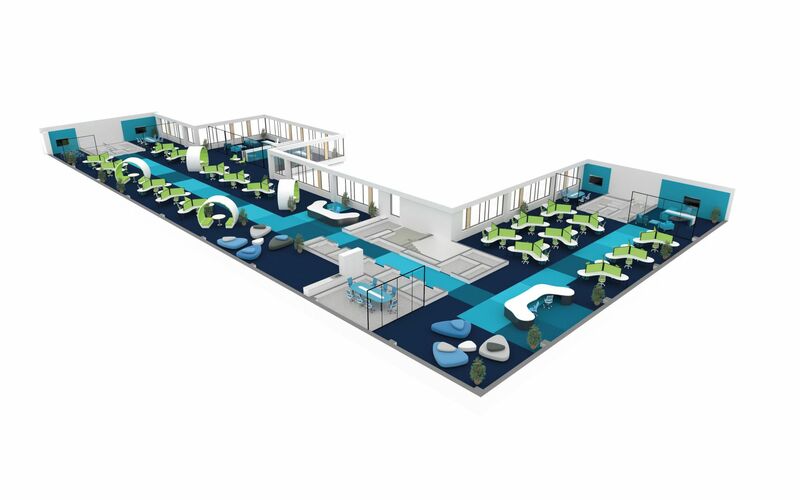 Futureal made sure the facility was equipped with enhanced electricity capacity and a dual power supply to ensure there is never any downtime, a vital factor for technology companies. 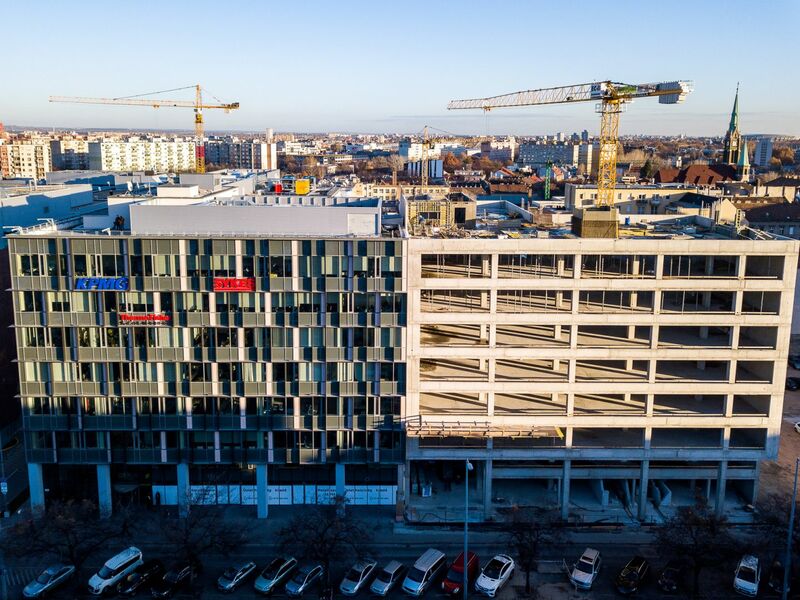 Corvin 5 office complex is the first building in Hungary and the second in Europe to receive the international WELL Building Platinum pre-certification. 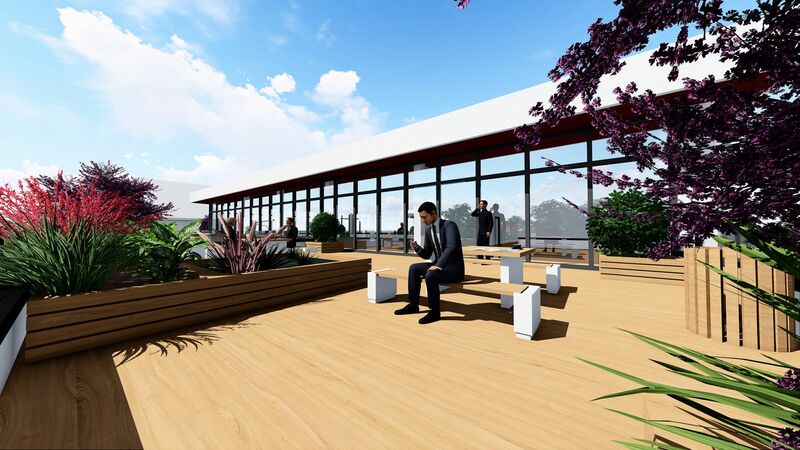 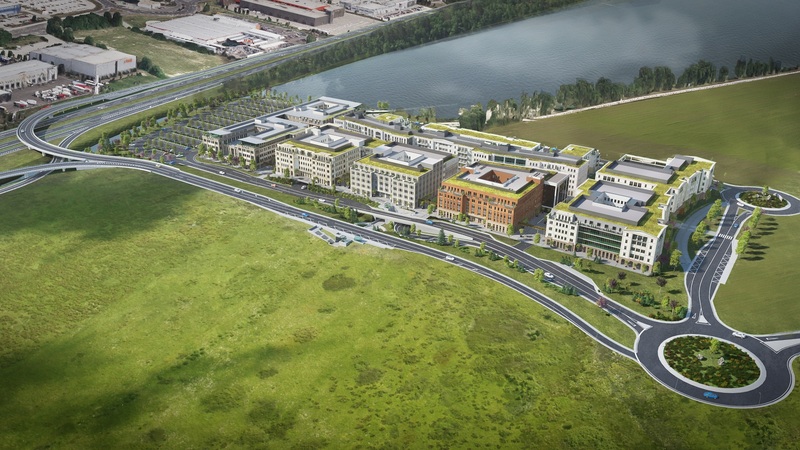 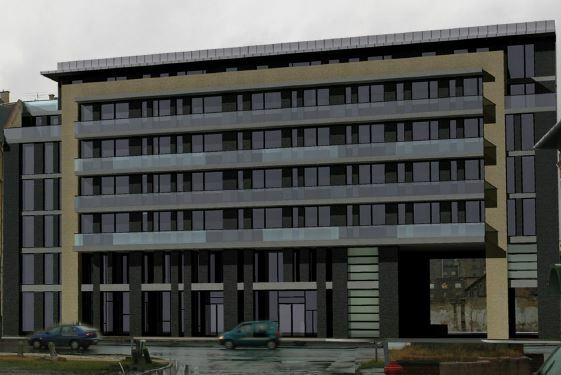 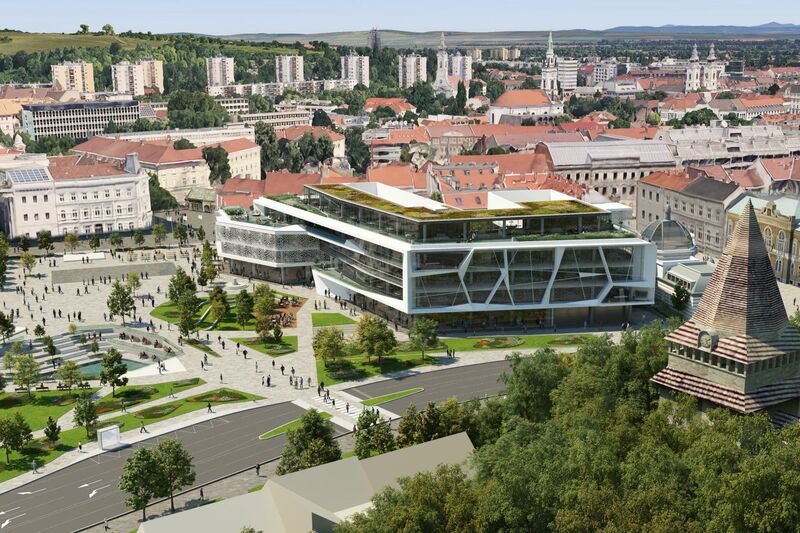 The new evosoft office located in South-Buda will be a world-class workplace and a new landmark on the Buda river bank. 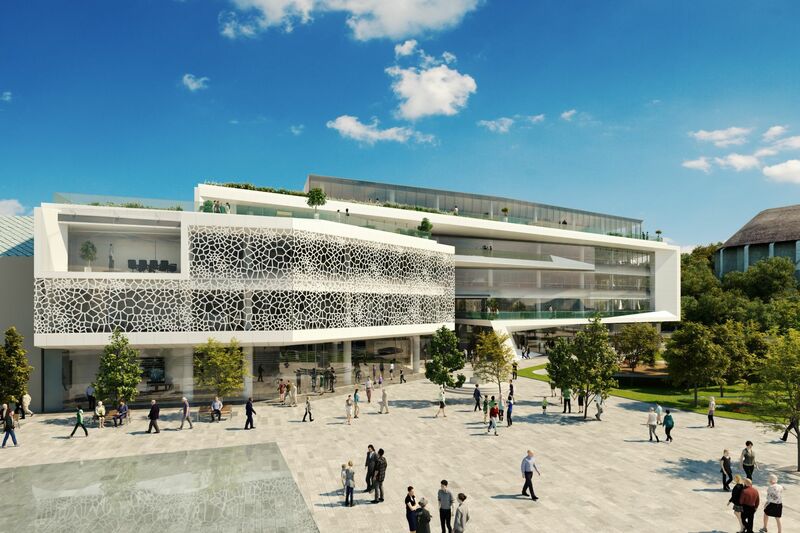 The gross usable area of the new building is 22,000 square meters and the building will offer 520 parking spaces in the underground garage. 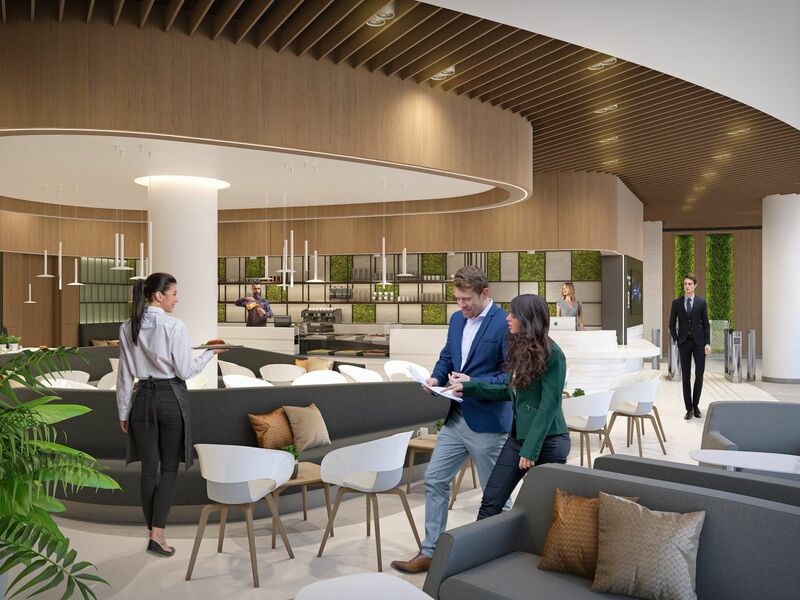 The office will be characterized by cutting-edge technologies, high-prestige design and co-working spaces for 1,500 evosoft colleagues. 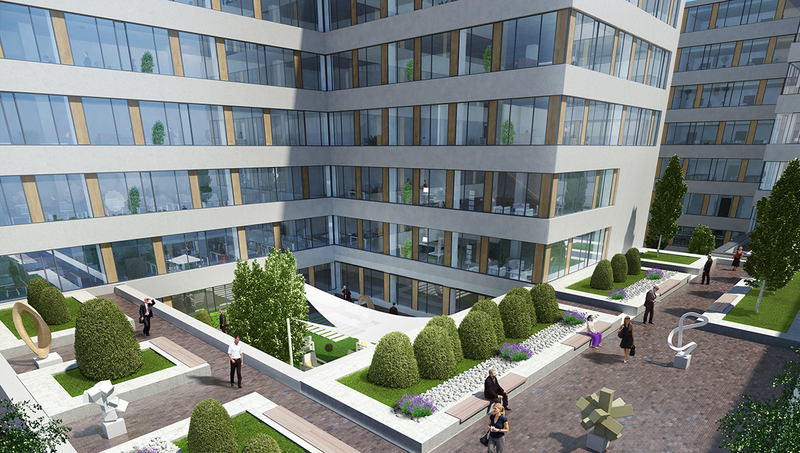 class office building is located in Debrecen, 10 minutes away from the city center and designed to meet all expectations of the digital age in line with LEED „Gold” certification standards. 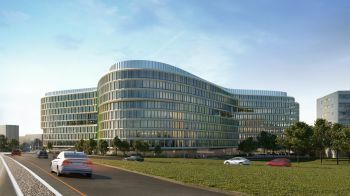 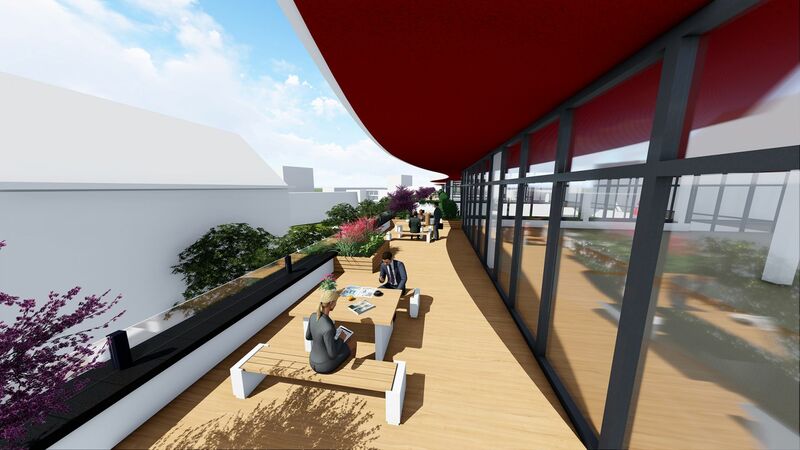 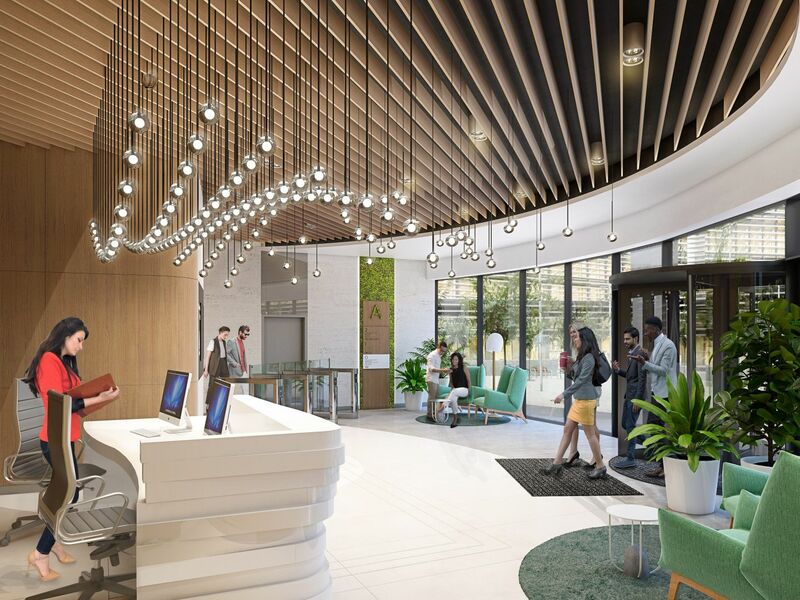 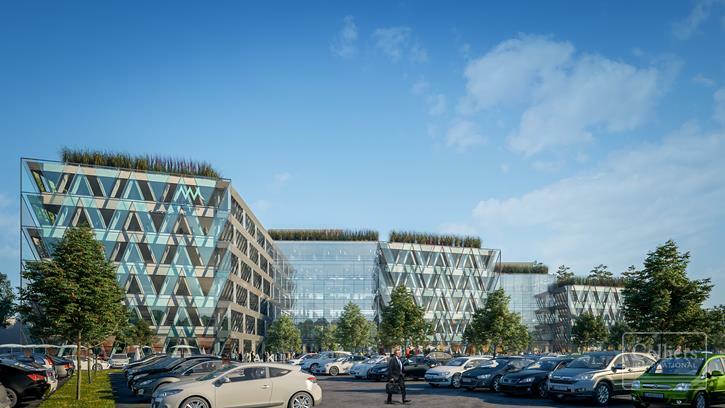 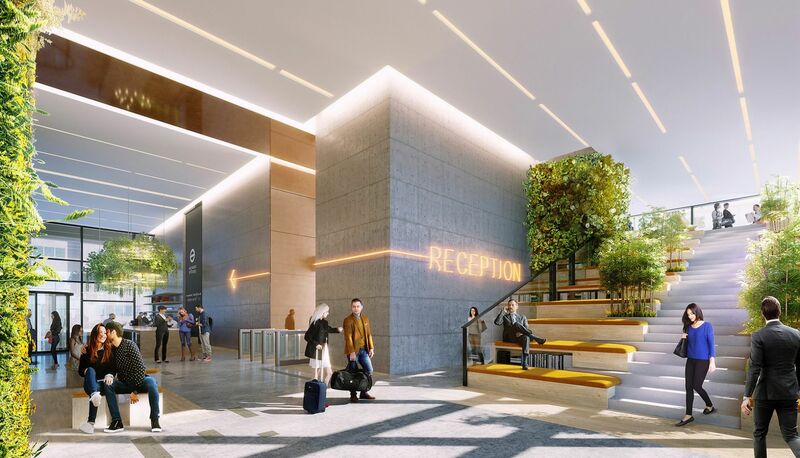 The office building will be built by using environmentally-conscious technological solutions, bright interiors, green rooftop garden as well as cutting edge solutions focusing on efficiency. 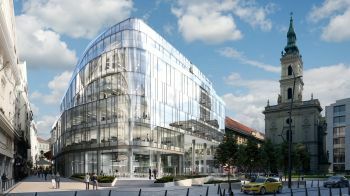 The WestEnd Office Complex comprises three towers totalling 17,000 m2 of Class ‘A’ office space in the heart of Budapest, with a uniquely easy approach. 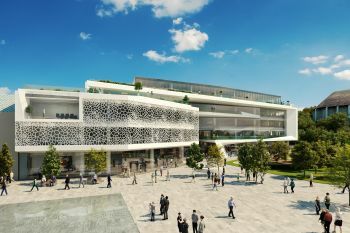 The distinguishing features for tenants and office workers are the direct access to the shopping and entertainment center and the five-star Hilton hotel facilities thanks to the mixed-used development style, as well as the high standard concierge services and the extra discounts in the shopping centre. 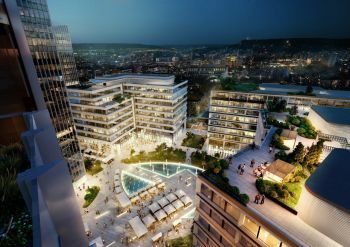 Szervita Square Building is a LEED Platinum certified, sustainable, mixed-use commercial property in downtown Budapest, offering retail and office premises, as well as luxury residential units on 14,900 sqm from 2020. 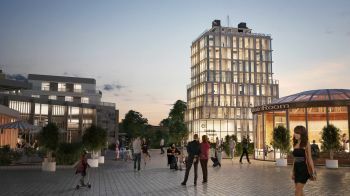 The modern 7-storey property, with its unique shape, lightweight and ethereal structure, soft facade contours and reflecting glass surfaces fits organically in its historic setting. 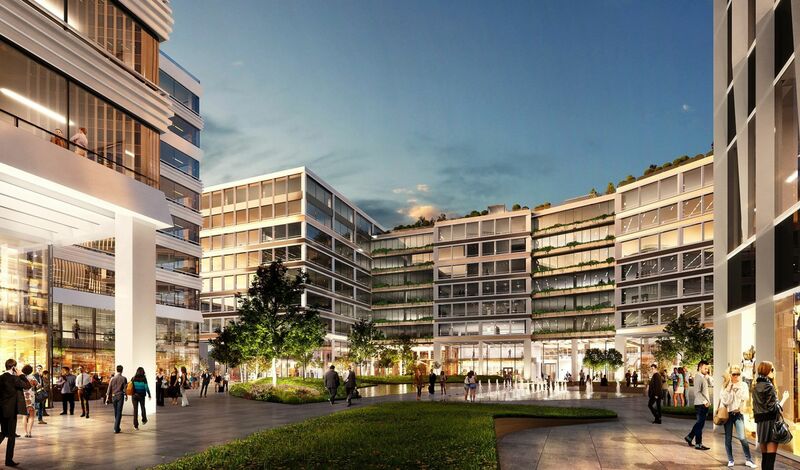 The entire office area of the building (4 floors, 8,500 sqm) was pre-leased by SPACES in 2018. 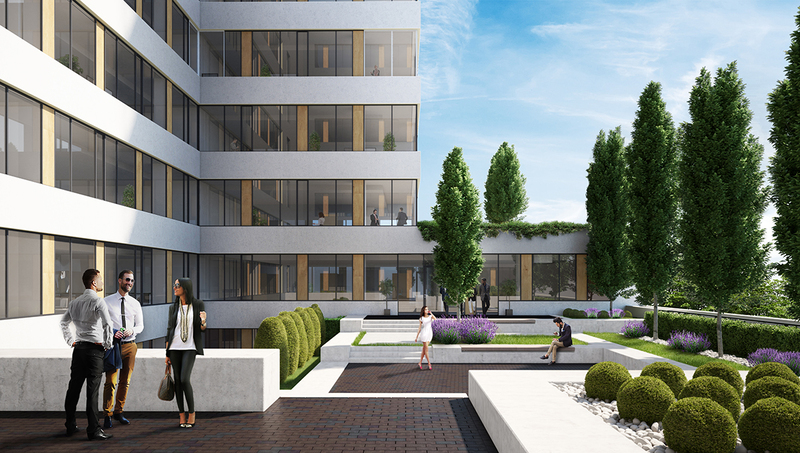 Váci Greens is a campus style development with 6 buildings, 130,000 m2 of A+ class offices within a green working environment. 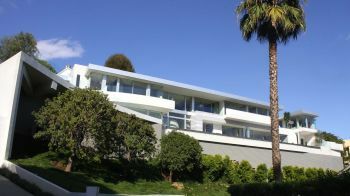 It is easily accessible, situated only 300 m from the metro. 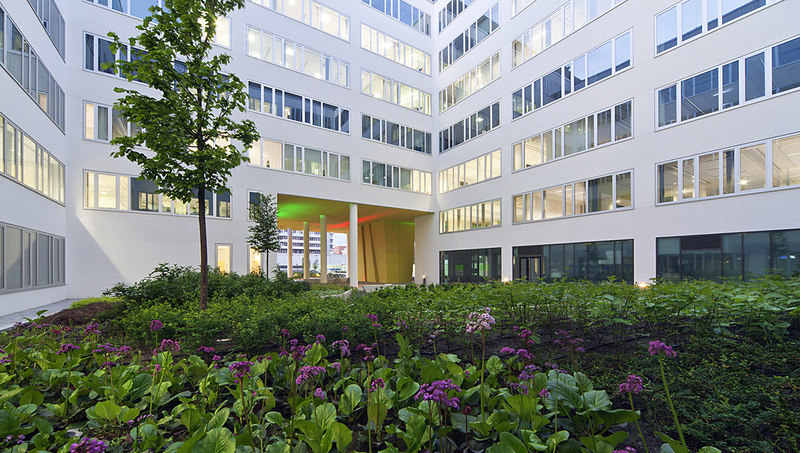 ATENOR has developed all buildings with BREEAM Excellent ratings. 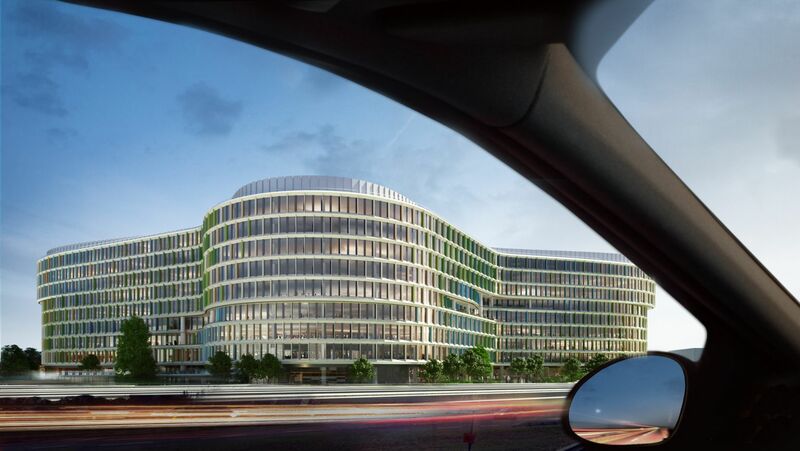 The first 4 buildings are 100% leased to international tenants like GE, SUEZ, BNP Paribas, Givaudan, Accenture, Unilever, Aon, Atos, Ford. 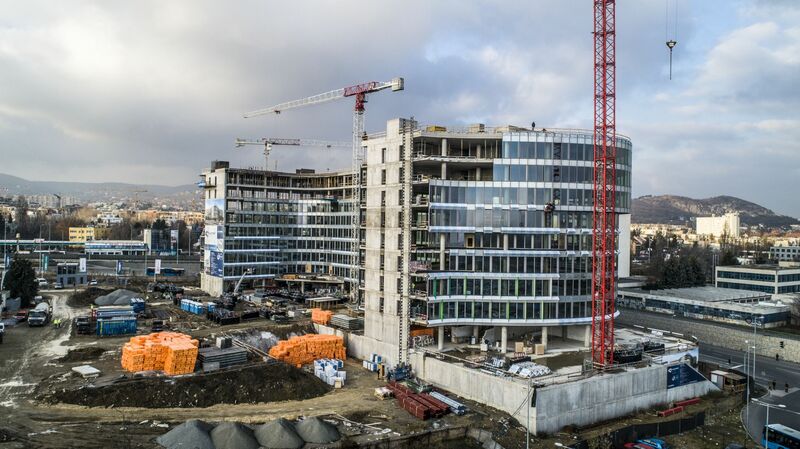 The last two buildings “E” and „F” are under construction and will be handed over in 2020 Q2 and 2020 Q3. 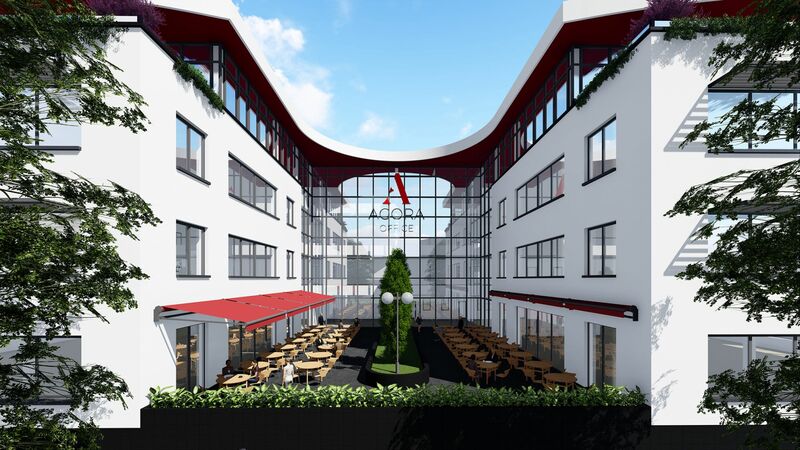 One of the most complex office buildings, Avalon Business Center Miskolc opens in 2020. 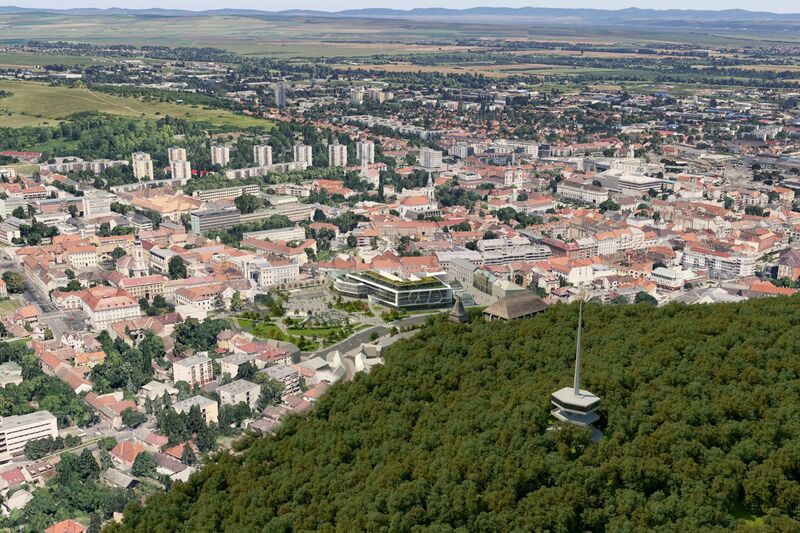 Green investment with energy certification A+ based on state-of-the-art technology in the heart of Miskolc downtown. 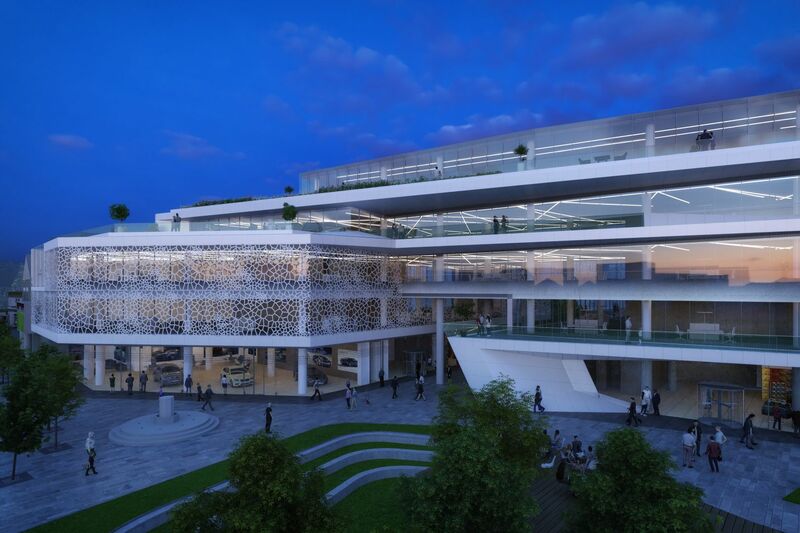 A total area of 7400 sqm for office use. 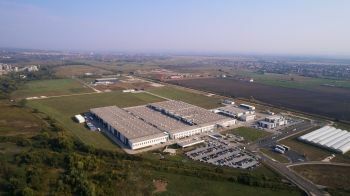 Officers for rent from 200 m2 up to 1000 m2. 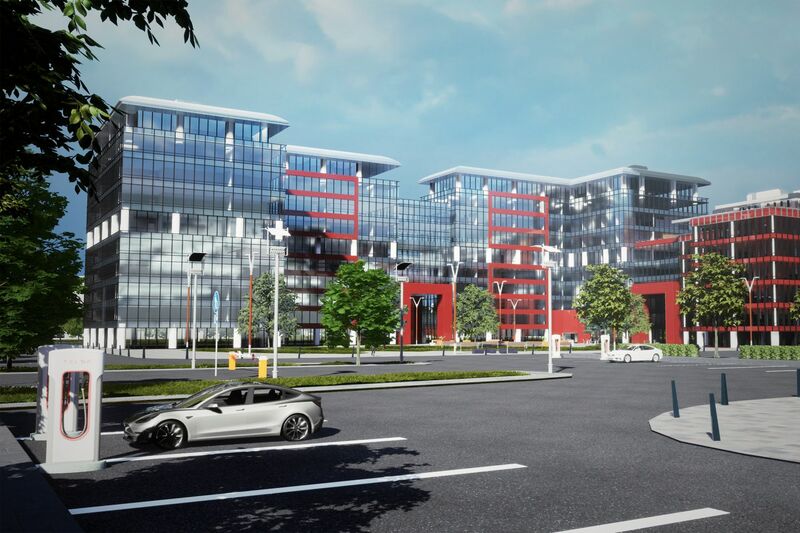 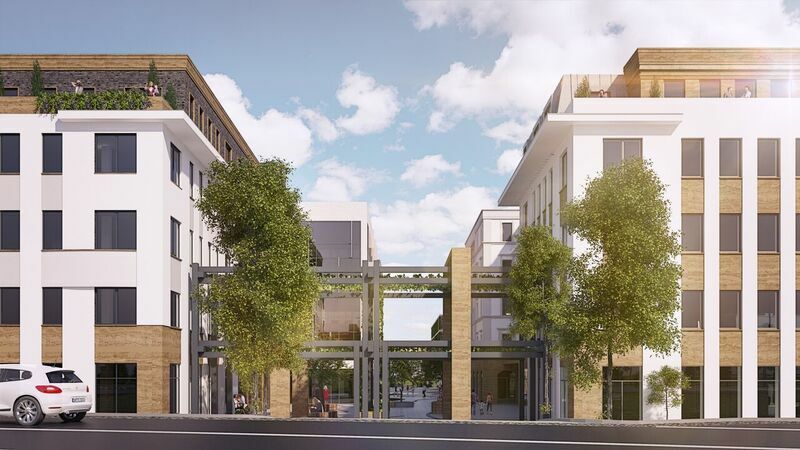 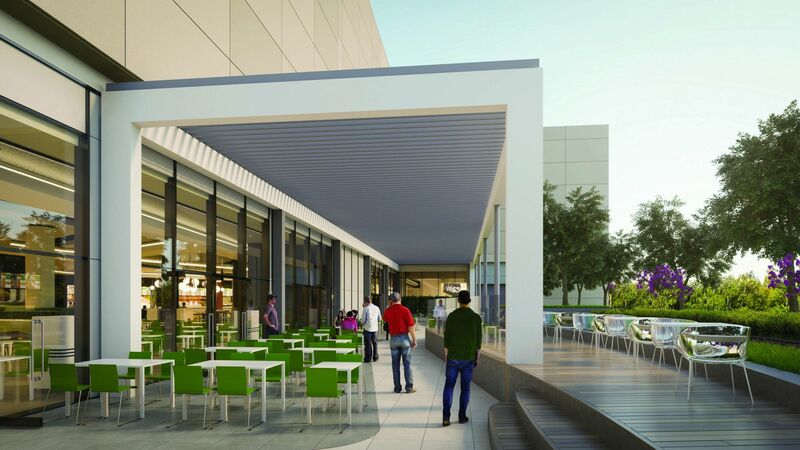 350 parking spaces with underground garage, shops and catering facilities. 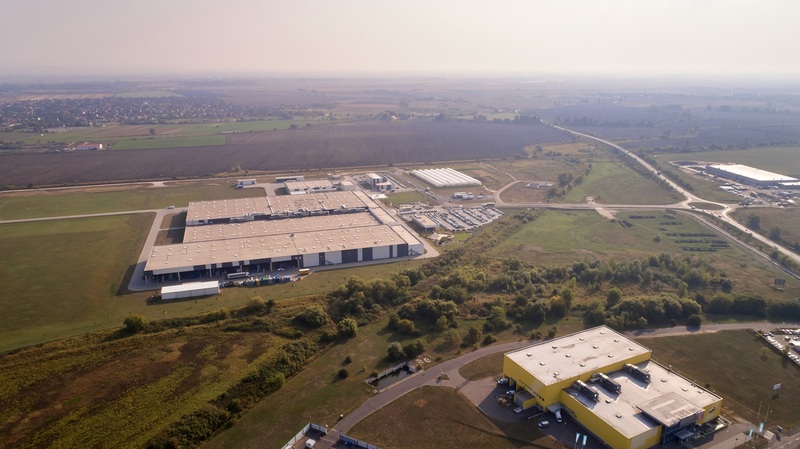 The Aeropolis - aligned with Debrecen’s long term HR strategy and due to it’s excellent logistic capability – has the opportunity to be the second city center of Debrecen. 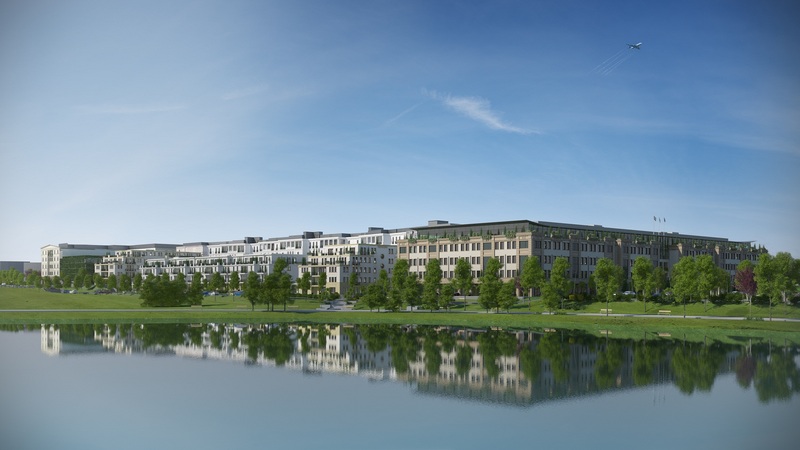 At the northern part, there will be hundreds of affordable, yet modern apartments, which will be a desirable option for new residents. 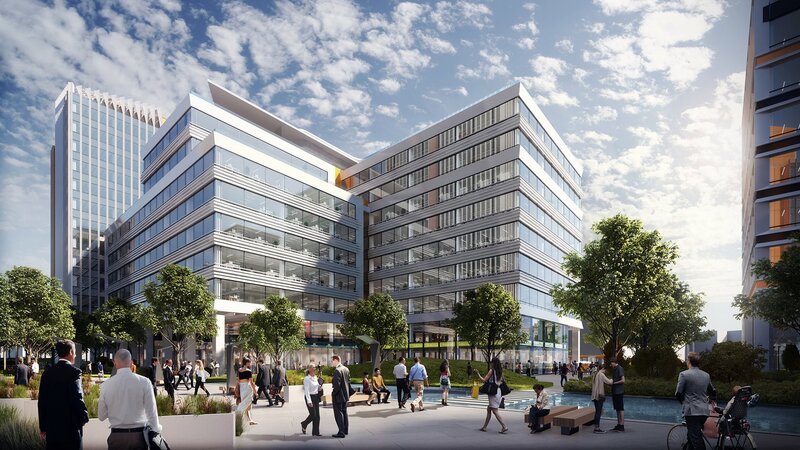 At the central area office buildings, service centers, hotels and restaurants will dynamize the local economic ecosystem. 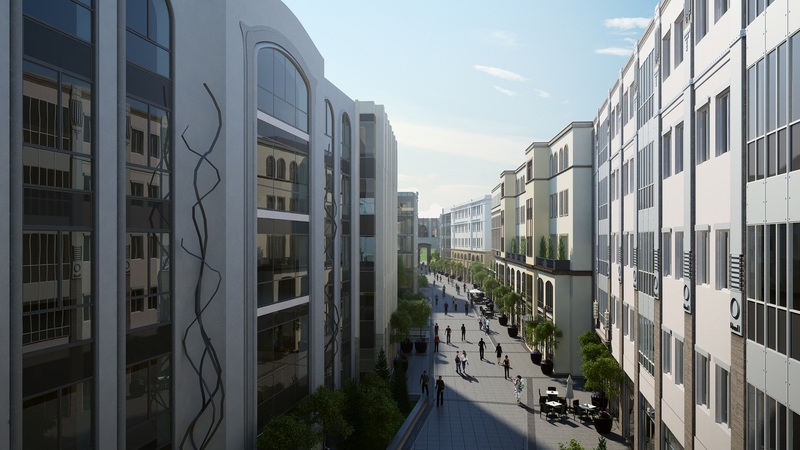 The southern district with the vicinity of the International Airport will offer logistic services. 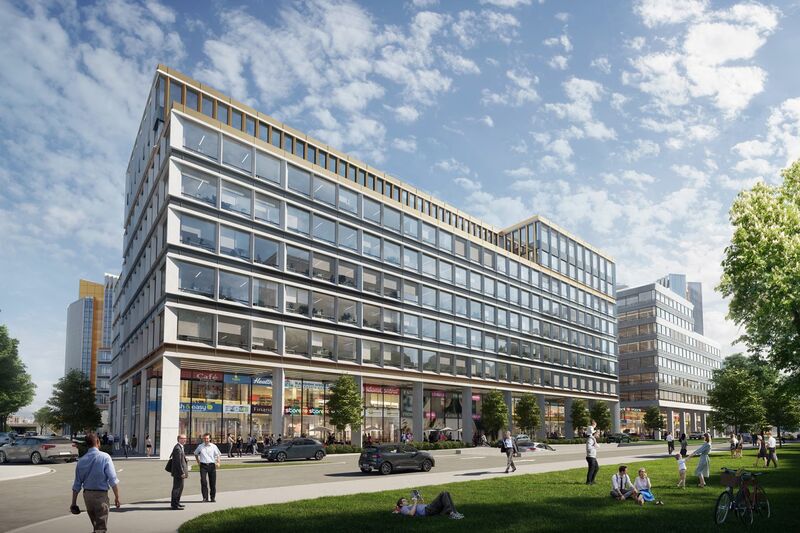 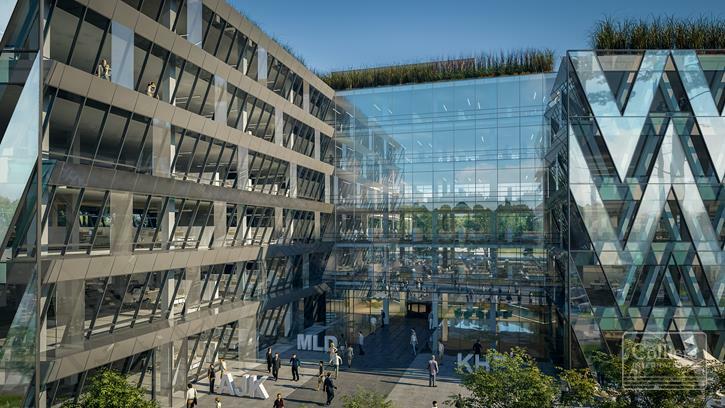 With a total floor space of 40 thousand square meters, the Liberty Office Building will offer premium offices right next door to the recently inaugurated Telekom headquarters, in one of Budapest’s most dynamically developing districts. 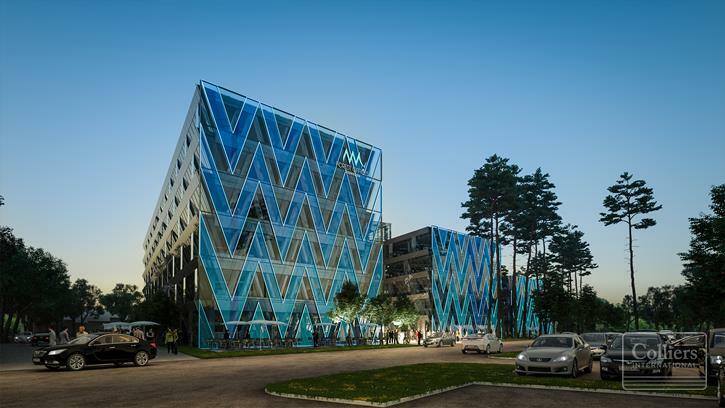 In addition to a technology for energy efficiency, the building also incorporates several other creative architectural solutions. 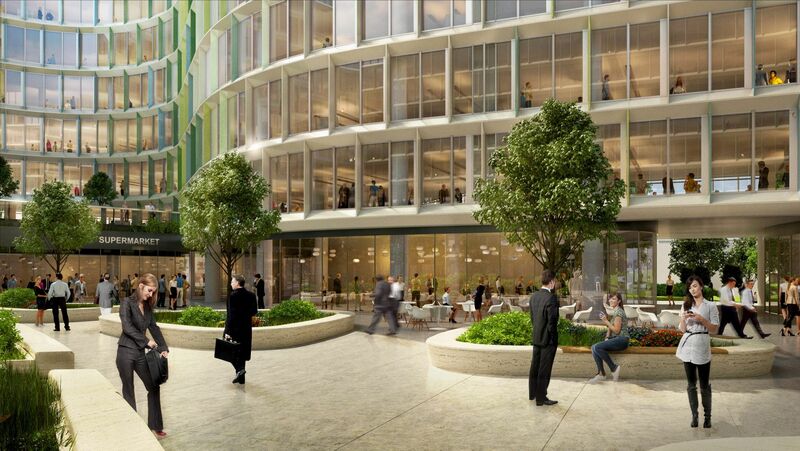 The building’s main appeal will be a greenhouse with plants, fountains on the topmost floor as well as a panoramic sky bar and a cafe. 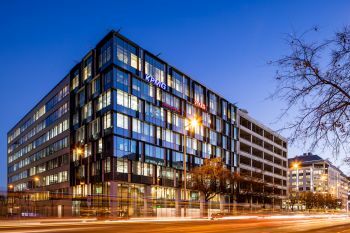 The former E.ON headquarters office building is on sale in its current condition. 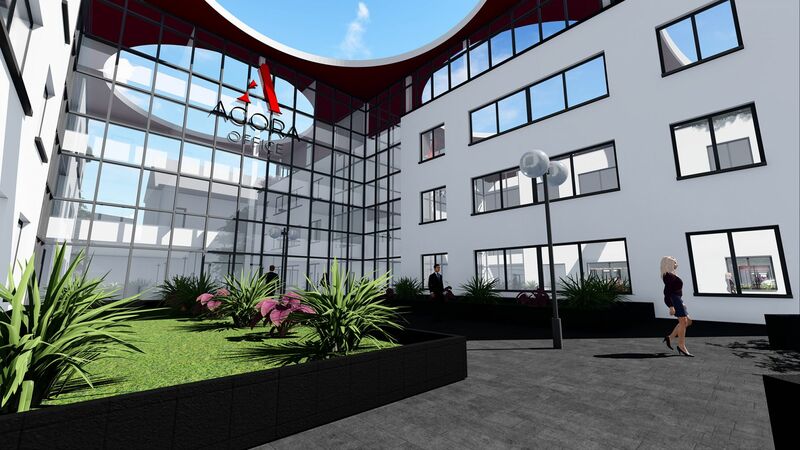 After some refurbishment works it could provide supplementary, good quality office space for the ever growing demand. 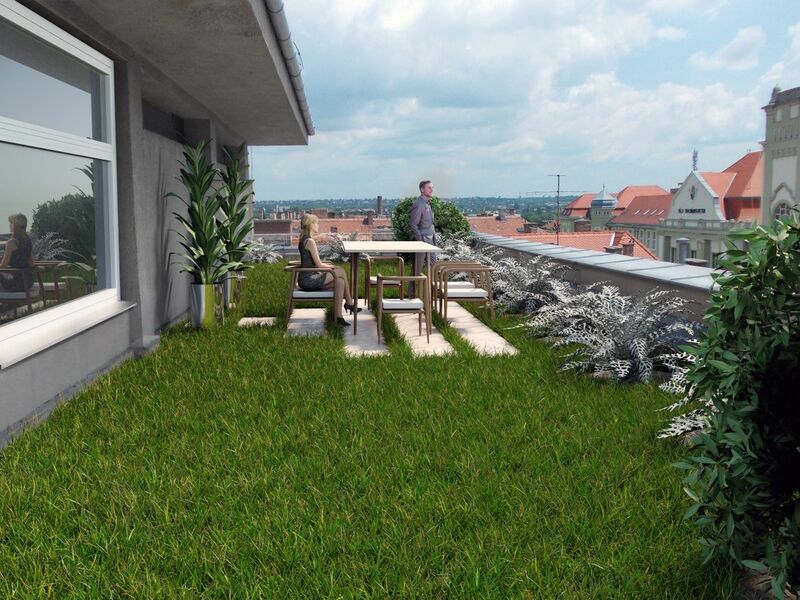 The property is located right on the edge of the historical downtown of Pécs. 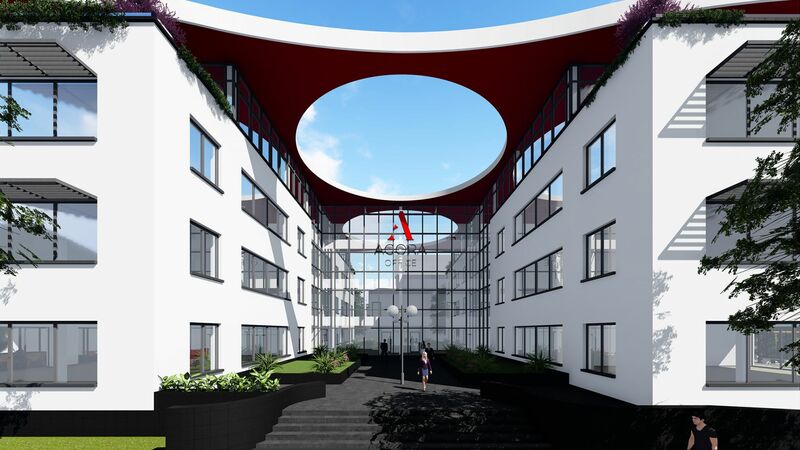 The project owner has started the development of a 4660sq.m “A” category office building with target date of completion: June, 2019 on half of the development plot. 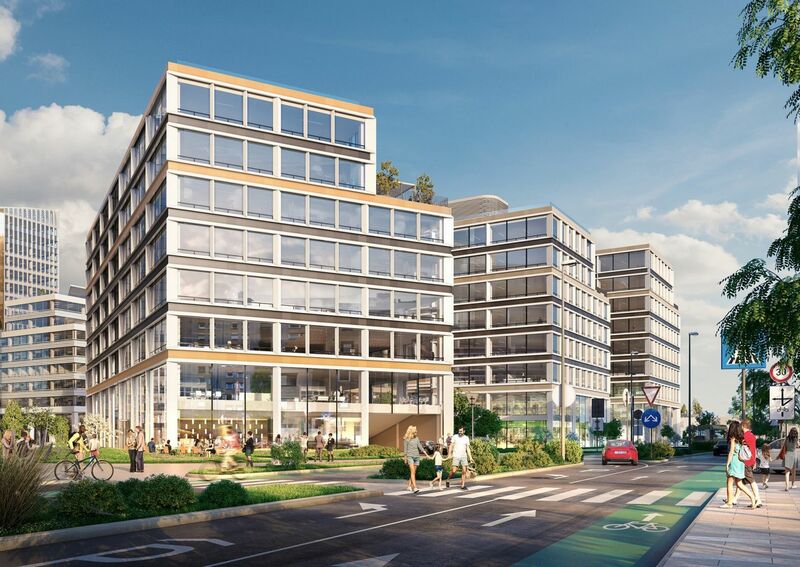 The aim of the project is to sell the completed office building while keeping its operation and starting a second phase development of an identical building in the remaining part of the plot. 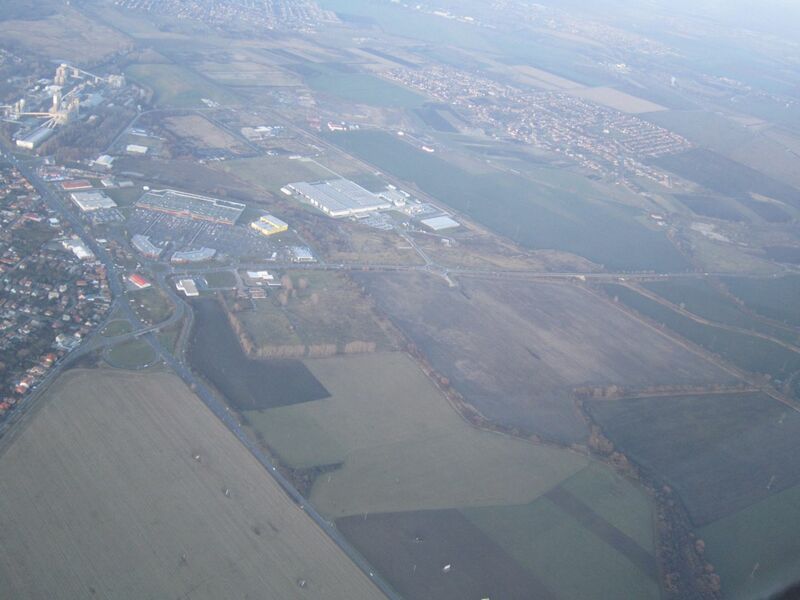 A ~40,000 sq. 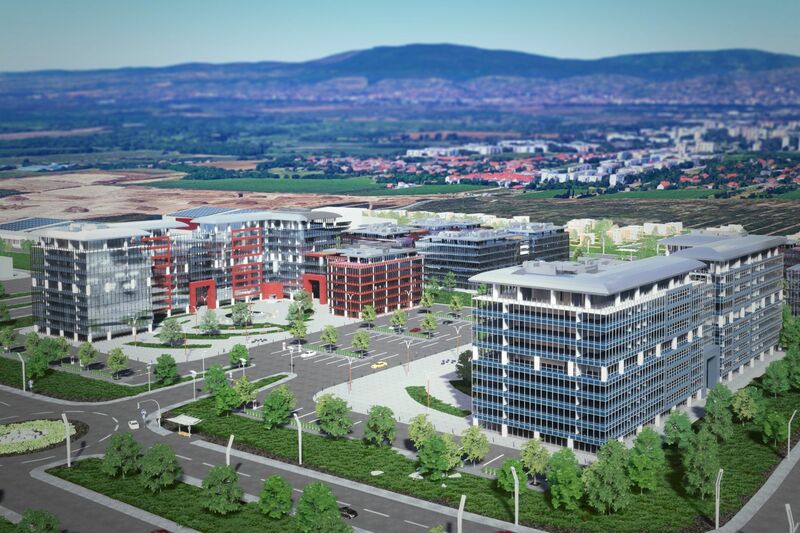 m development plot in Hungary’s third most populated city to be developed into a new, mixed used area with hotel, shops, leisure facilities and offices. 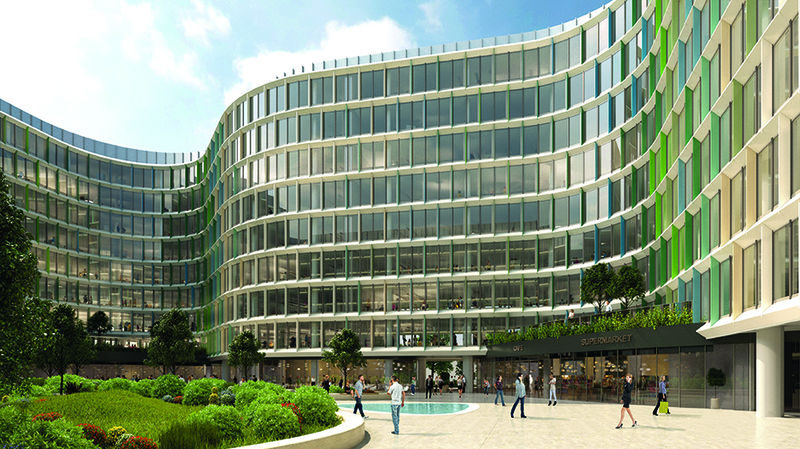 The project owner seeks investors for the hotel, office and leisure project phase to be developed in a joint venture. 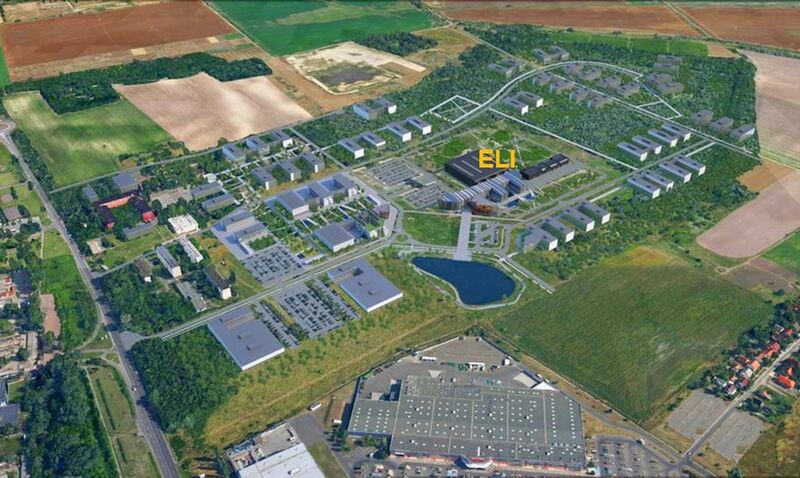 This green field development project is located just a few hundred metres from one of Hungary’s largest research institutes; the ELI-ALPS and the ContiTech rubber factory. 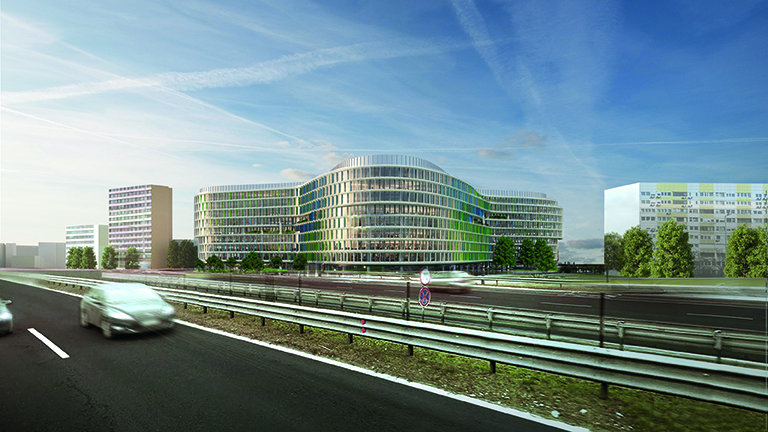 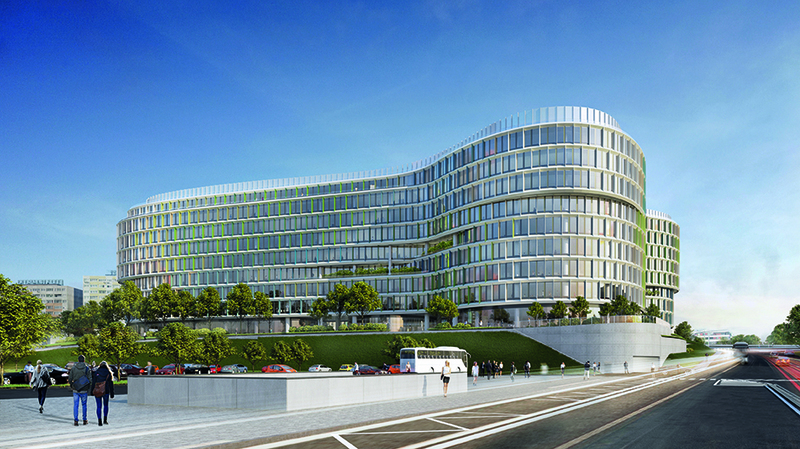 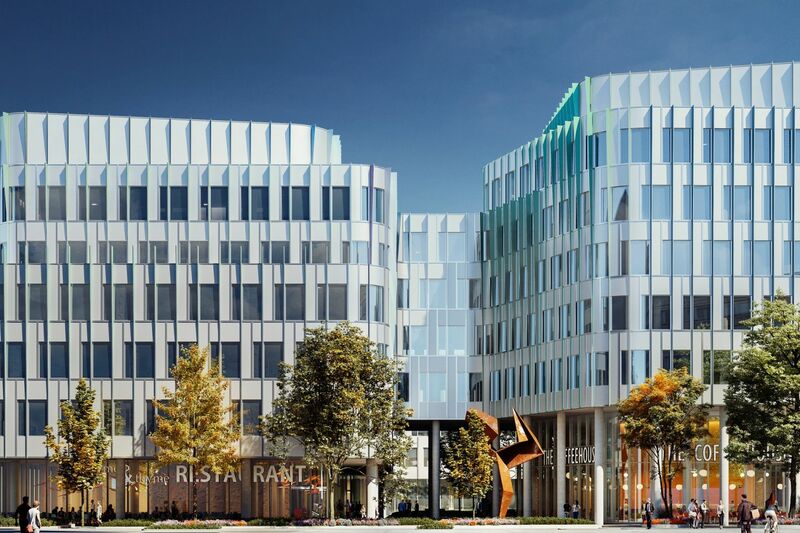 Pillar is a 29.000 m2 landmark office development set within the heart of Budapest. 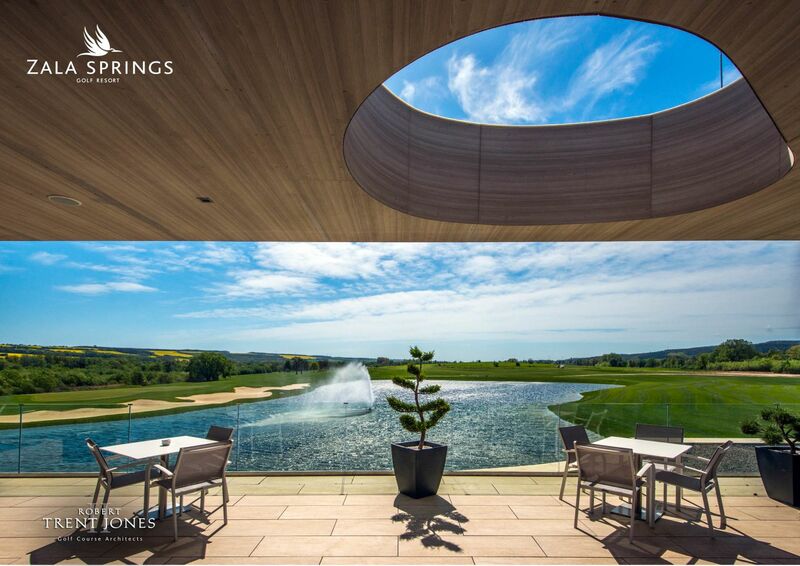 Designed by award winning local architect practise Zoboki Design & Architecture and developed by GTC Hungary, this striking development hides a garden oasis behind a colonnade of perimetre pillars. 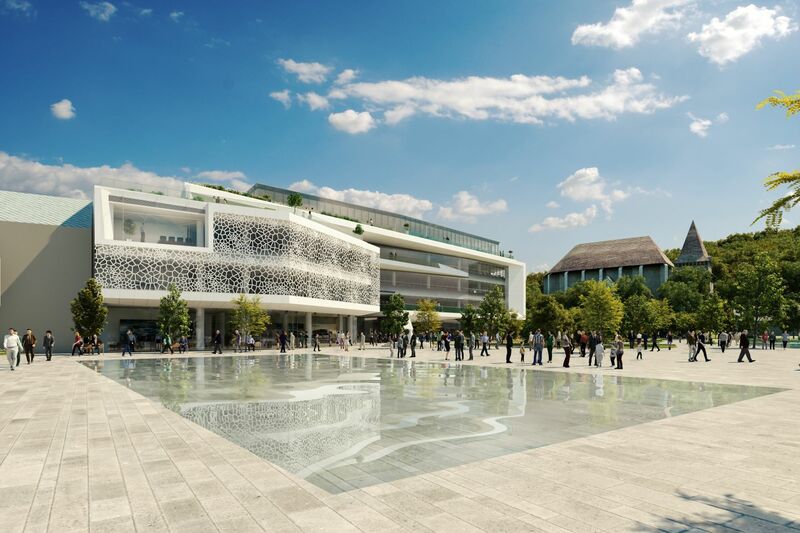 Floor plates range from 950 m2 to 6.050 m2 over six upper levels and the groundfloor offers 2.000 m2 prime retail and 178 cycle spaces and shower units. 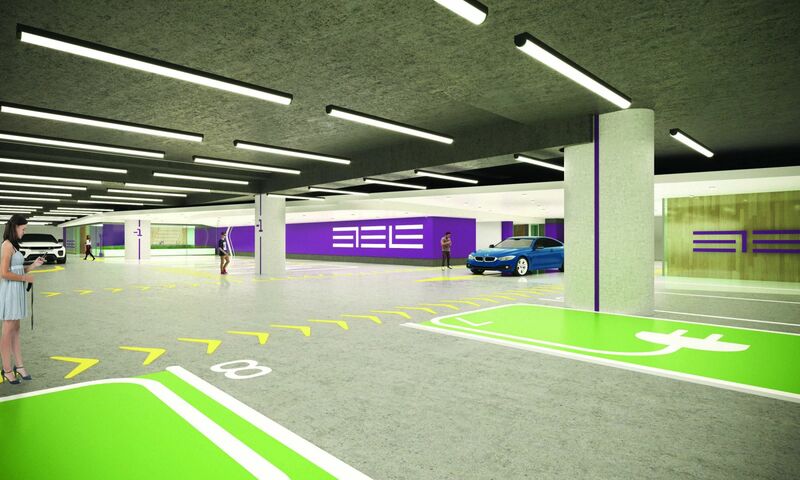 There are an additional two lower levels providing 380 car parking spaces. 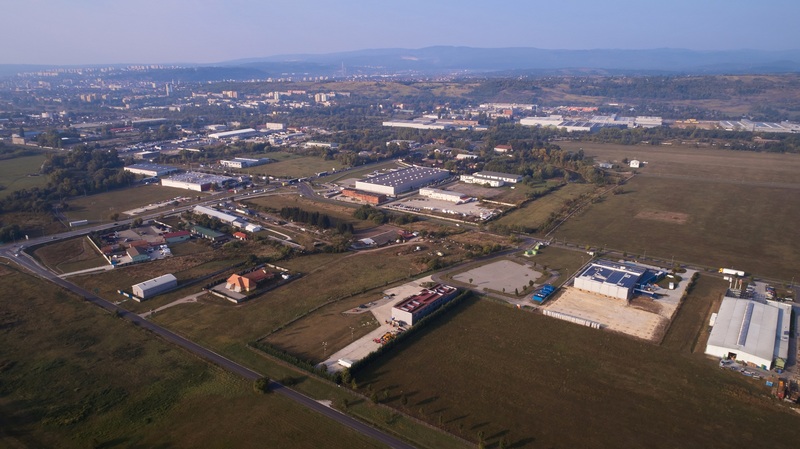 Due to the high utilization of the two industrial parks operated and developed by the City of Miskolc, the need for new industrial areas has come up. 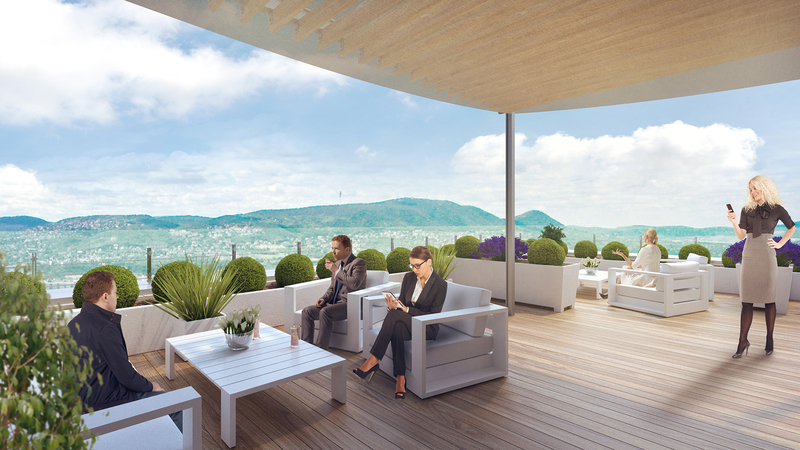 It creates investment opportunities for new investors firstly on a 120-hectare and a 400-hectare area. 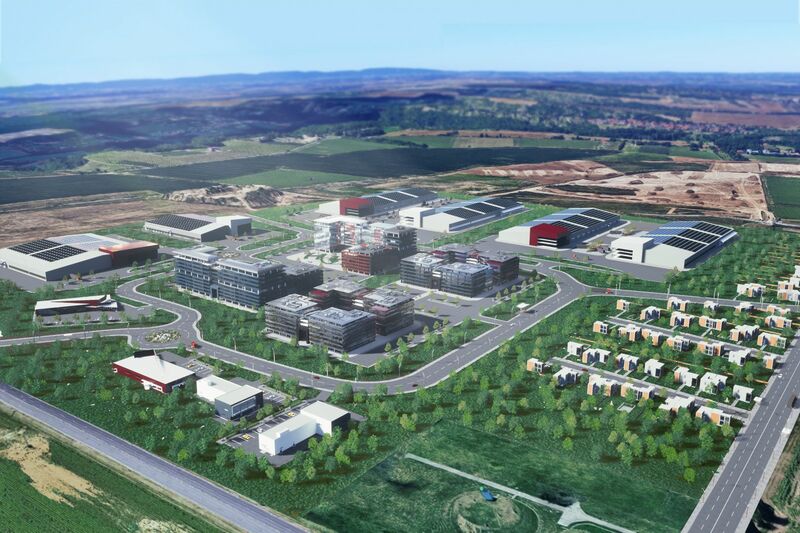 These new industrial parks offers favourable geographic and logistic location, renewable energy sources, developed technical infrastructure and attractive business environment. 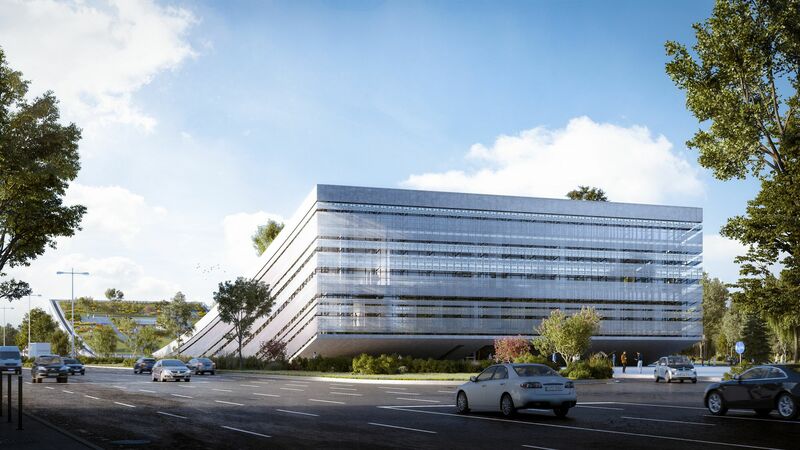 The Extreme Light Infrastructure (ELI) project is an integral part of the European plan to build the next generation of large research facilities identified and selected by the European Strategy Forum on Research Infrastructures (ESFRI). The Extreme light infrastructure is the first infrastructure in the world capable of the investigation of the interactions between light and matter with the highest intensity, in the so-called ultra-relativistic range. 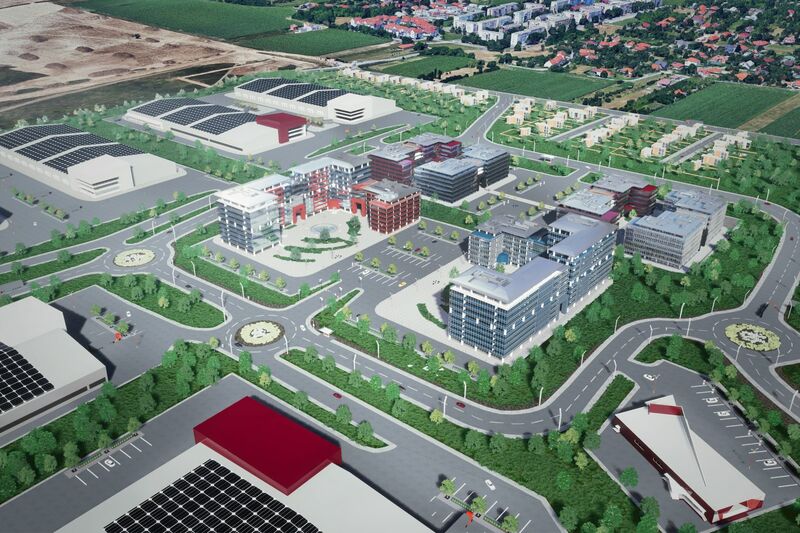 Szeged a világszínvonalú ELI-ALPS Kutatóközpont mellett dinamikusan fejlődő infrastruktúrát és az Új Tudományos és Innovációs Parkban rejlő innovációs potenciált mutatja be. 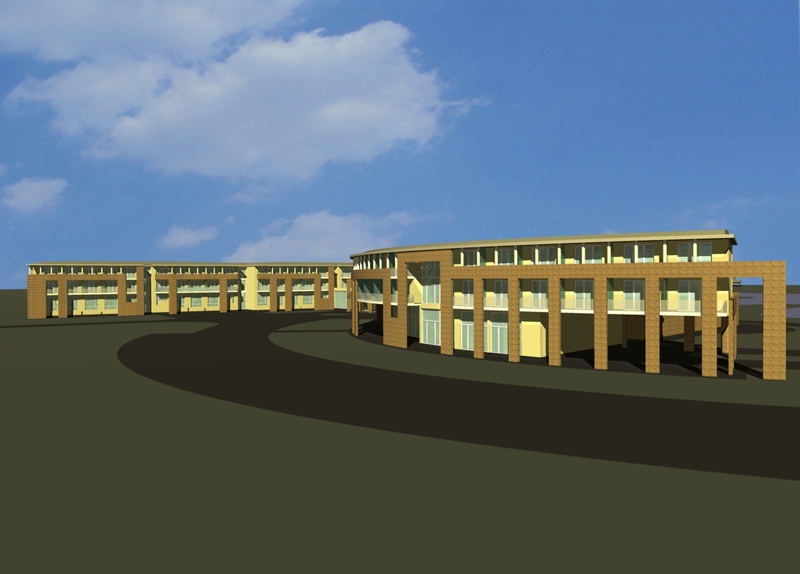 The project owner seeks investors to build a logistical centre or warehouse and utilize the logistical advantages of the M0 motorway. 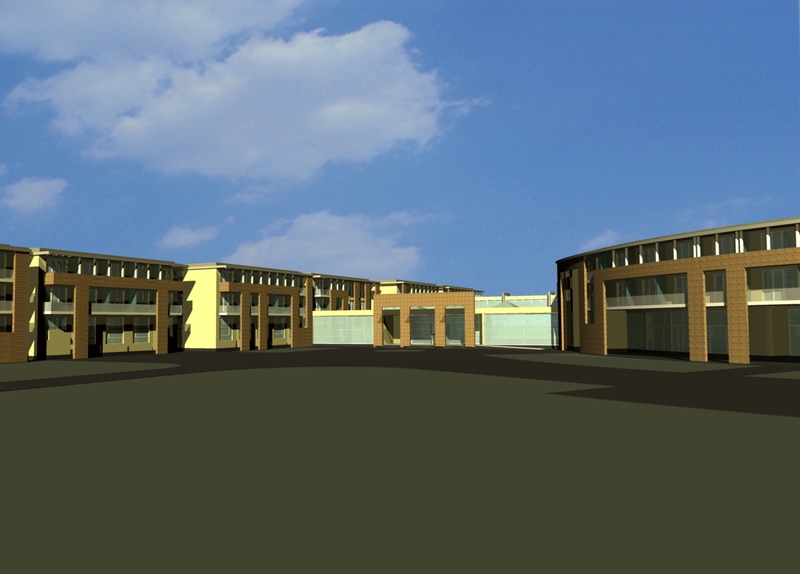 As the project states, the preliminary plans of a 48,000 sq.m logistical warehouse schedule the completion in different phases. 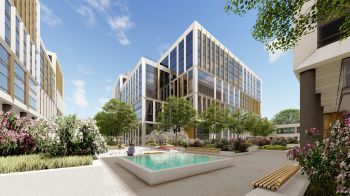 According to the plans, this is just the first phase of a much larger, complex development, which includes several hotels and leisure facilities. 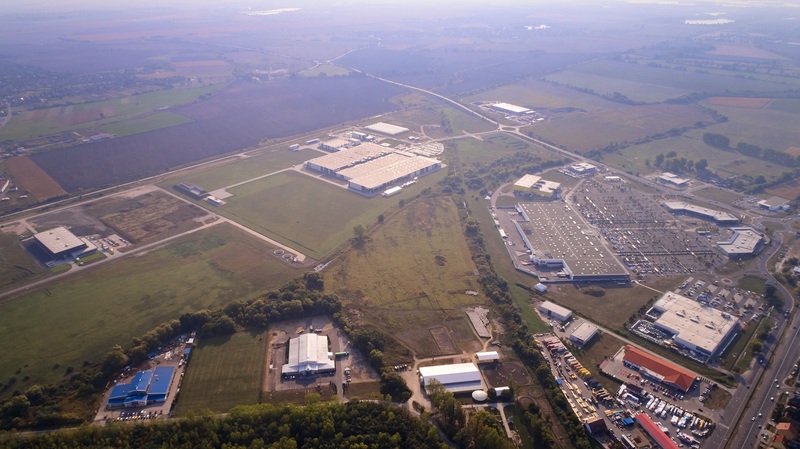 The Miskolc Industrial Park has become one of the most significant industrial parks in the region, a new greenfield development area, with public utilities, called the Mechatronics Industrial Park. 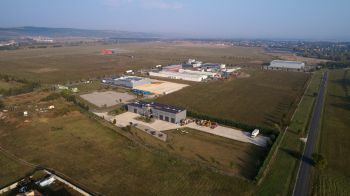 In Mechatronic Industrial Park all public utilities are available for the prospective investors. 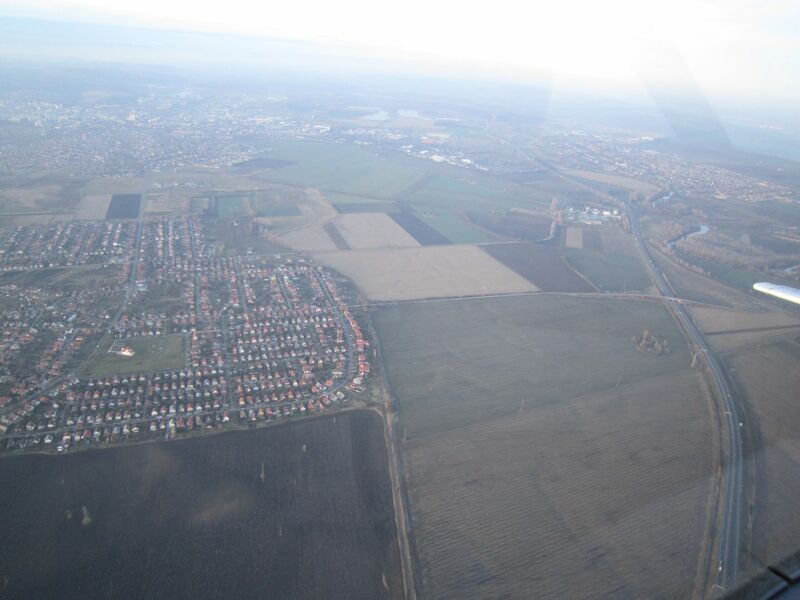 The current utility network and its capacity can be flexibly expanded in accordance with investors’ requirements. 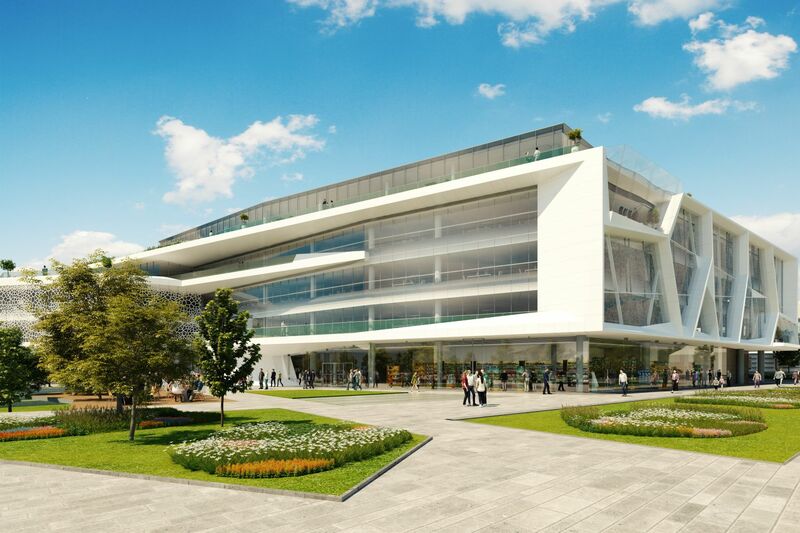 39,5 hectares of outstanding logistical and geographical green field area were available with public utilities for investors, which by today operates with more than 80% occupancy rate. 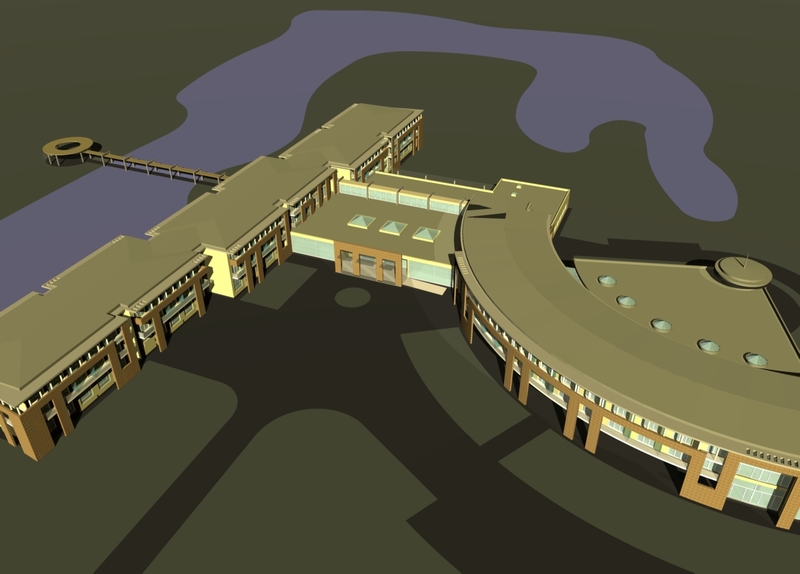 Available utilities: electric power; natural gas; water; waste water disposal; dewatering drainage; internal road. 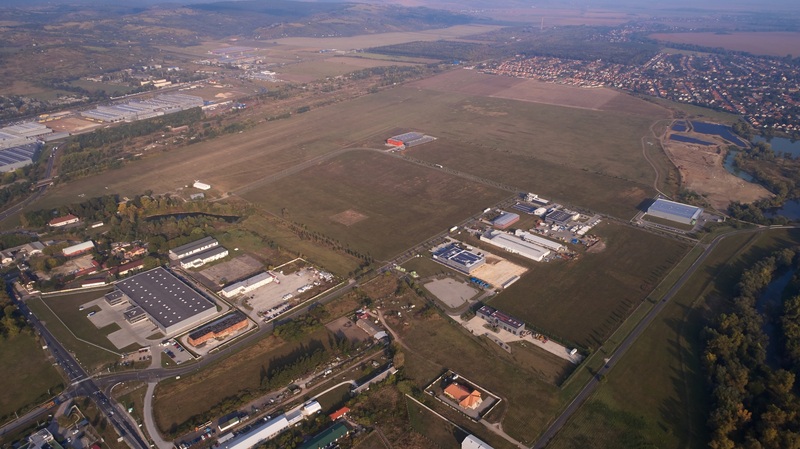 The 93.5 hectares area of Miskolc Southern Industrial Park lies on the southern border of Miskolc, next to the access road to the M30 highway. 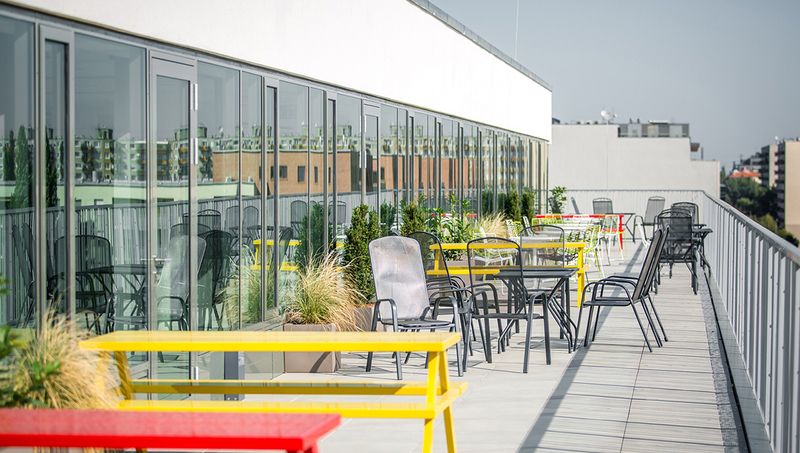 The area is easily accessible and lies between the Budapest—Miskolc main railway line and national main road no 3. 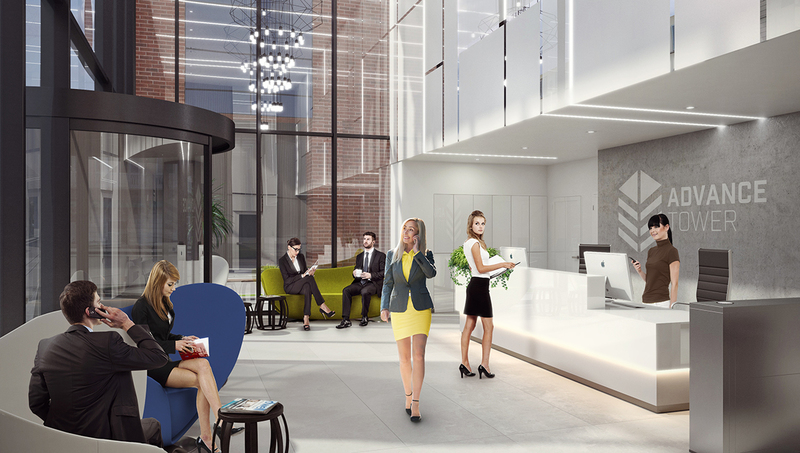 Beyond strategic location and modern infrastructure we provide such complex business services tailorable to the needs of individual companies that provide a firm background to the stable operation of the companies and to the realization of their concepts. 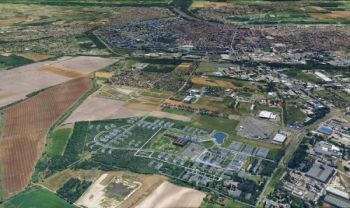 The area is typically suitable for industrial, energy production and settlement management sites and for commercial and service buildings. 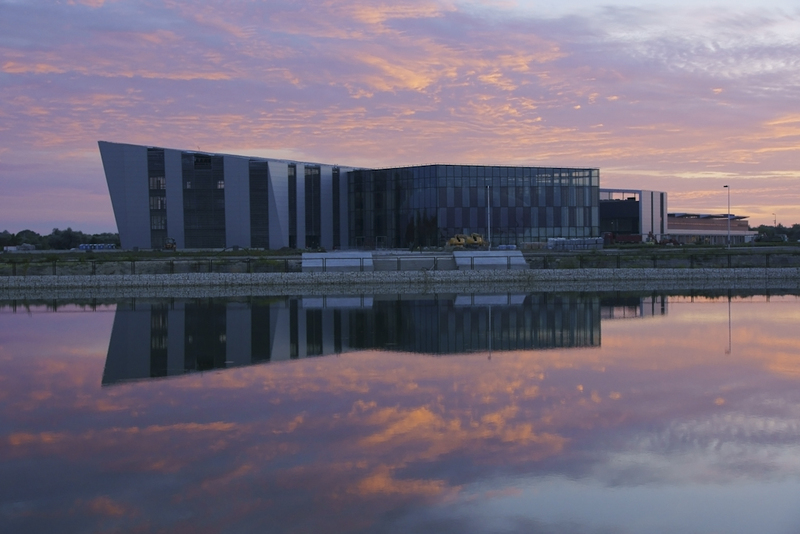 Available utilities: electric power; natural gas; water; waste water disposal; dewatering drainage; internal road. 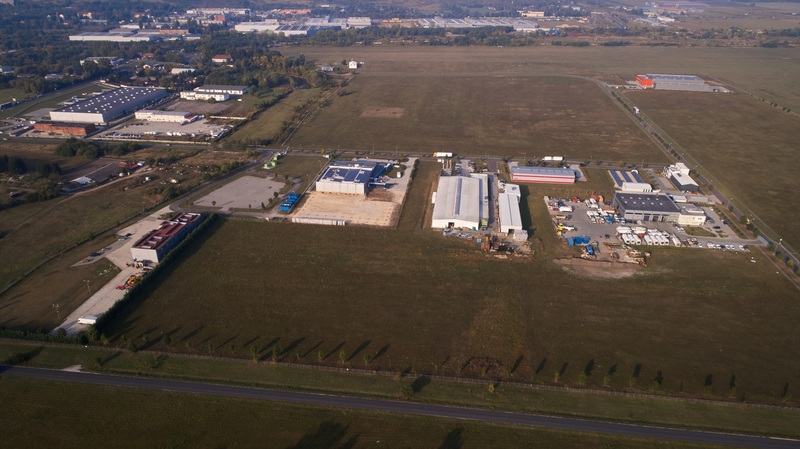 Due to the high interest for MSIP, new 120 ha industrial area is being developed by the Miskolc Holding Plc next to the Industrial Park with the same utilities mentioned above. 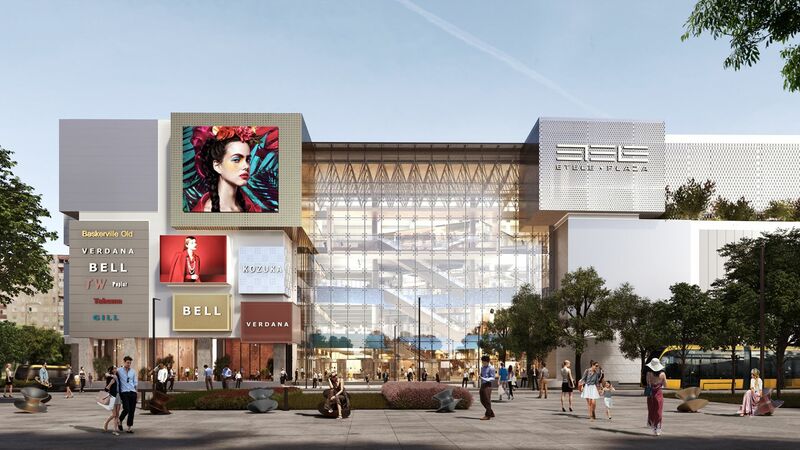 Hungary’s third largest shopping centre, Etele Plaza is Futureal’s most significant retail project under development and is set to revitalize the Újbuda disctrict of Budapest. 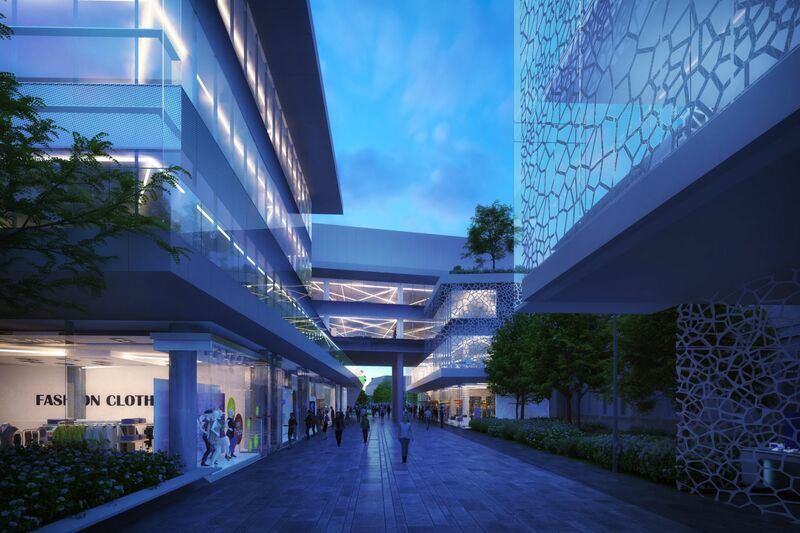 Once completed it will provide the biggest variety of shopping and entertainment facilities in its catchment area. 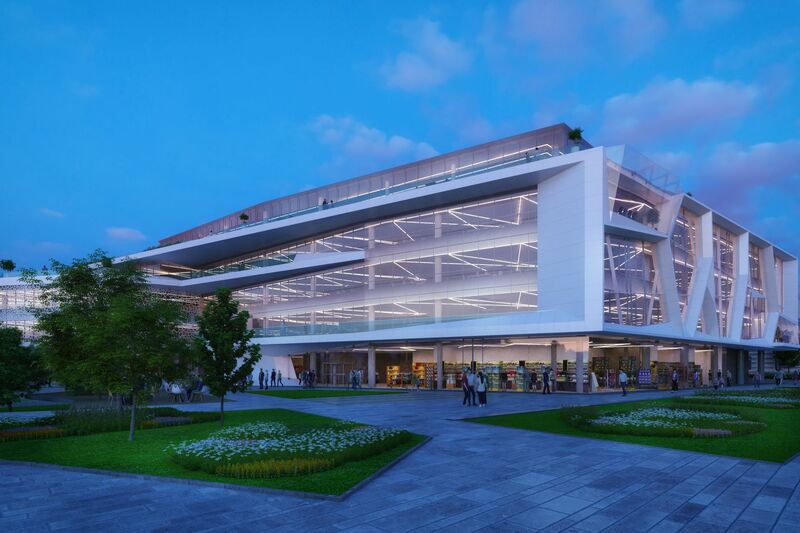 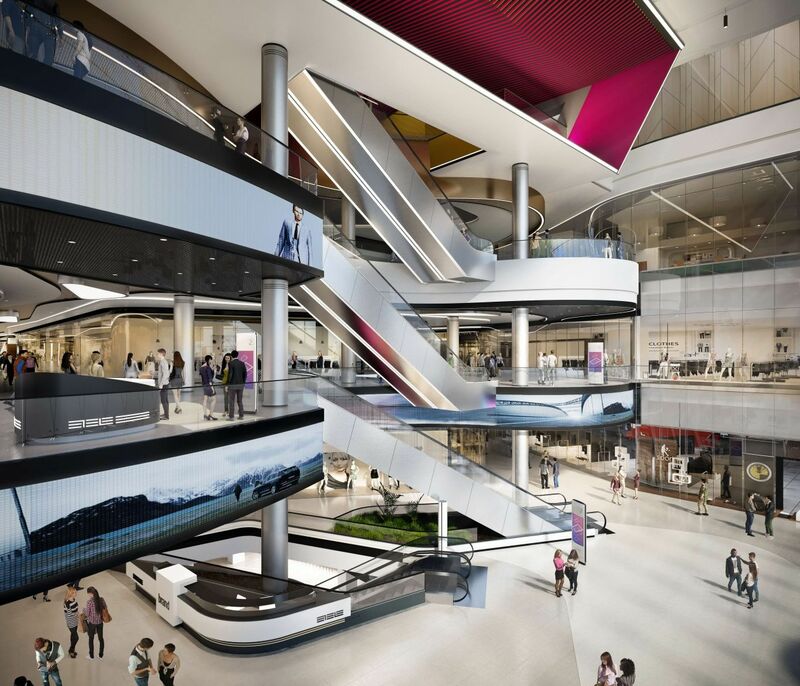 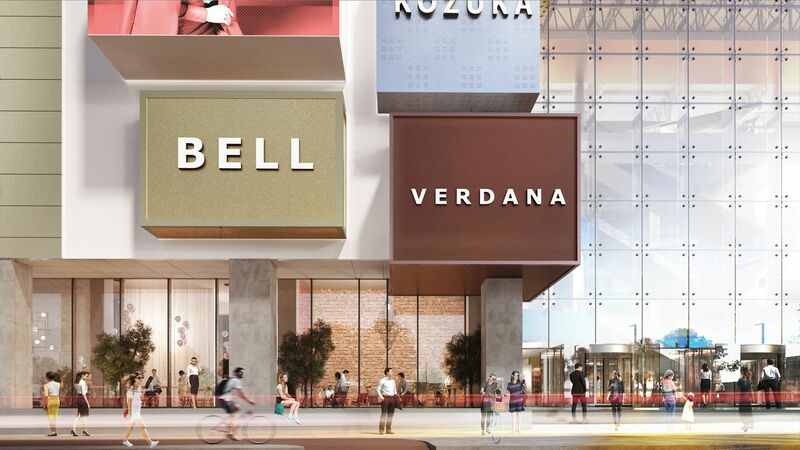 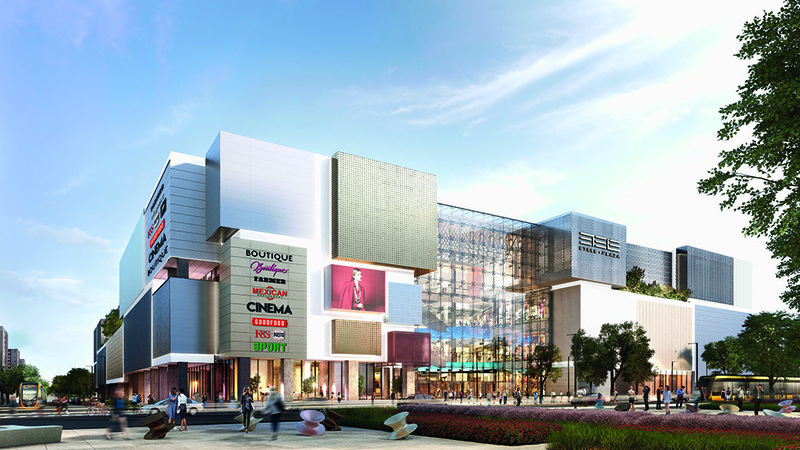 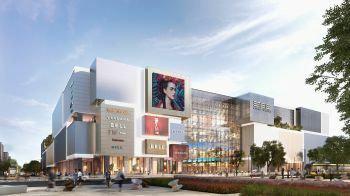 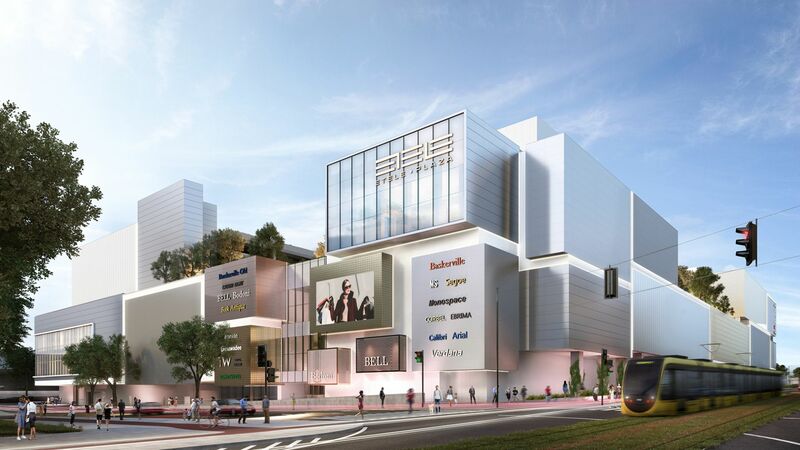 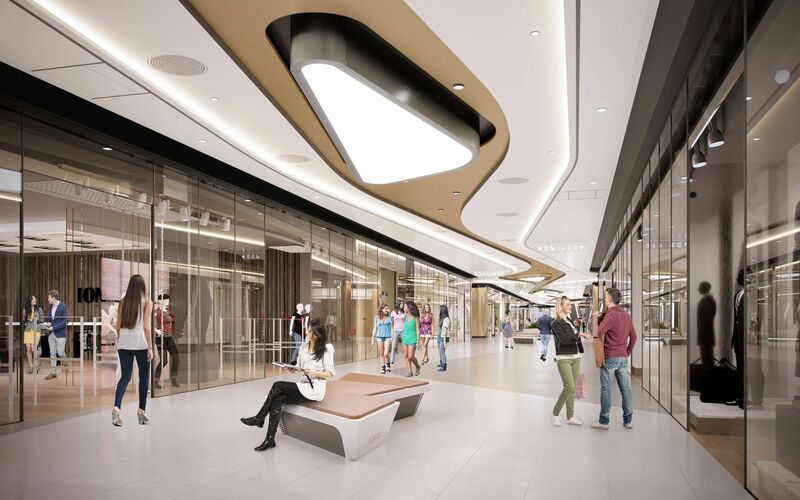 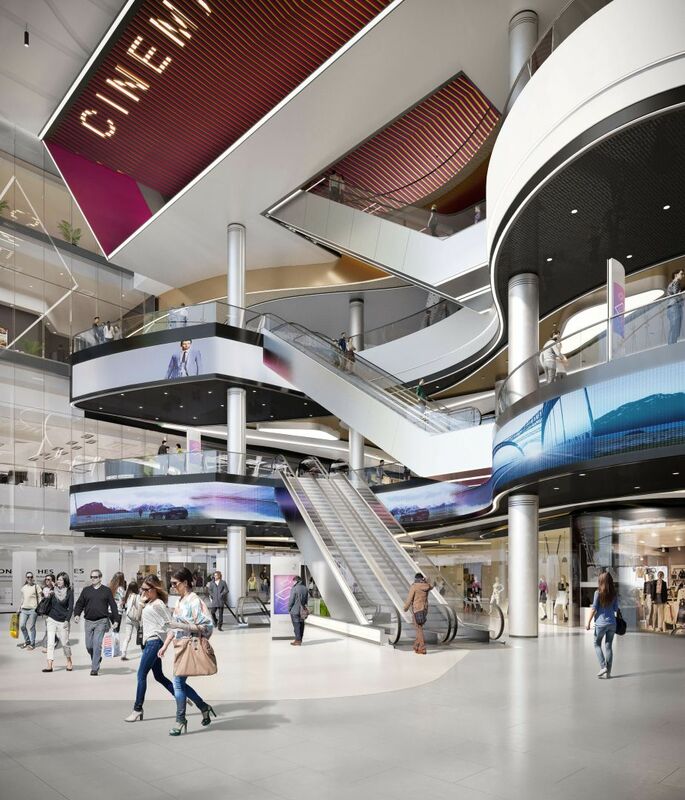 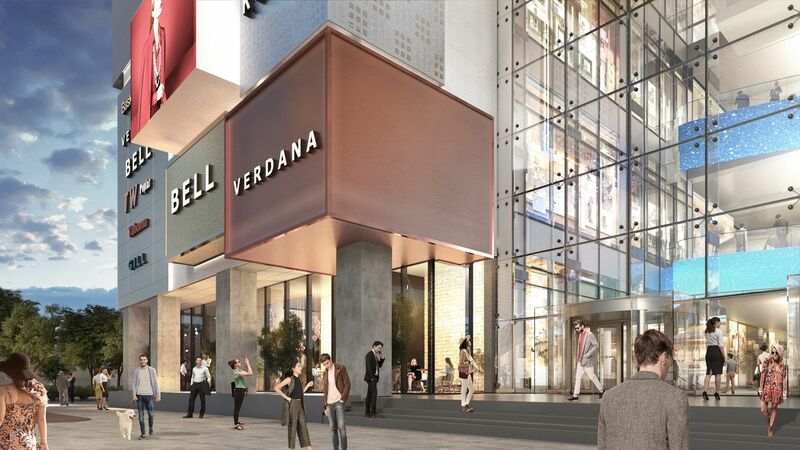 The 55.000 sqm shopping and entertainment centre in Budapest’s southwestern district Újbuda, Etele Plaza is expected to open in 2020 and attract up to 40,000 customers per day. 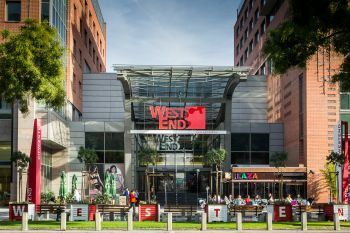 WestEnd City Center is one of Hungary’s most emblematic shopping centers, offering the additional advantages of the „A” category WestEnd office comlpex located over 17.000 sqm and the 5-star Hilton Budapest City hotel attached. 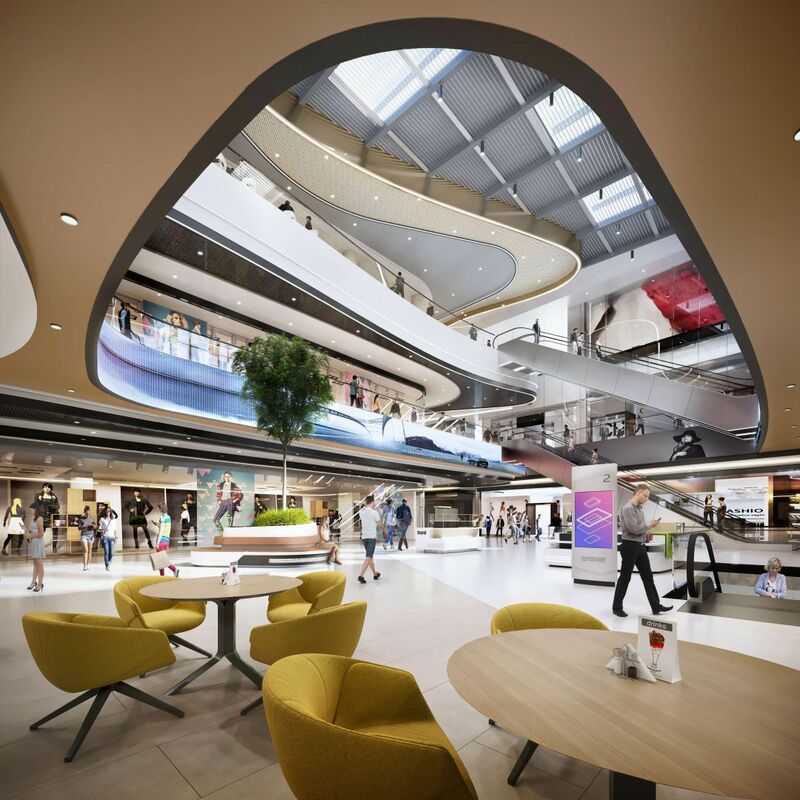 It has established a new district in the heart of Budapest, providing one of the largest urban shopping and entertainment opportunities, and steadily retained its leading position within the domestic retail sector since its handover. 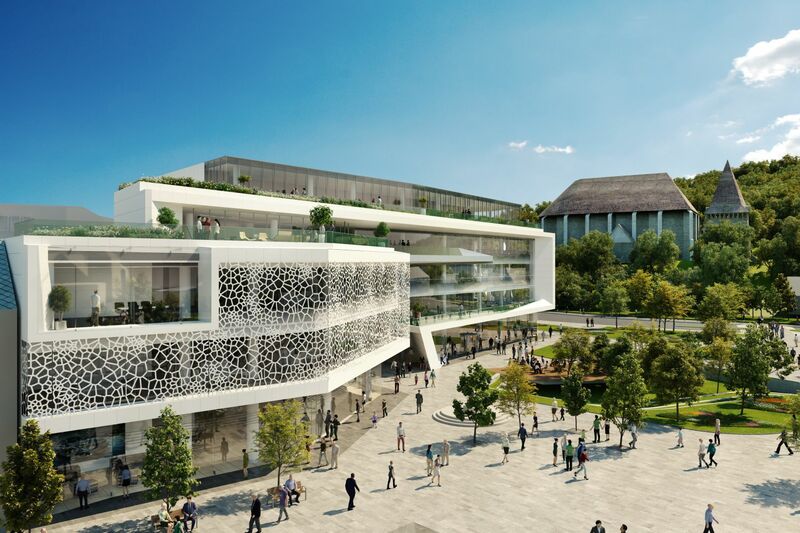 As the flagship development in the GP portfolio, it provides 51.000 sqm leasable area for its more than 400 tenants, and attracts 20 million visitors per year. 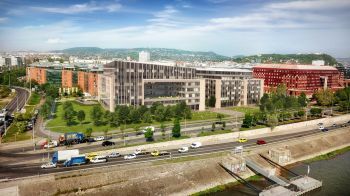 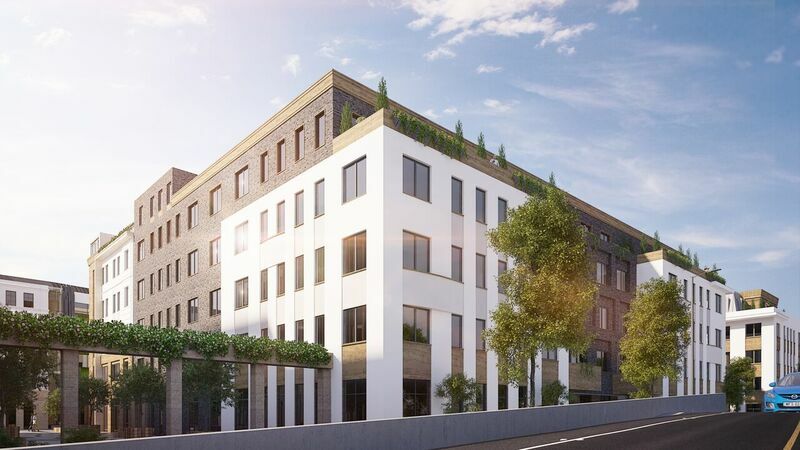 A unique investment opportunity to develop a 3* business hotel in Budapest, ideally located within 200 metres of the planned new Budapest Congress Centre. 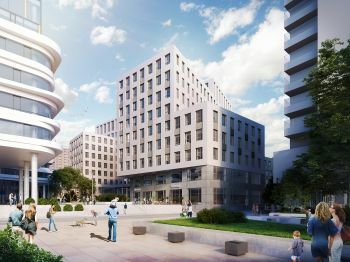 The future hotel is located close to several important cultural sites, such as the Hungarian National Theatre and the Palace of Arts. 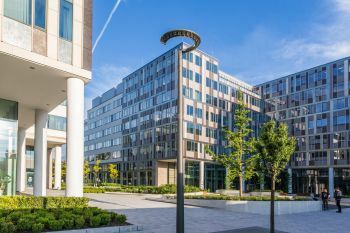 Several office complexes have been built in the neighbourhood with major international tenants such as Morgan Stanley, Vodafone, IBM and Nestlé. 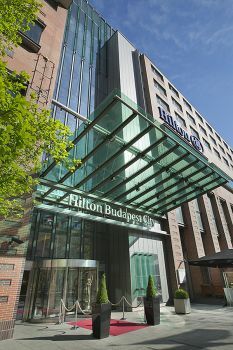 The contemporary and state-of-the-art designed Hilton Budapest City is part of the mix-used WestEnd City Centre and an important asset to the extended business district around. 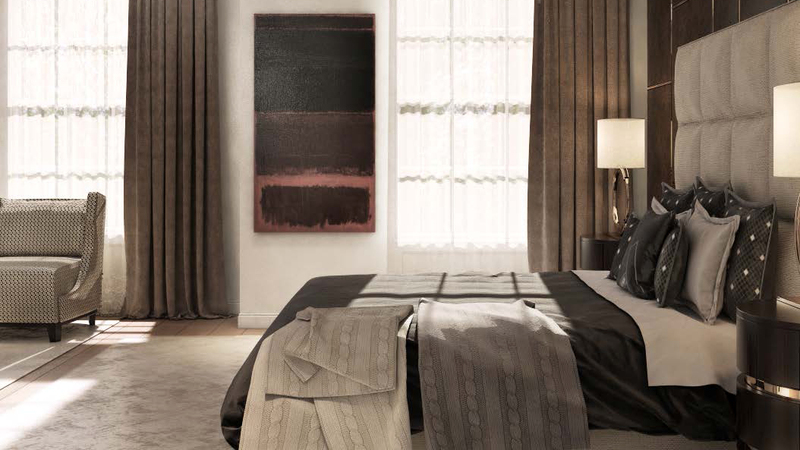 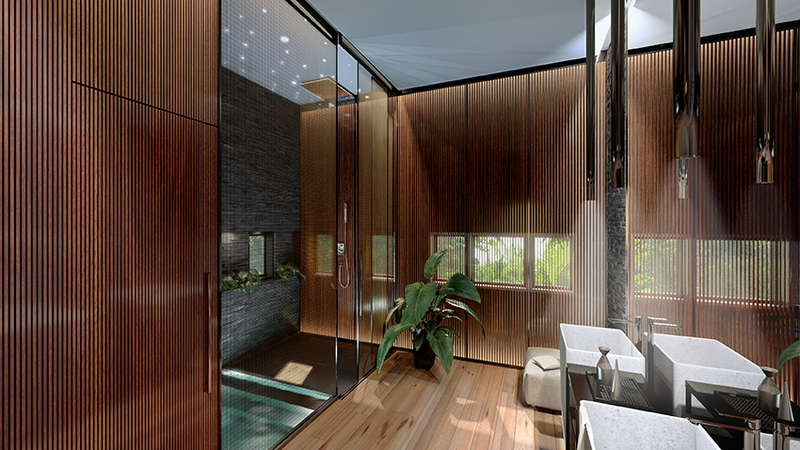 230 spacious guest rooms and suites with separate shower and bathtub are designed with comfort and convenience in mind. 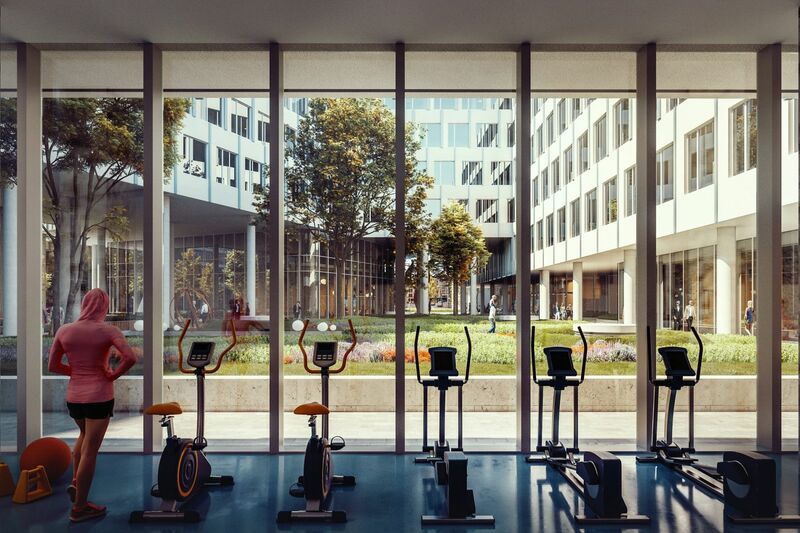 Various types of rooms and amenities, as well as a Gym with gorgeous view on the city makes the place perfect for business and leisure travellers alike. 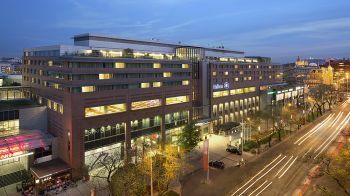 As a unique feature, the hotel boasts of the largest full service conference centre in the district with several meeting rooms, boardrooms, ballroom, restaurant and a roof garden. 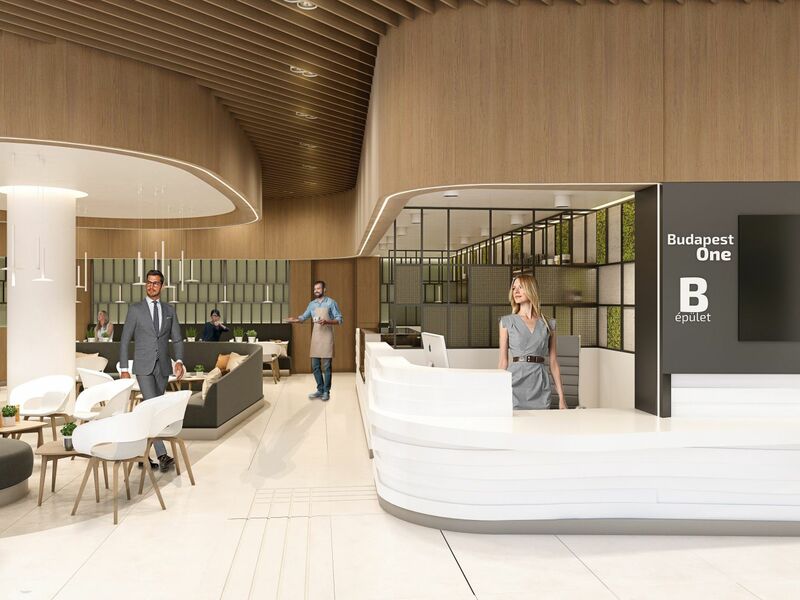 Executive floor and Executive Lounge with direct access to a separate roof garden offers exquisite services for business travellers.. 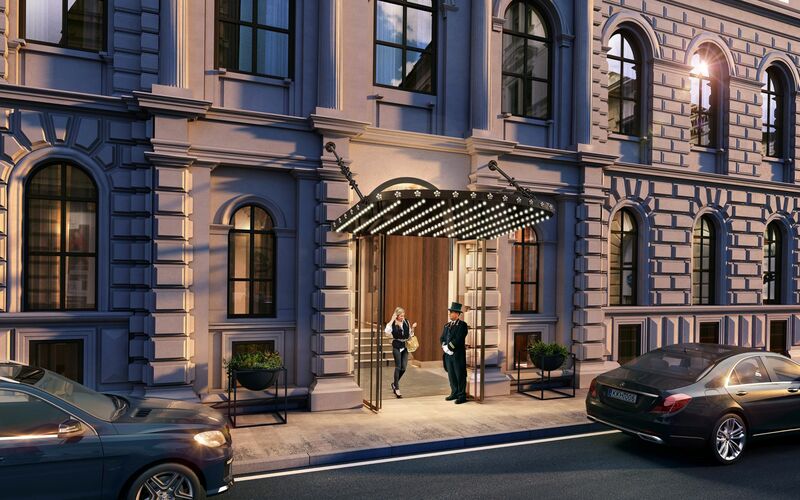 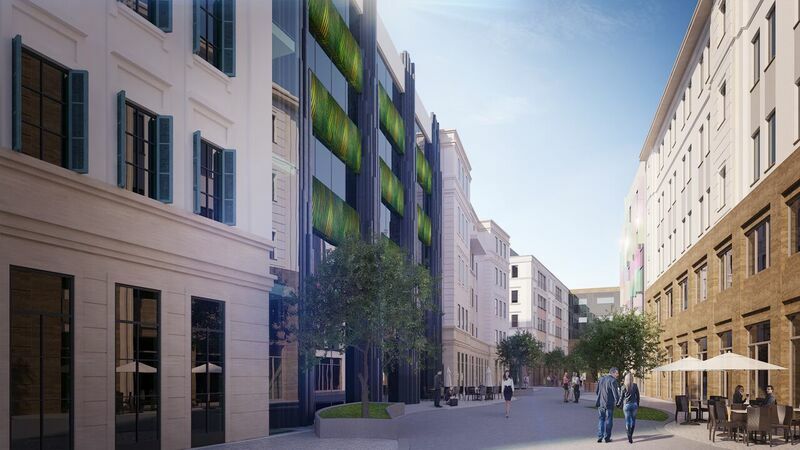 The 9.000 sqm downtown luxury lifestlyle hotel project will be brought to life by Hungarian developer Horizon Development in partnership with KKH Capital & Property, after the complete rejuvenation of the 1873 protected heritage building. 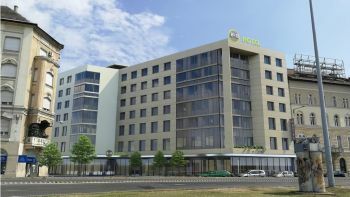 With its exquisite design concept and ideal city center location (only 300 meters from the Parliament, Kossuth Square and the river Danube), this boutique hotel will be an ultimate favorite for visitors and locals alike. 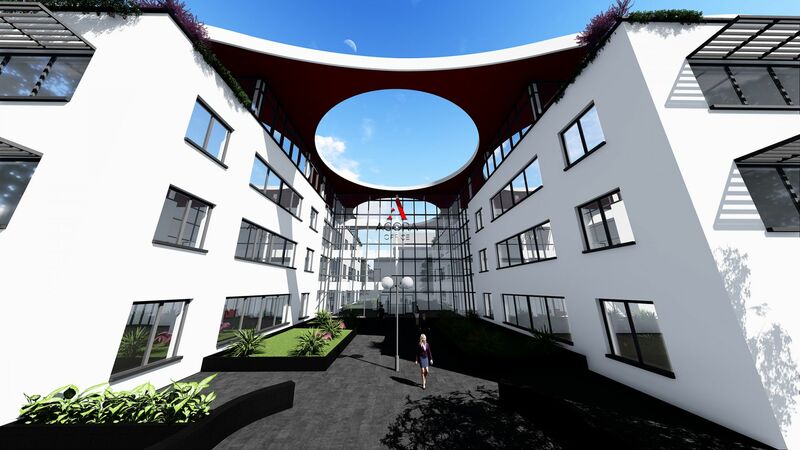 The project is a complex development programme consisting of various facilities. 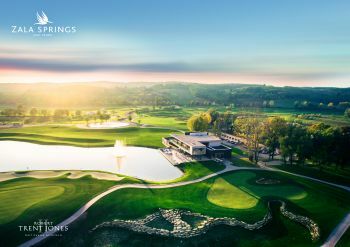 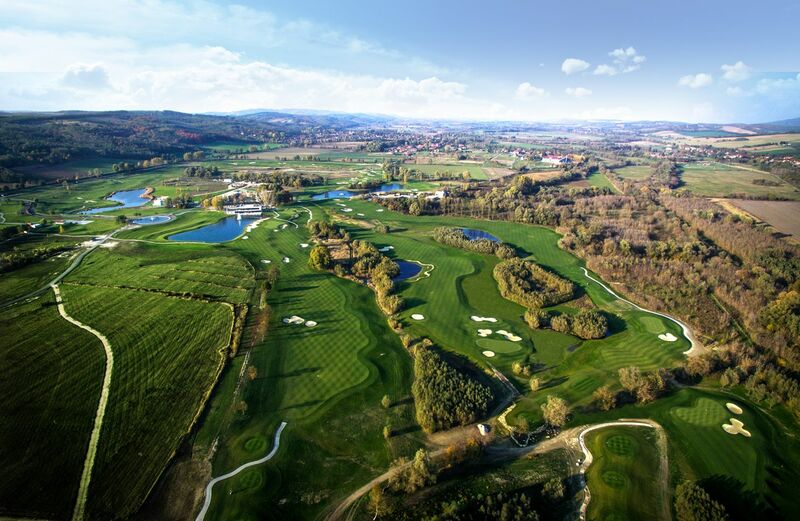 A new, luxury 5* hotel with spa, villas, apartments, and the first RTJ II golf course in Central-Eastern Europe to comply with the highest International standards, will all be constructed in Hévíz-Zalacsány. 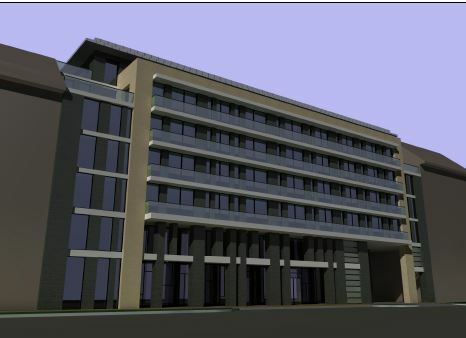 The project owner has already started part of the investment and seeks investors only for the implementation of the luxury hotel and the spa. 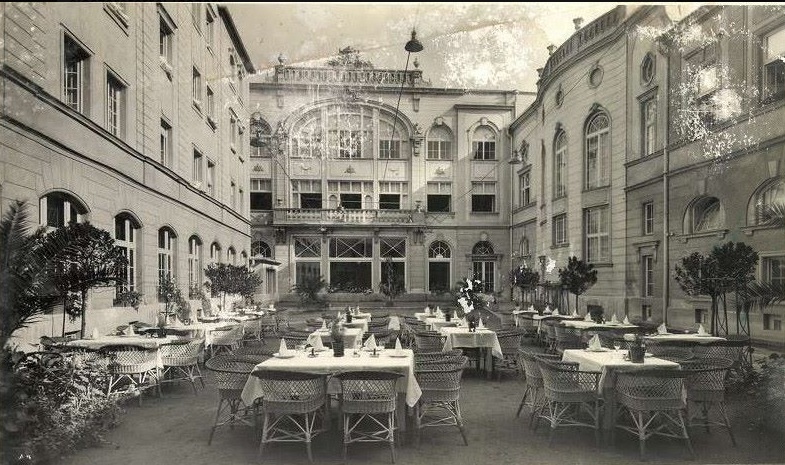 Hotel Avas that was last renovated in the 1950s is situated at the most precious point of the historic downtown of Miskolc, along Europe’s longest pedestrian street. 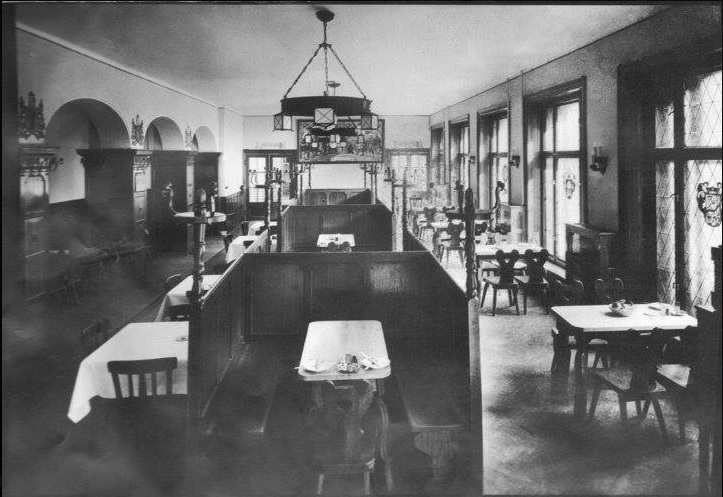 The building was once known and popular nationwide as a gastro-cultural centre and quality accommodation. The property is currently owned by the Municipality of Miskolc that is strongly committed to restore the reputation of the building by combining the expectations of modern age with traditional values. 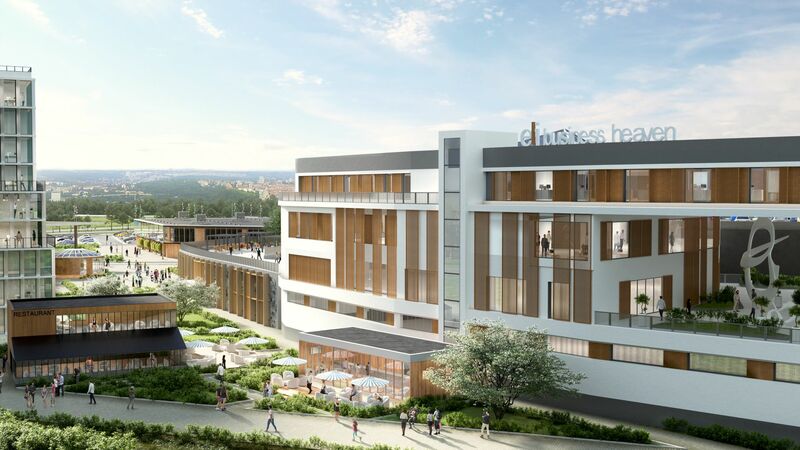 Construction and operation of two hotels, a 50-apartment medical village and a complex therapeutic and spa centre. 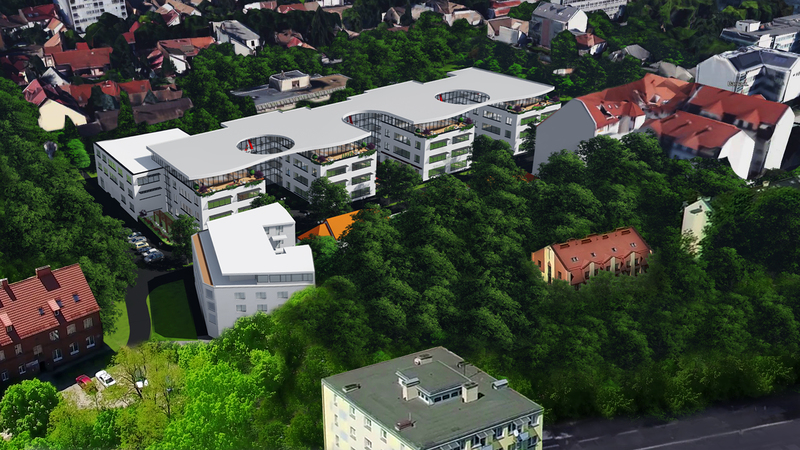 The project company was set up by private investors and is supported by the local municipality. 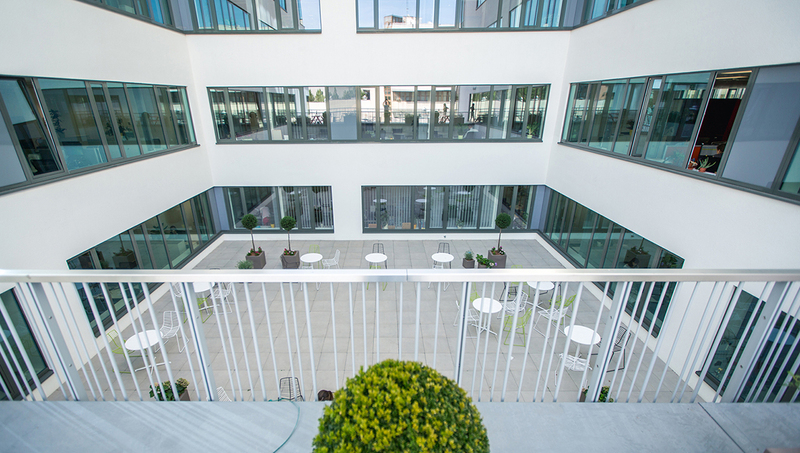 The Company provides unique services such as medical water treatments, carbonic acid gas bath therapy, hydrotherapy, electrotherapy and other local special therapies along with auxiliary medical activities. 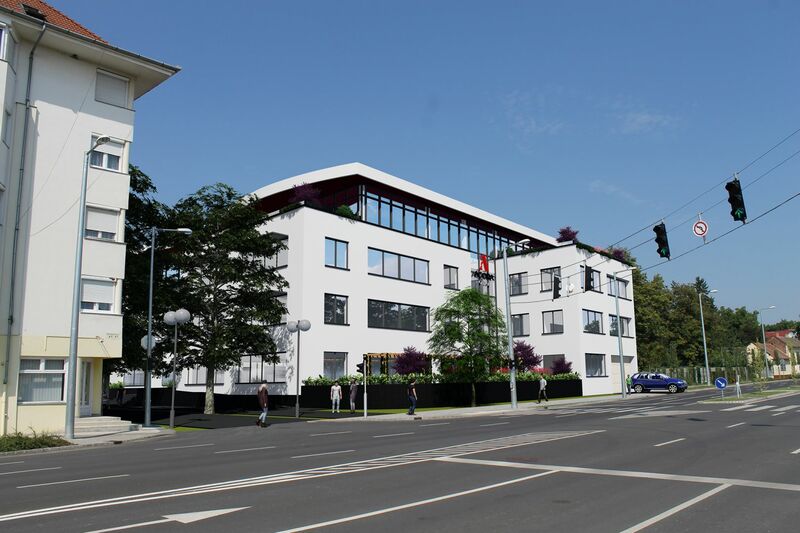 A ~37,000 sq.m development plot in Sárvár to be developed into a 100+ room 4* hotel on sale either in its present condition for € 1.99 mln. 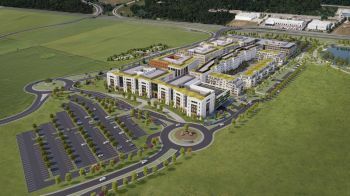 or to invest into a joint venture as part of a total ~€ 20 mln project cost. 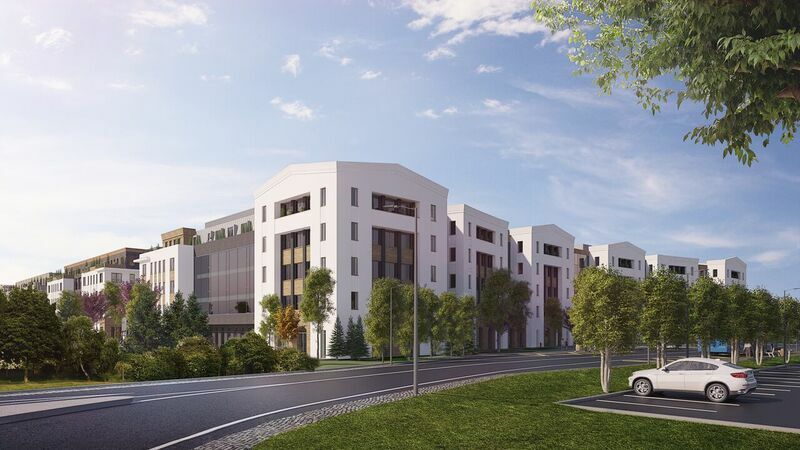 The greenfield development project is located right next to the exclusive, well- functioning 5-star Spirit Hotel (270+ rooms), and the Sárvár Adventure Park, in the immediate vicinity of Sárvár’s seven small lakes. 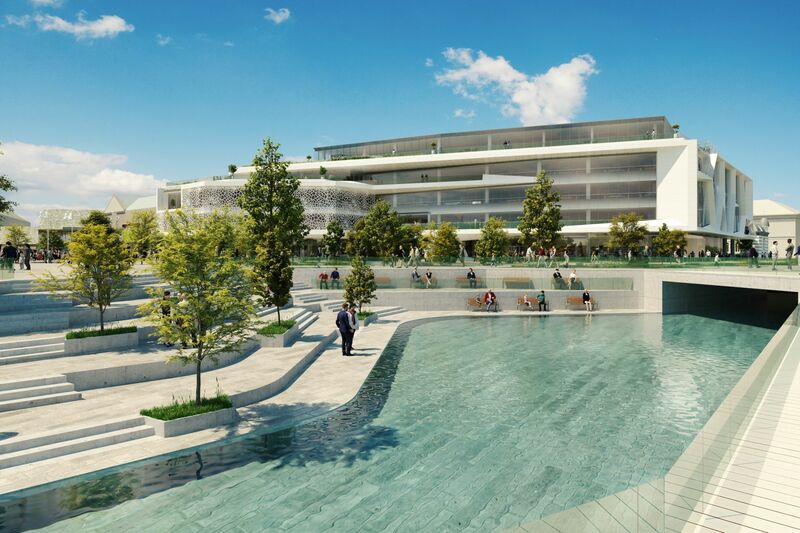 Horizon Development’s first Western European project is a luxury residential neighborhood in Nueva Andalucía, Marbella’s premium inland district. 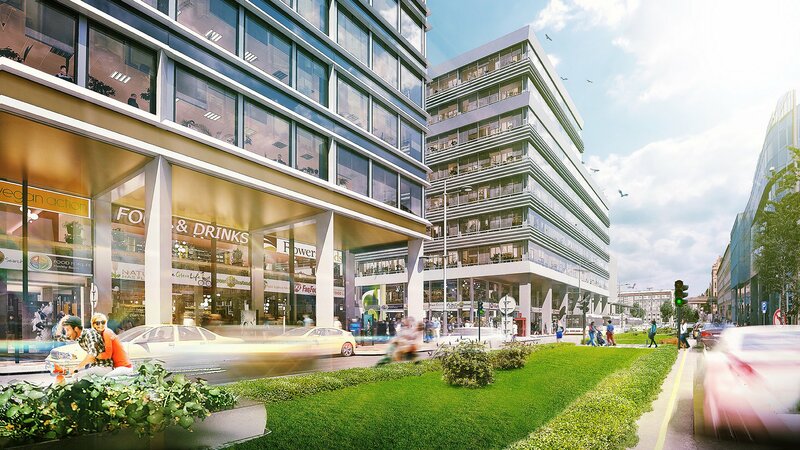 The development will feature top architectural quality (synonymous with the developer), as well as a complex service range. 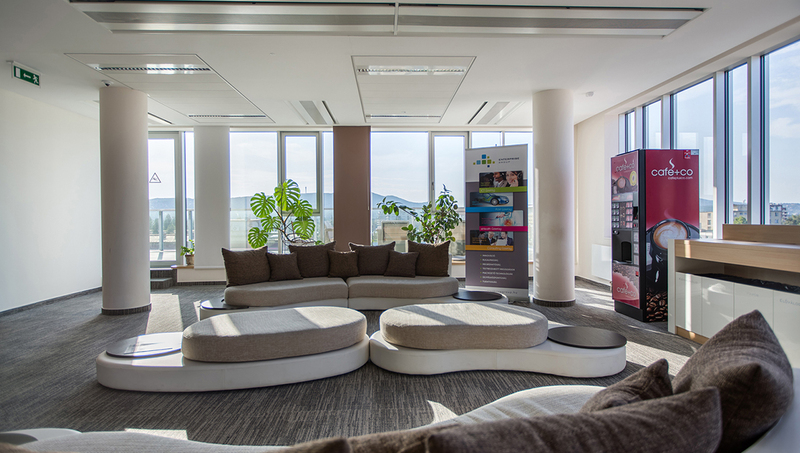 The former Angyal office building faces the Danube, has good visibility and an excellent location. 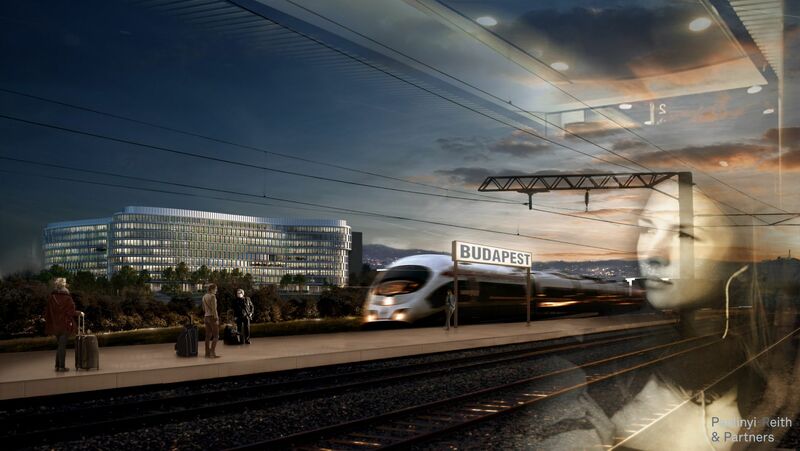 The vicinity of the downtown area, the business district and Budapest’s popular gastro-promenade, Ráday Street; the good accessibility of the area using public transport connections; and the easy reach of the motorways all make the building ideal for a future hotel. 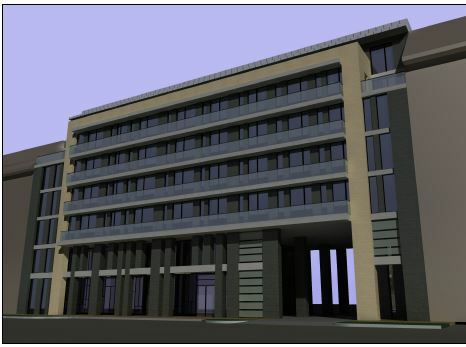 The expected handover of the hotel with 217 rooms on 9,400 sq m is Q4 2020. 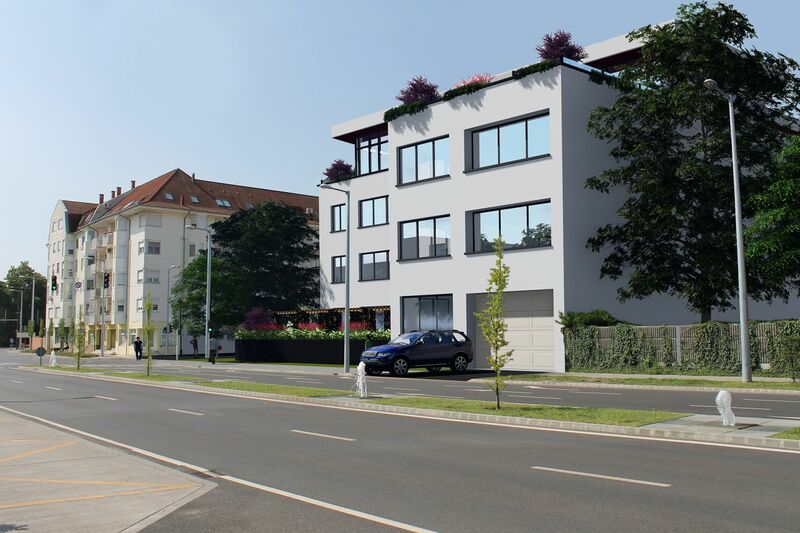 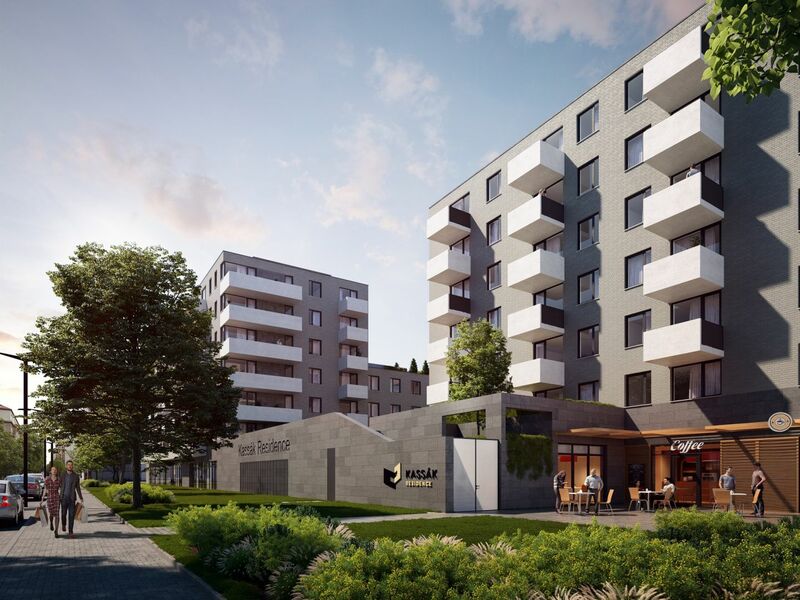 The environmentally friendly apartments of Kassák Residence near Váci Road in Budapest, offering smart solutions and a high standard of comfort, are ideal for young people pursuing an urban lifestyle, as well as buyers who appreciate the development’s location close to downtown. 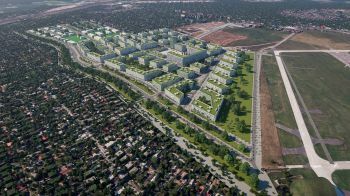 In the first phase of the approximately 700-unit project, the construction of two buildings containing a total of 230 homes got under way in the first half of 2018. 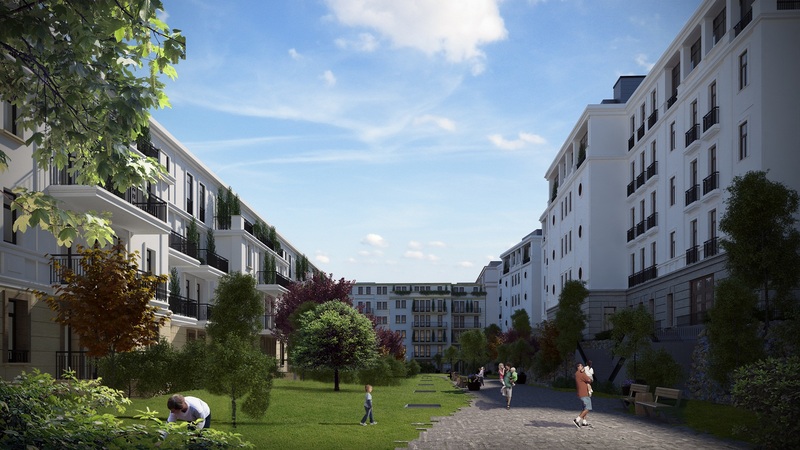 Metropolitan Garden residential project will offer top-notch homes in a modern green environment, in the centre of District 13, Budapest. 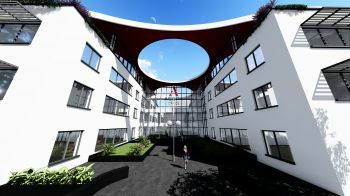 Responding to 21st century needs, the development will feature smart solutions, furthermore shared services in a unique way. 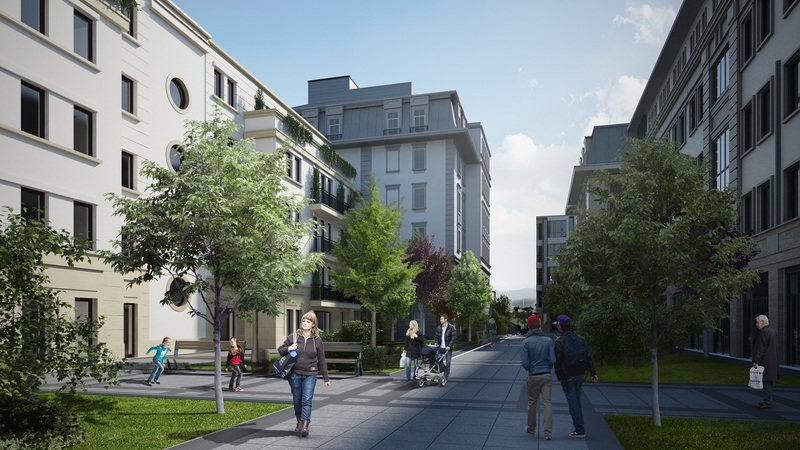 The project will include 105 apartments built in one phase. 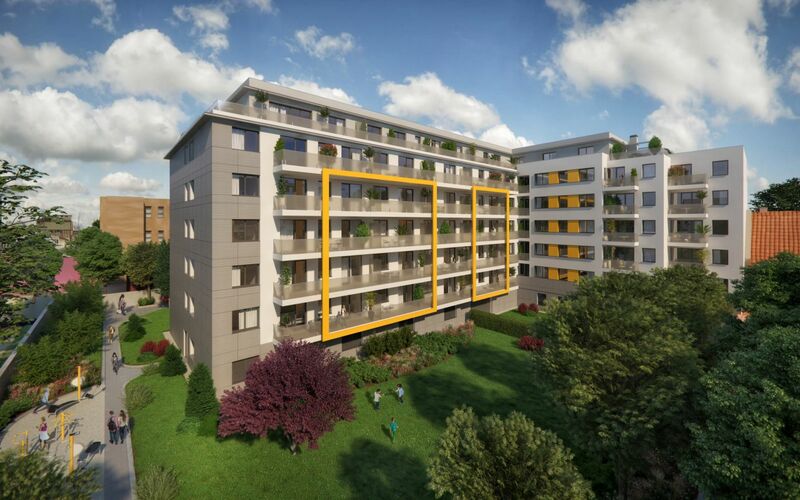 It is best suited to young people and families with little children who place a high degree of importance on being close to the city centre, having a large spectrum of services and a green environment. 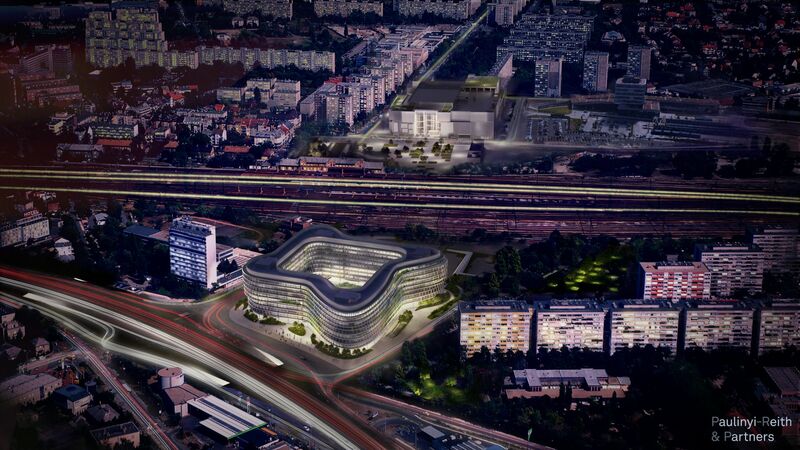 TÓPARK BE MY CITY’ multifunctional building complex is located a few kilometres from Budapest in the triangle formed by M0-M1-M7 motorways. 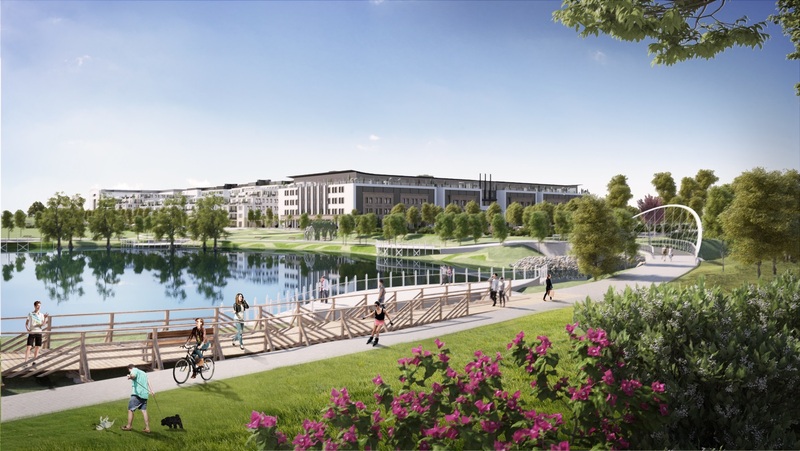 This development project has 200.000 m2 gross useful area provides services of top standards and closeness of nature experience with its 55,000 m2 office buildings, 15,000 m2 retail and service outlets and with 350 apartments having a total space of 35,000 m2, with sport and recreation facilities, with a conference hotel that offers 150-200 rooms and a conference room suitable for accomodating 800-1,000 persons, and with a green area that encompasses the project. Városliget is Budapest’s most popular park. 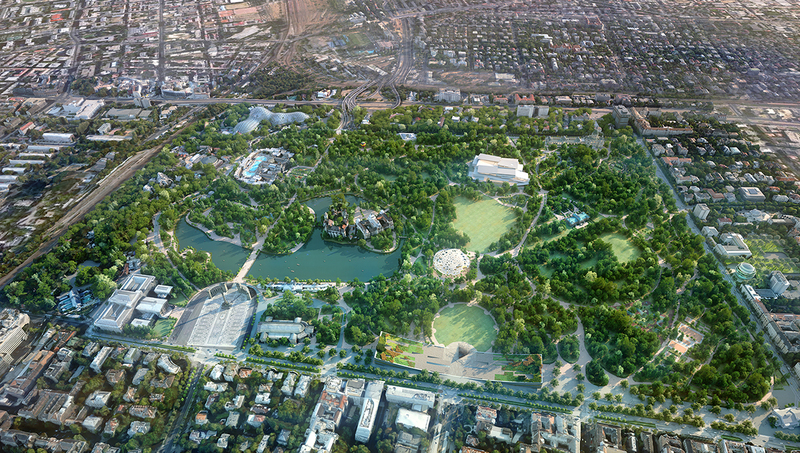 Besides being ideal for relaxation, the park is also a green oasis and home to cultural, entertainment and recreational facilities, making it unique worldwide. 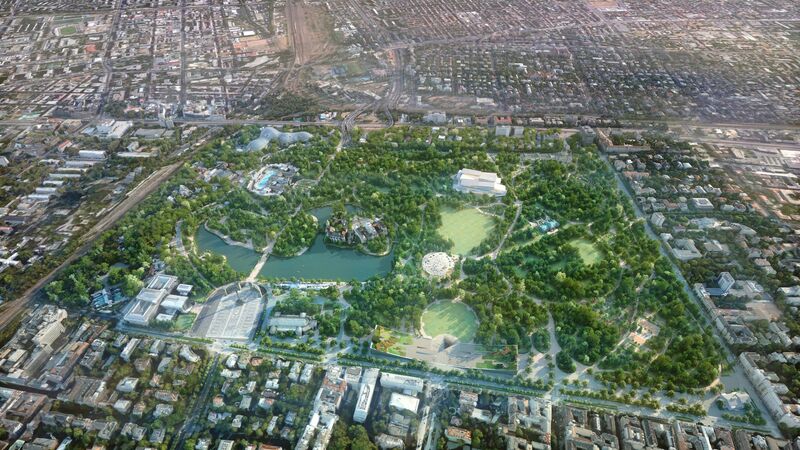 It is our objective to make the park a place for safe and carefree fun. 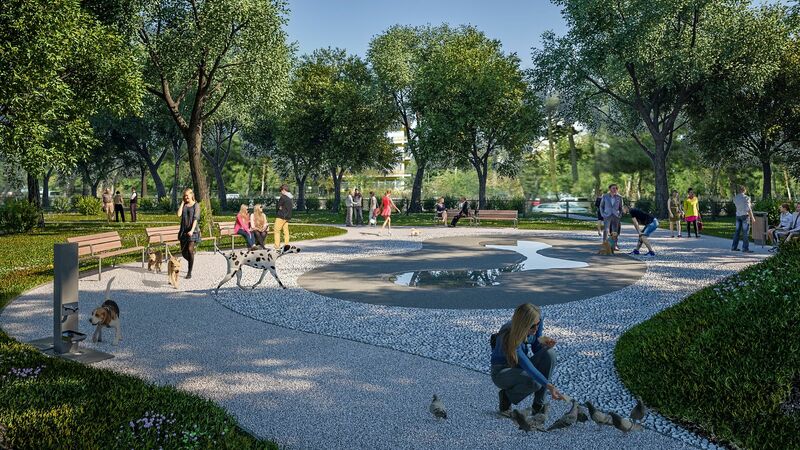 As originally envisioned, the Liget Budapest Project, aimed at the comprehensive renewal of the park, combines the largest park and landscaping undertaking ever to be implemented in Hungary with the most complex institutional development programme since the millennium. 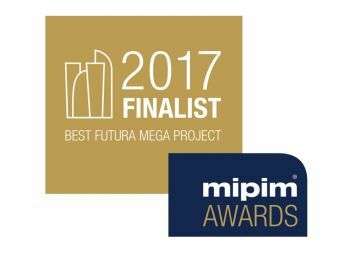 The Liget Budapest Project won the title of the EU’s best urban development project of 2017 at the prestigious MIPIM Awards. Liget Budapest made it into the top four in the Best Future Mega Project category for the largest-scale and most complex development projects: it will include the renovation of centuries-old institutions as well as the construction of new museums with the participation of both Hungarian and international star architecture offices, while rehabilitating the park’s natural treasures and significantly increasing its green area. 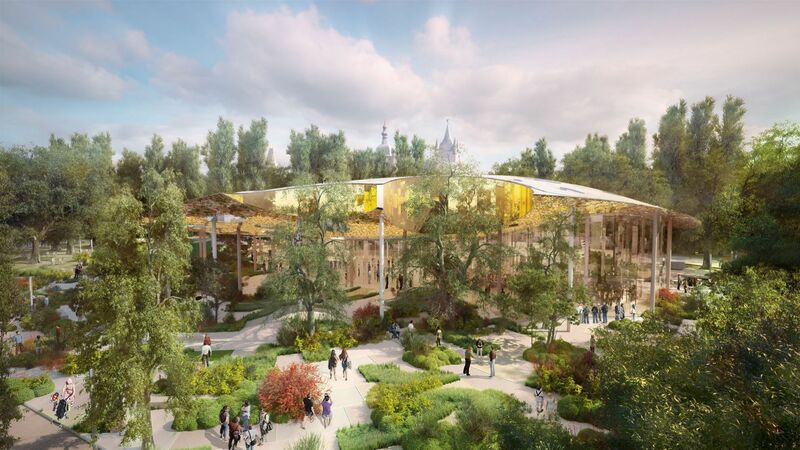 The new building of the Museum of Ethnography, to be built as part of the Liget Budapest Project, won the world’s Best Public Service Architecture prize at the Property Awards competition in 2018. 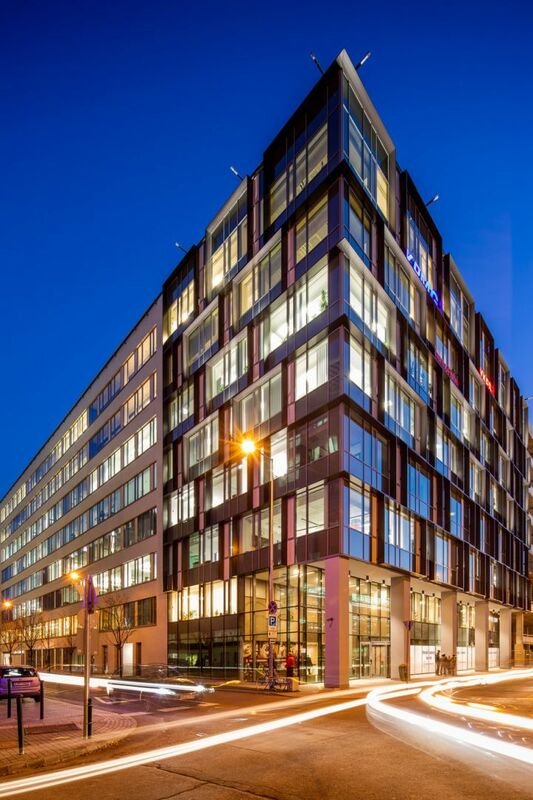 This was the first time in the twenty-five years of the International Property Awards that a Hungarian building was recognised as the best in its category. 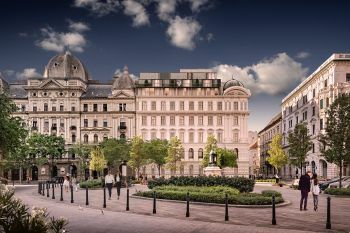 The House of Hungarian Music will present the history of music from the dawn of the human voice to modern musical trends, but will place special emphasis on Hungarian music and its diverse history. The graceful and environmentally friendly building, designed by Japanese star architect Sou Fujimoto, will provide a highly advanced venue for museum exhibitions and concerts, and is envisioned to become a true communal space with its concert and lecture halls, open-air stage, a wide range of edutainment options and an absolutely unique sound dome. 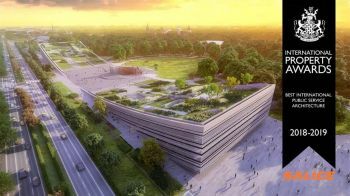 The New National Gallery, designed by the Pritzker Prize-winning SANAA Architects of Japan, will be a state-of-the-art, architecturally outstanding facility and of one of the most important Hungarian public collections that it will bring to audiences. 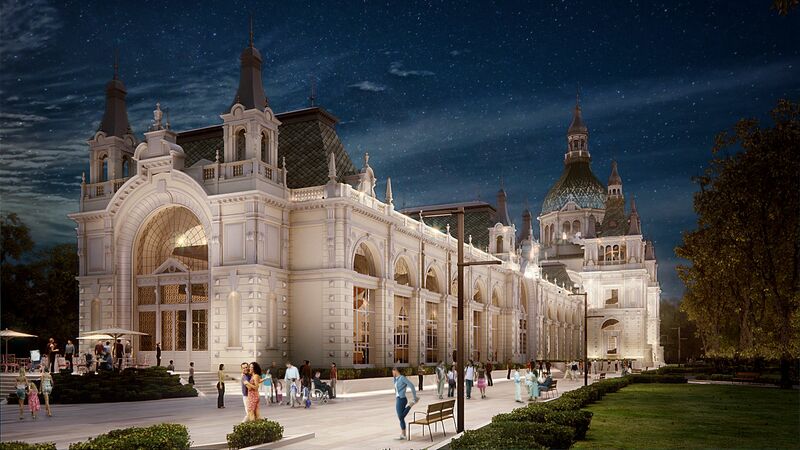 The halls of the gallery will return to tradition and exhibit the post-1800 masterpieces of Hungarian and international art together. 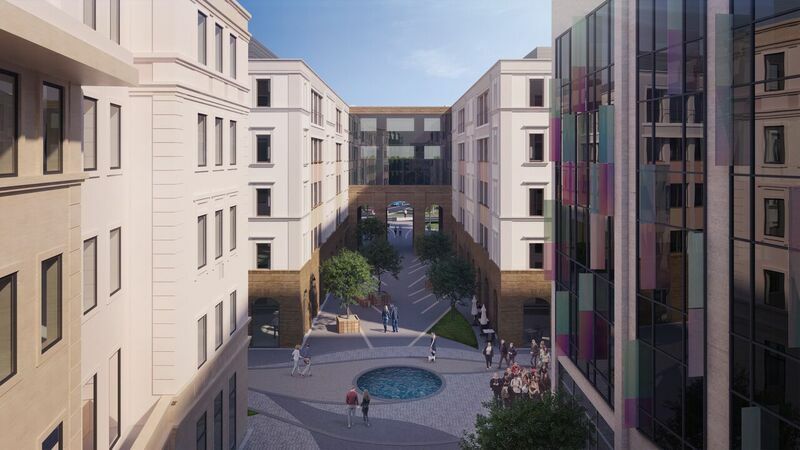 With its attractive temporary exhibitions and cultural events, the gallery will be an exciting venue in the life of 21st-century Hungarian and European art. 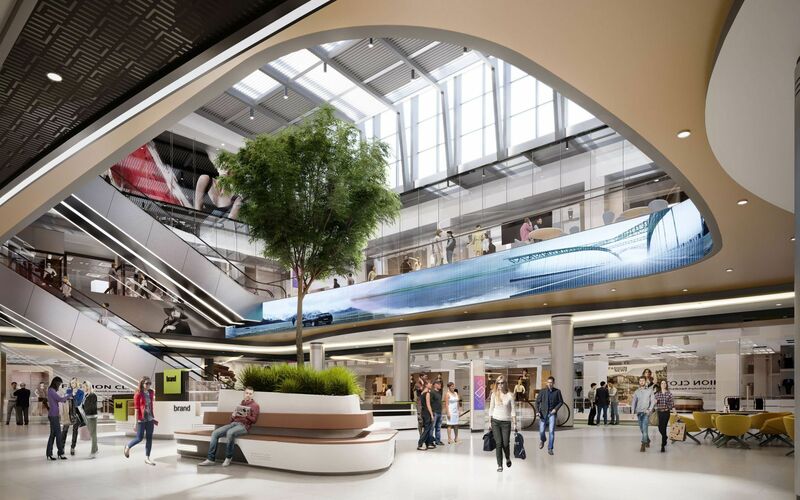 The Transport Museum will be reinvented at a conceptional level: its unrivalled collection will be displayed in two exhibition venues which will meet 21st-century requirements. 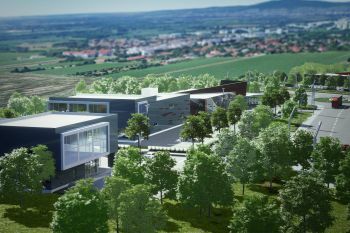 The Városliget building will be rebuilt according to its original design by Mérték Architecture Studio, and will house an interactive show devoted to Hungarian technical inventions and innovations, while the almost 120-year-old transportation museum will be moved into a new facility and will be realised as a brownfield development outside Városliget. 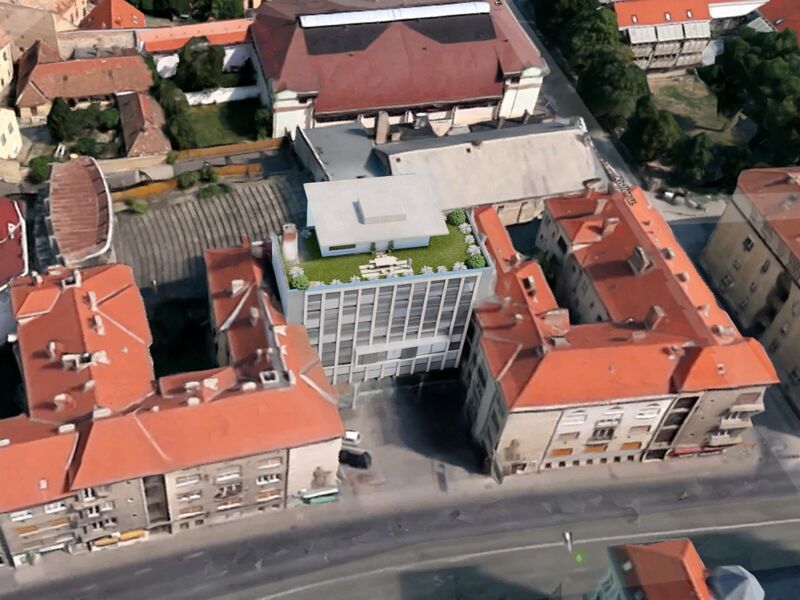 After more than sixty years without one, Városliget will once again have a theatre. 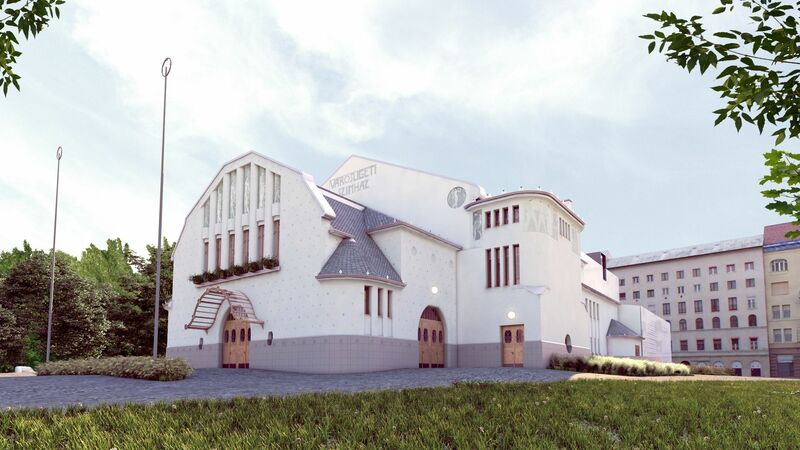 The theatre will be rebuilt based on the former Secessionist design, but will operate in a modern environment. 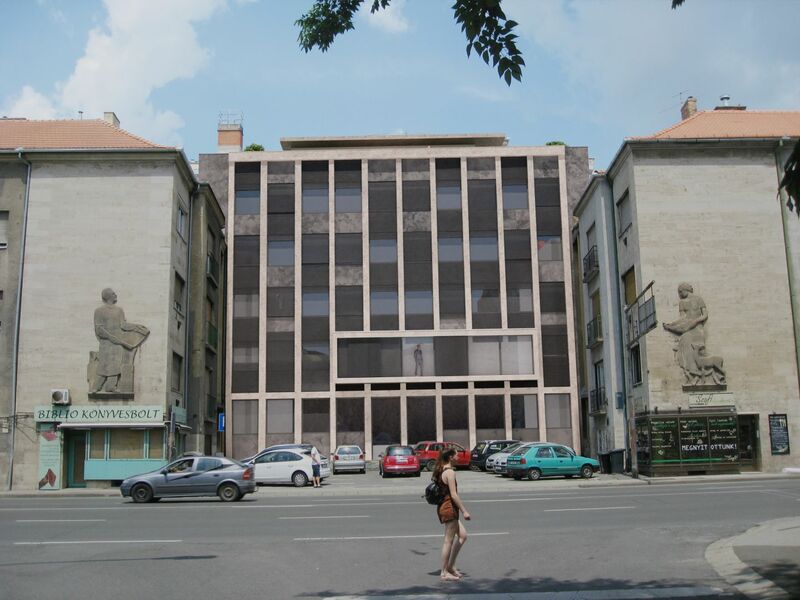 The old-new Városliget Theatre will be more than just a theatre: it will be a children’s venue with an exterior to evoke the former building - since demolished - and its interior equipped with state of the art technology. 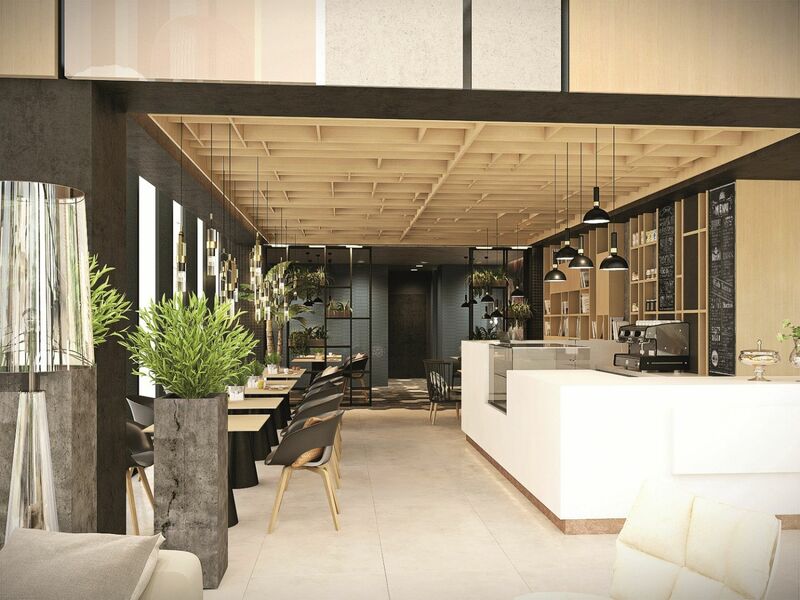 Functioning as a genuine ’house for children’, it will attract the public with a wide range of family events in an inviting environment. The National Museum Restoration and Storage Centre will store and maintain artwork from the Museum of Ethnography, the Museum of Fine Arts and the Hungarian National Gallery. 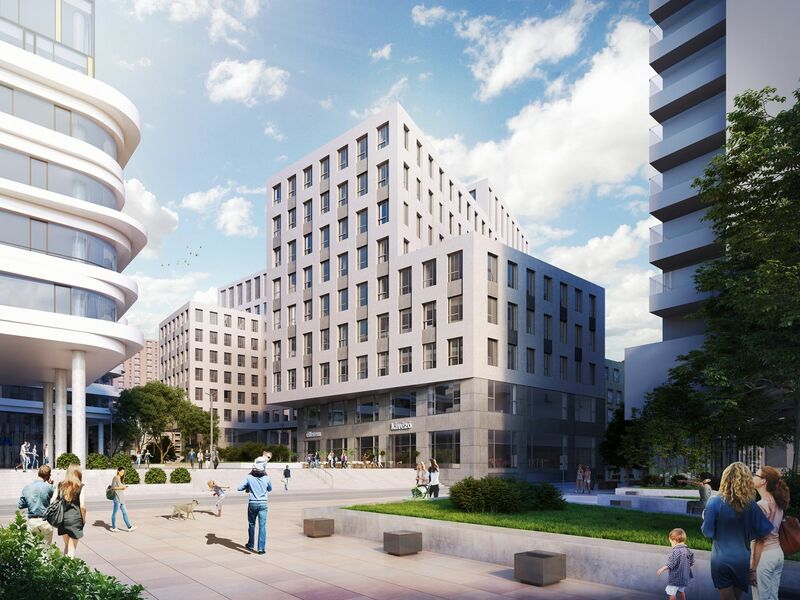 The building complex will be constructed near Városliget according to the design of Narmer Architecture Studio. 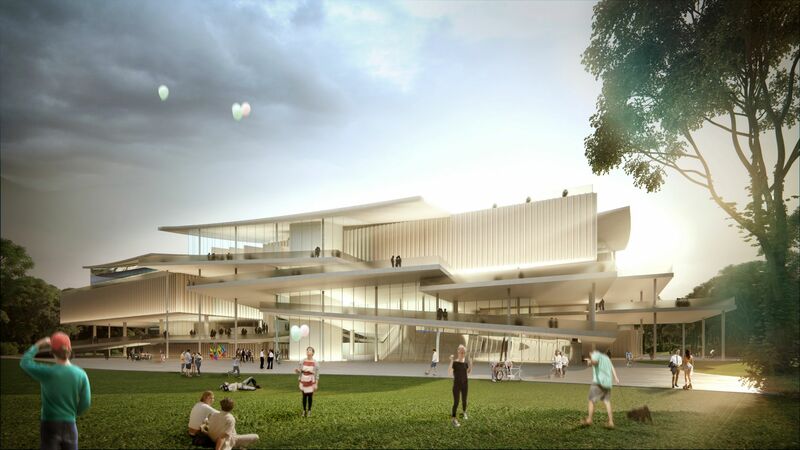 It will also house a brand new institution, called the Central European Research Institute for Art History. A park of 13,000 square metres available for use to all will also be built in connection with the project. 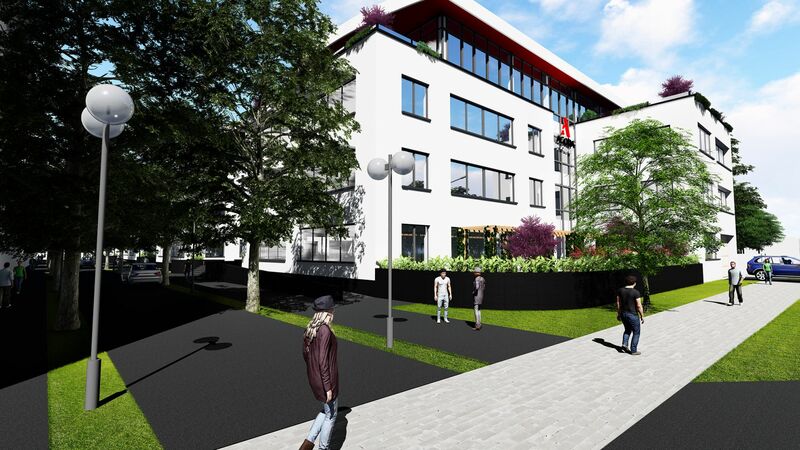 The long-awaited reconstruction of the Olof Palme House will finally become a reality. 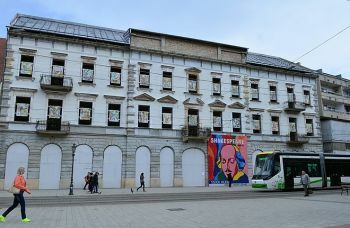 The Neo-Renaissance building in the heart of the park has a floor space of 1,100 square meters and is now in a poor state of repair. 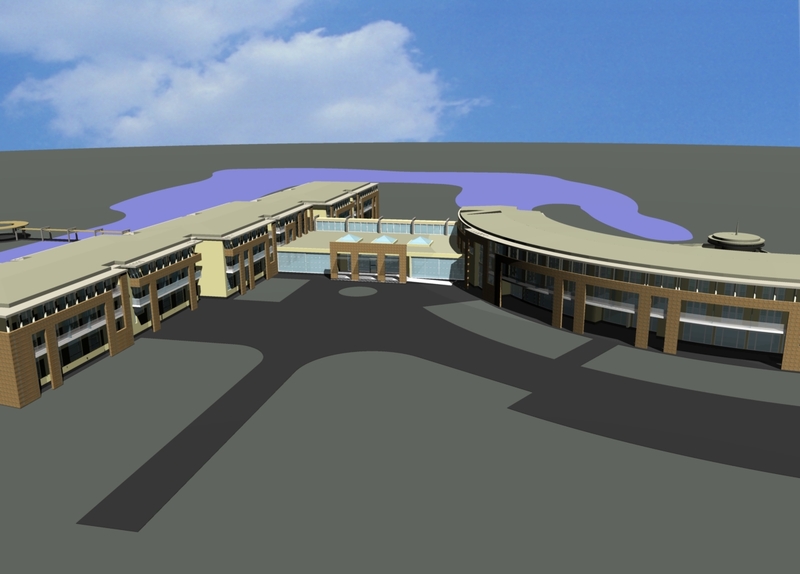 After its renovation, it will be assigned the cultural and hospitality function that it had in the past. 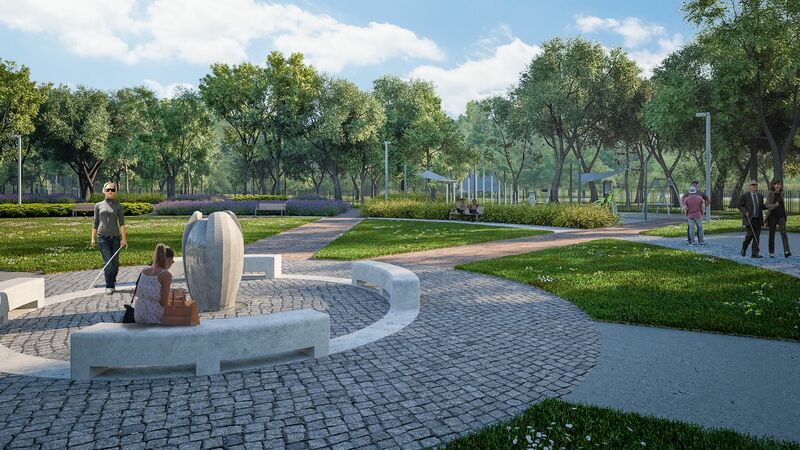 Its original Zsolnay porcelain decorations will also be restored; moreover, the landscape design plans contain a 2,500-square-meter rose garden with benches and colourful plant placements. 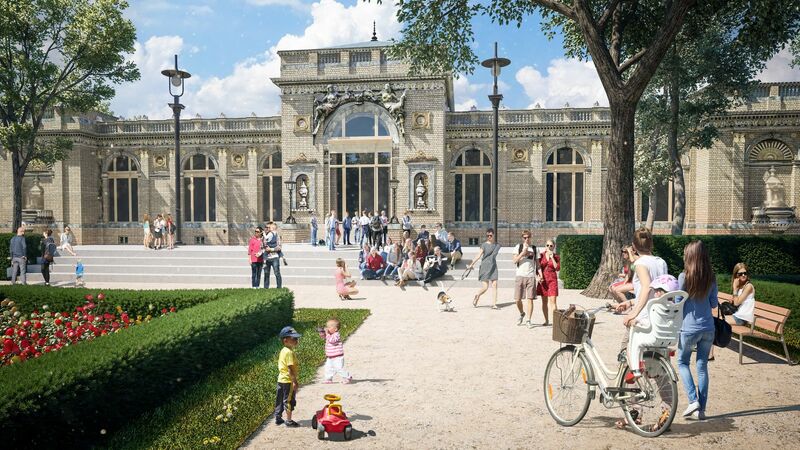 The first visible manifestations of the Liget Budapest project are the three new pavilions built according to original designs made in the Oriental style by Frigyes Feszl which replaced the obsolete row of stands that once lined the Állatkert Boulevard. 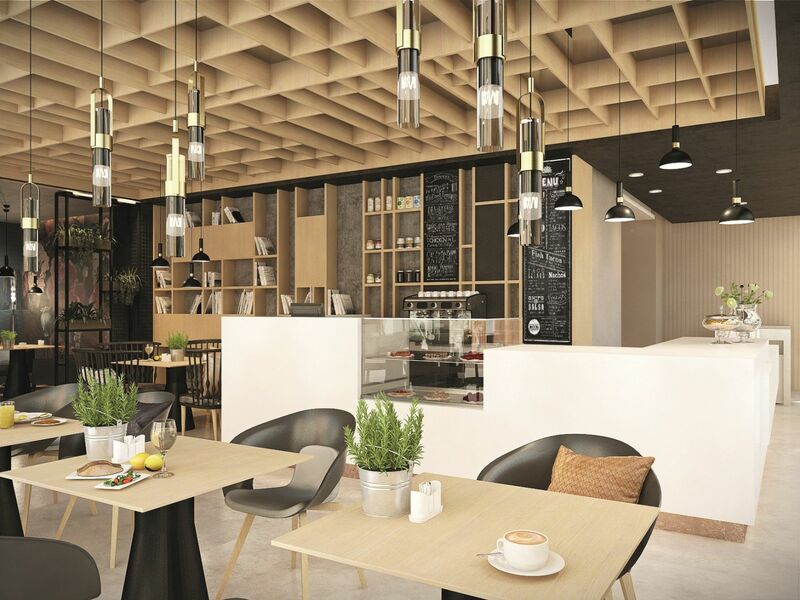 The new buildings house atmospheric cafés, art and gift shops, thus preserving the Liget’s gastronomic and commercial functions. 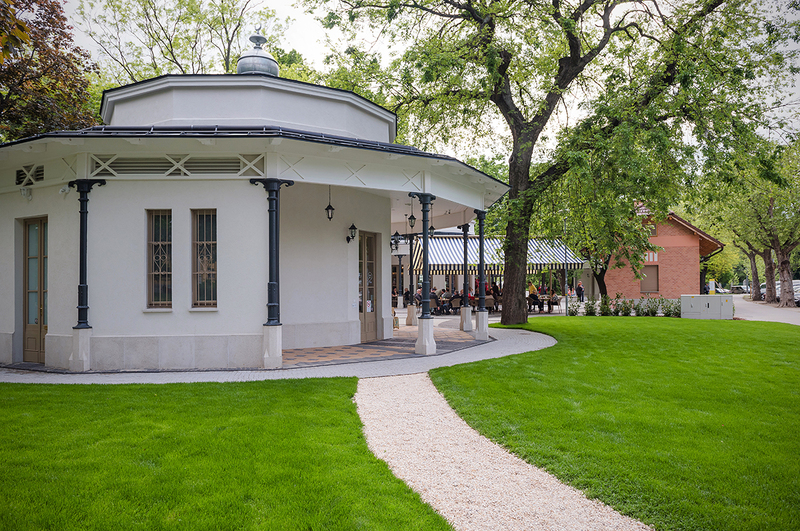 One of the oldest surviving buildings of the Liget, the former station of the predecessor of the Budapest Transport Company, has also been renovated; it will operate as a dining facility. 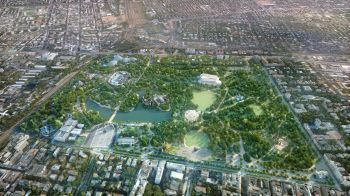 The large-scale expansion of the Zoo will include Pannon Park, which will present the ancient flora and fauna of the Carpathian Basin on some 5 hectares. 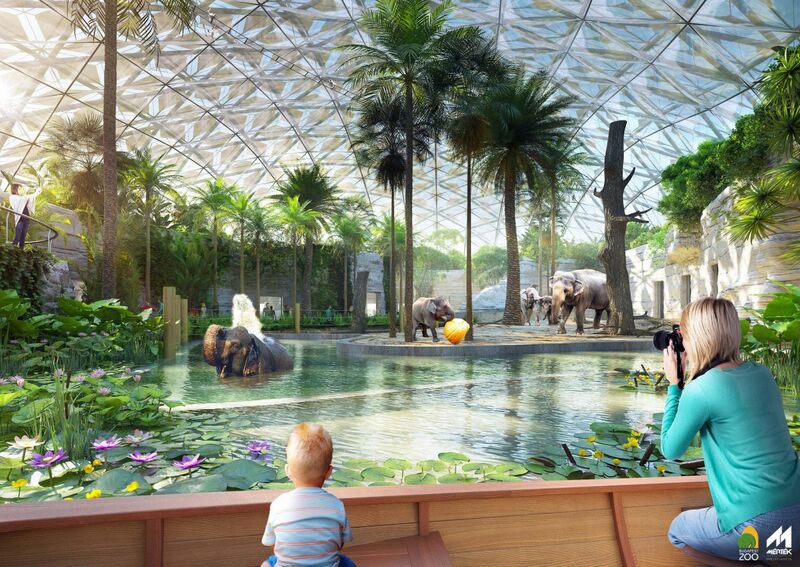 The central element of this will be the Biodome, designed by the Mérték Architecture Studio. The green area covering the exterior of the vast hall will make it resemble a grassy slope with vast glass surfaces, while its interior will attract visitors with its lush vegetation and diverse fauna. 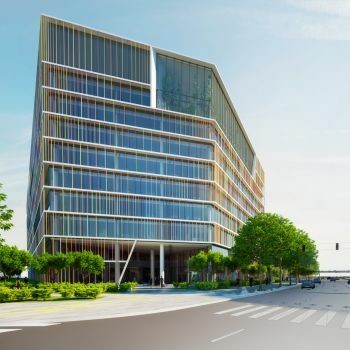 The building will be complemented by open-air runways as well as a state-of-the-art marine aquarium. 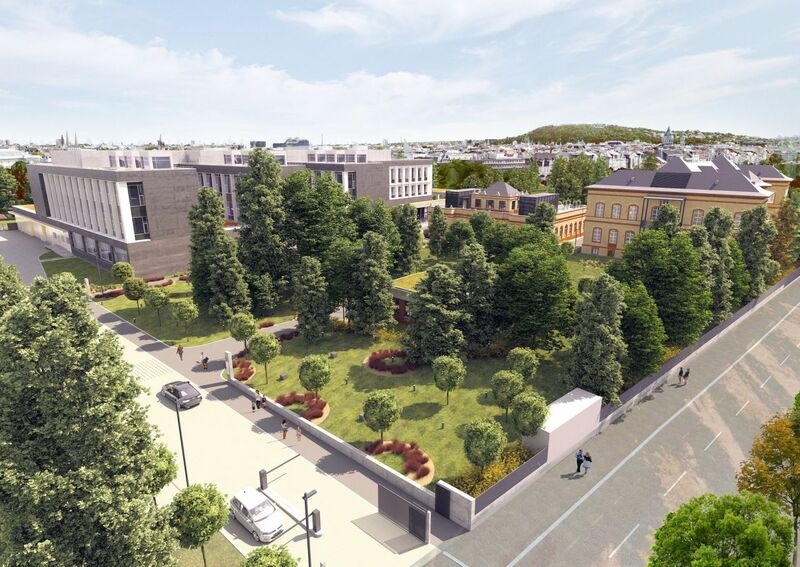 As a result of the complex development of Városliget, the plants of the park will be completely rejuvenated and their quantity significantly expanded. The garden for the blind will be renewed, along with the rondo and the small botanical garden. 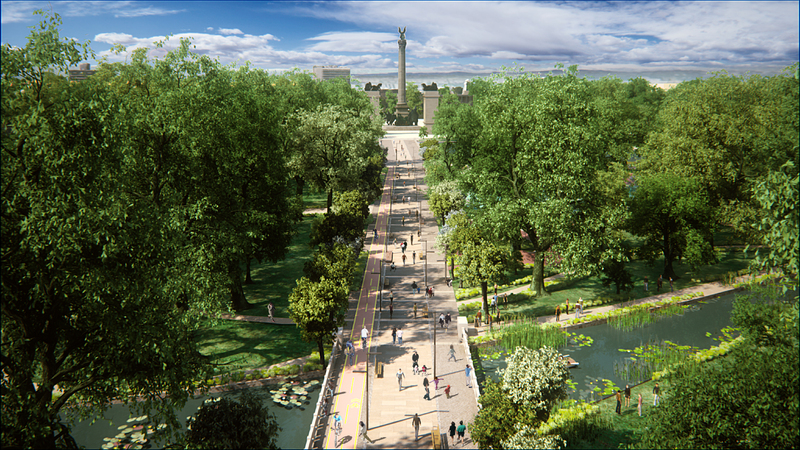 Through-traffic will cease in the Liget bringing more fresh air to the flora and the fauna while reducing noise and air pollution. 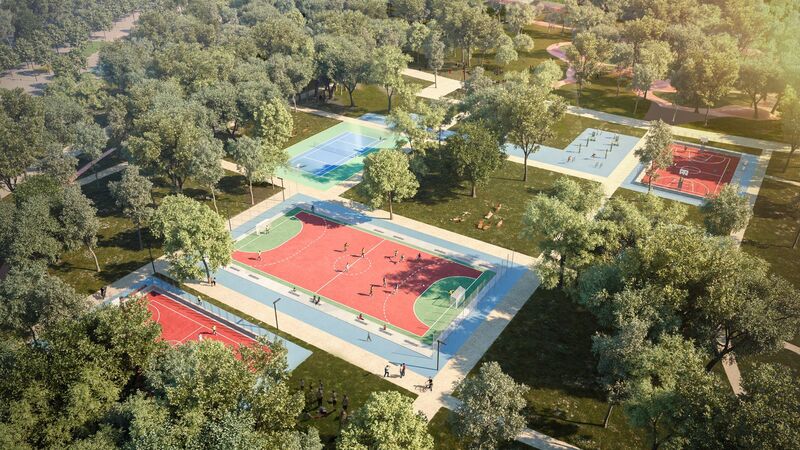 Visitors will be able to enjoy new sport, recreational and dining facilities. 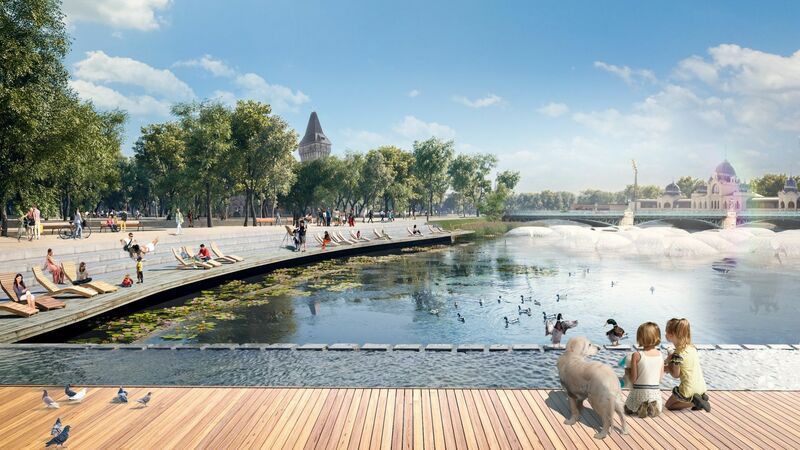 The surface of Városliget Lake will be increased nearly sixfold and the park will be made fully wheelchair accessible. 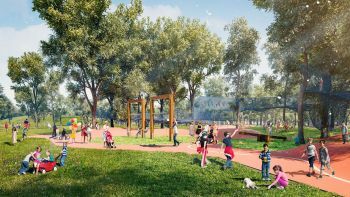 The Liget Budapest Project will include the construction of a child-friendly space where every child will find the most fun and interesting activities possible. 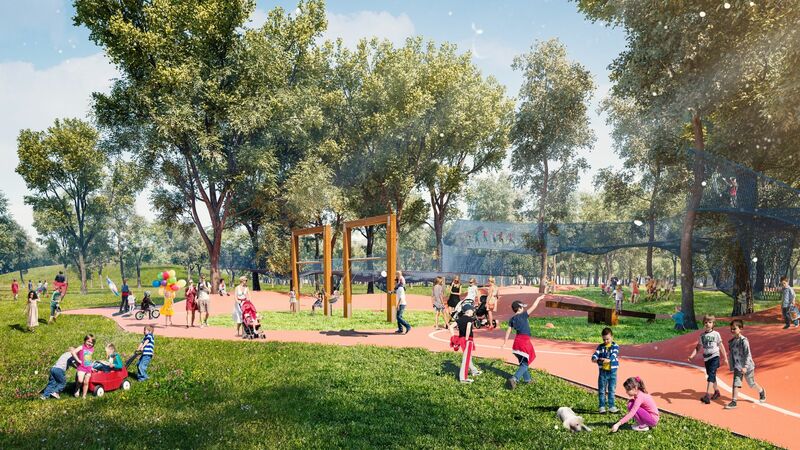 The playgrounds and community spaces will be designed to educate young people about environmental protection, to enhance a positive attitude toward nature, and to develop their social sensitivity. 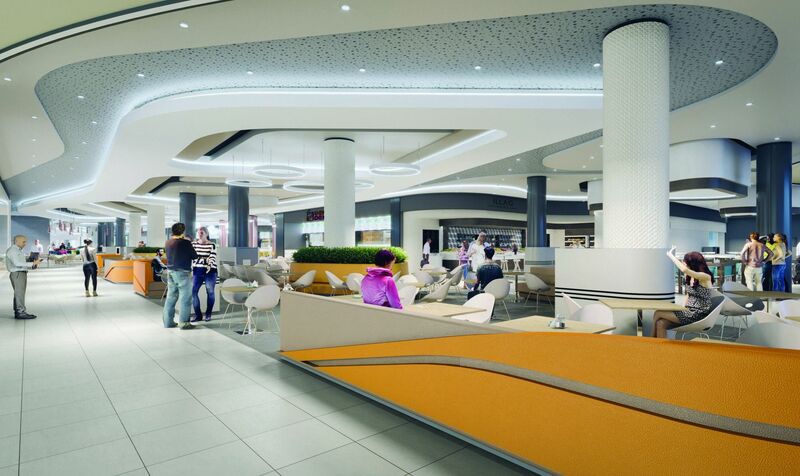 The Liget will provide children with a safe and clean environment, guaranteeing worry-free entertainment. Most people associate Városliget primarily with its lake, which is one of the most favoured locations enjoyed by visitors to the park. 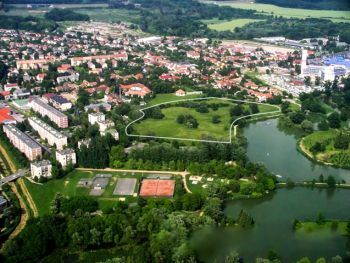 That is why the lake will be restored in order to create a significantly increased water surface and to adorn Városliget all year round. After its renewal, the lake will have a water surface six times larger than its present size and will embrace the Széchenyi Island and the rehabilitated Páva (Peacock) Island, and will feature its own flora and fauna. 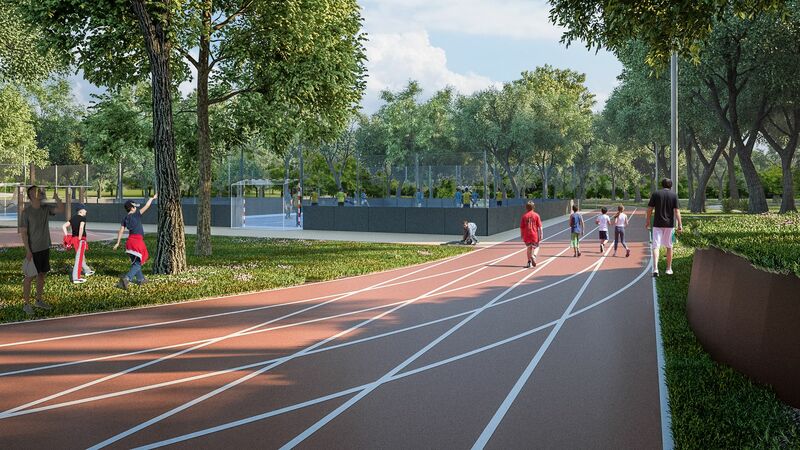 Városliget attracts many sports enthusiasts, for whom a two-kilometre-long circular running track will be constructed, in addition to sport courts and popular open-air workout machines. 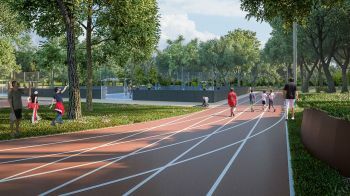 The sports grounds will be surfaced with modern artificial grass and soft court covering, while outdoor fitness facilities will be available in addition to ball games. 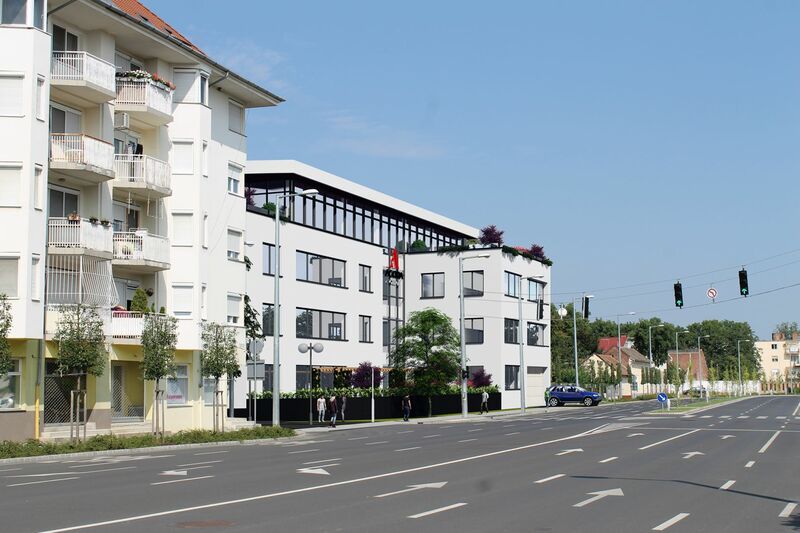 All newly constructed roads will be suitable for cycling. 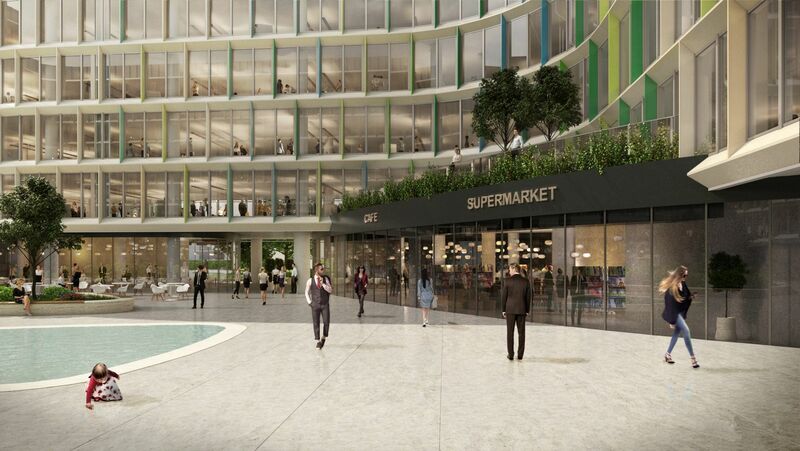 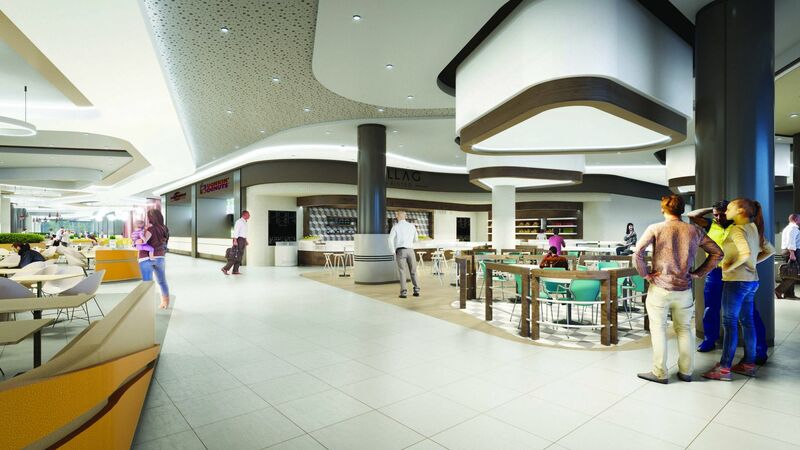 Convenience facilities will include changing rooms, showers and drinking fountains. 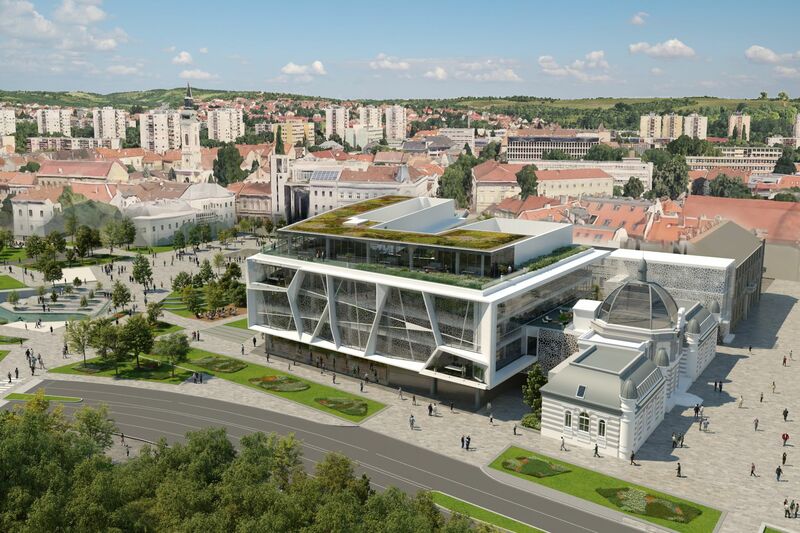 The long awaited renovation of the Museum of Fine Arts is completed and the building was re-opened in October, 2018, more 100.000 visitors was registered ever since. 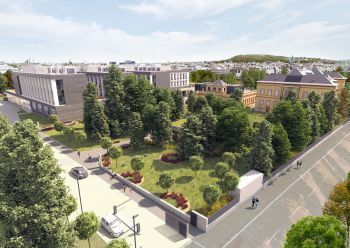 The comprehensive reconstruction of the institution is simultaneously aimed at the restoration of the building’s historic values and at the modernisation of its technological and operational systems to meet 21st-century requirements. 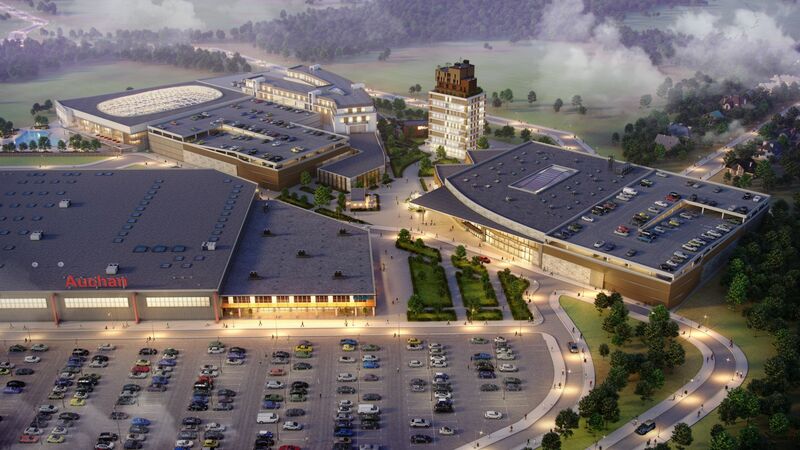 Papp László Budapest SportAréna is Hungary’s largest event hall, attracting over 700.000 visitors annually. 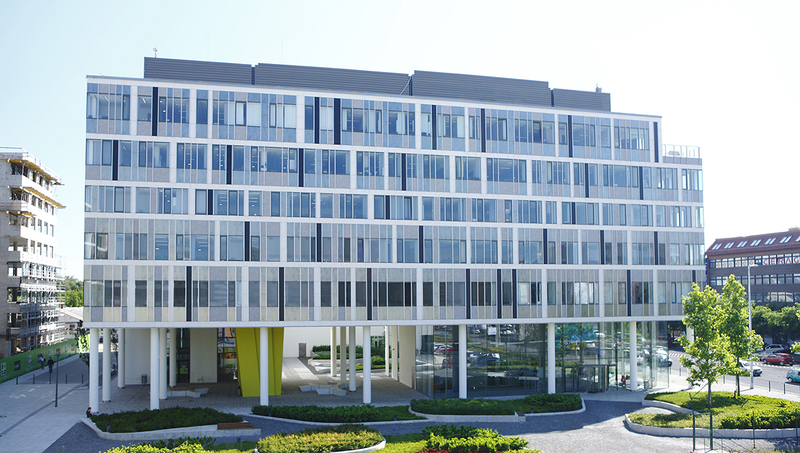 As a multifunctional venue, it is suitable for concerts, sport events, expos and conferences as well. The house’s advanced technical equipment and experienced managerial staff helps event organizers to make their event a complete success. It is one of the capital city’s genuine landmarks. 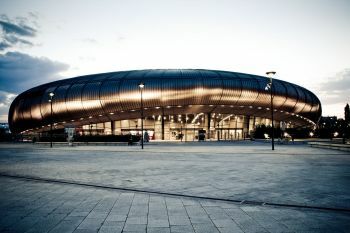 Along with the distinctive pebble shape the gigantic granite surface in front of the Arena provides a unique sight of the complex. 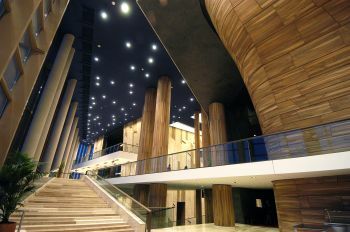 The Palace of Arts is the leading and most modern cultural development of the region hosting more than 800 performances and 500.000 visitors per season. The unmatched building complex houses Ludvid Museum, the Festival Theatre and the National Concert Hall. 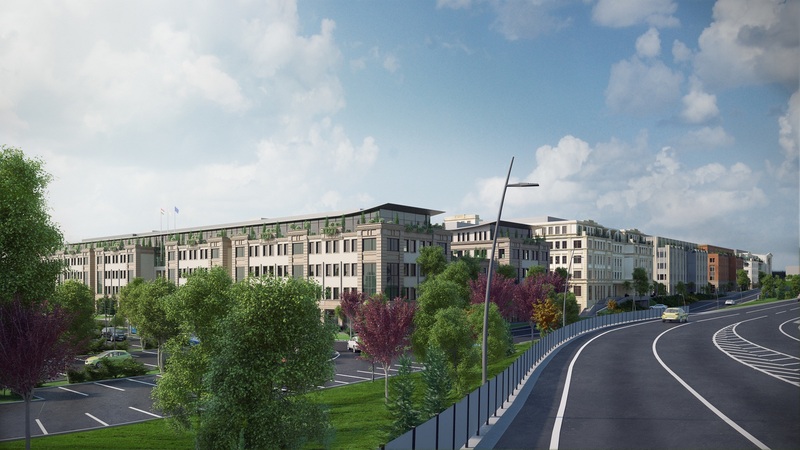 It was built through a public private partnership (PPP) with the Hungarian Government and it is the first PPP of its kind in Central Europe.